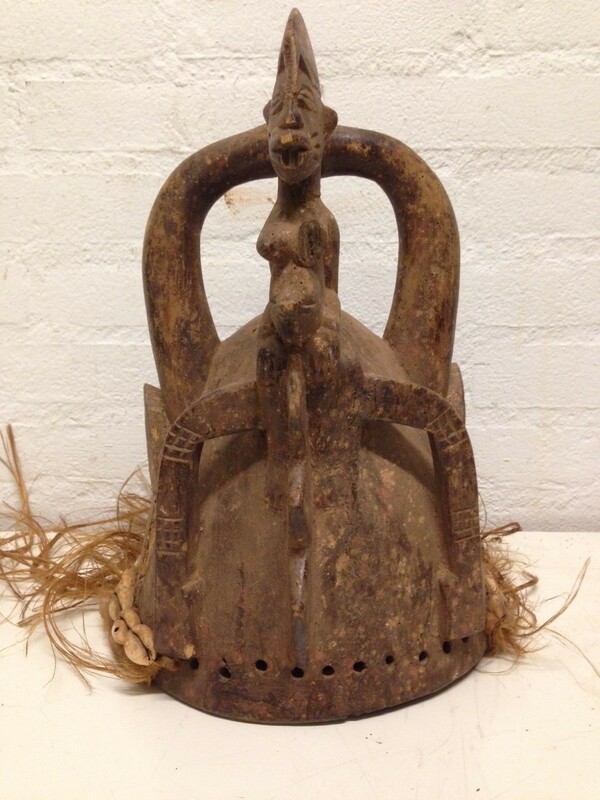 181042 - Old Tribal Used African Mask from the Dan Guere - Liberia. 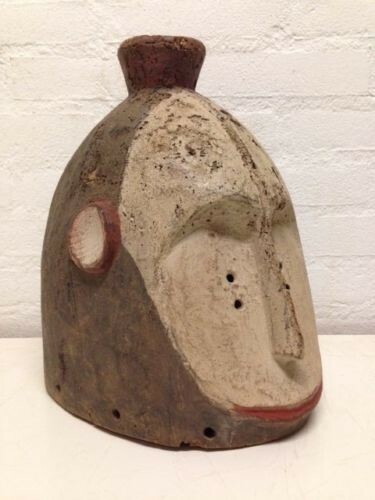 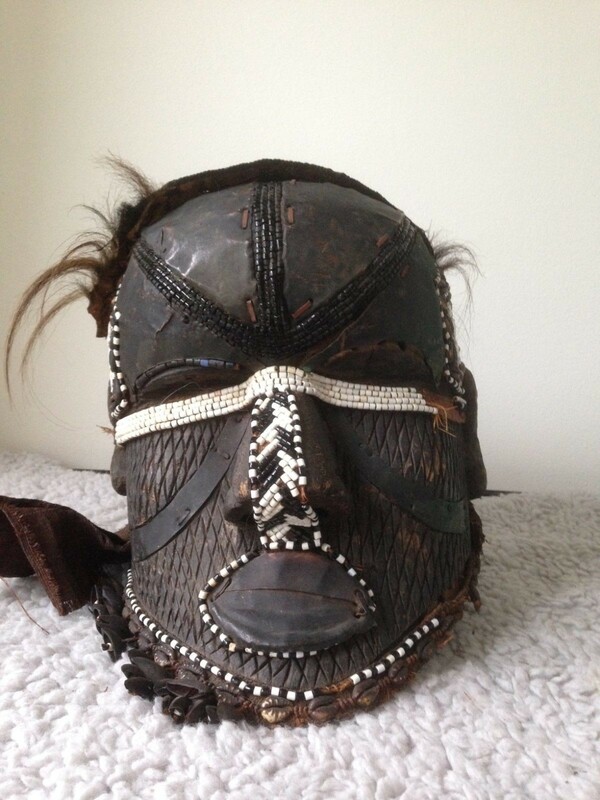 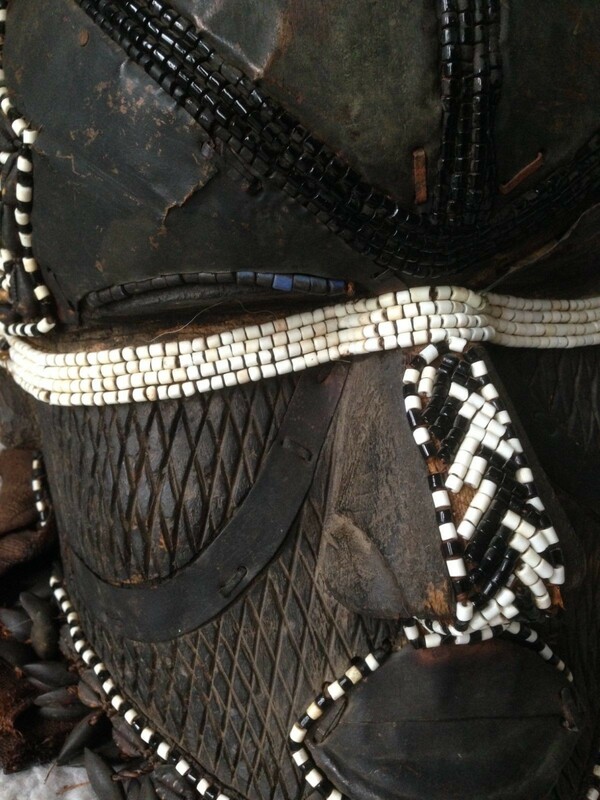 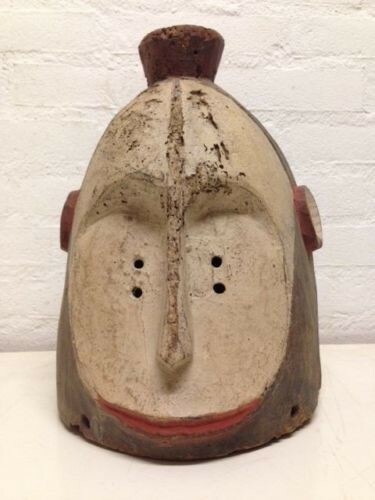 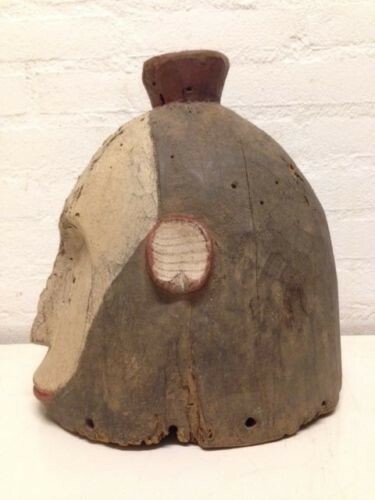 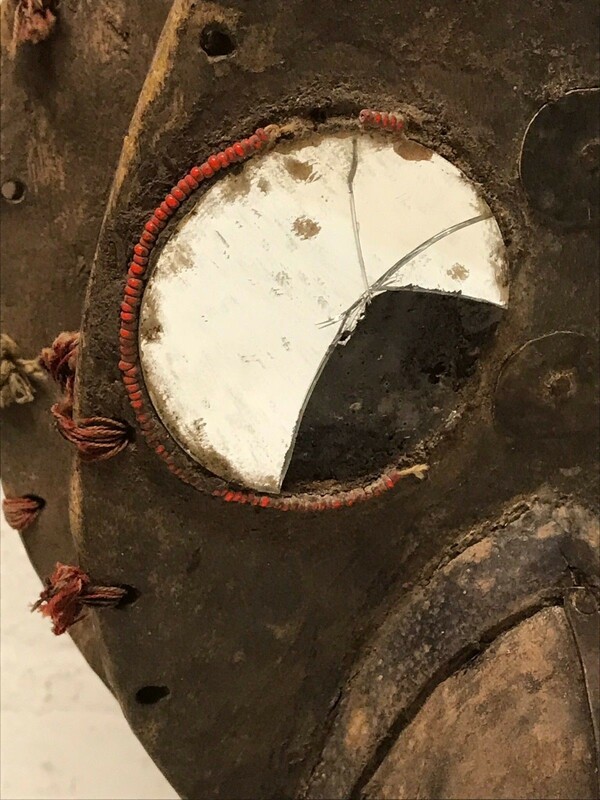 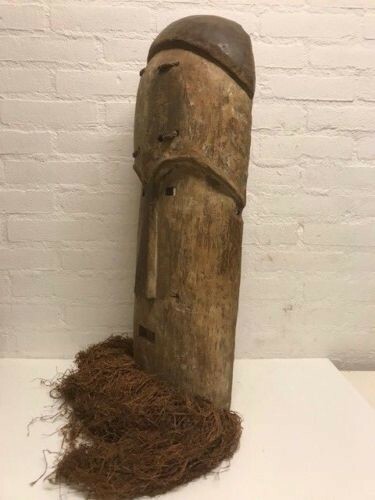 Old tribal used Dan Guere mask from Liberia. 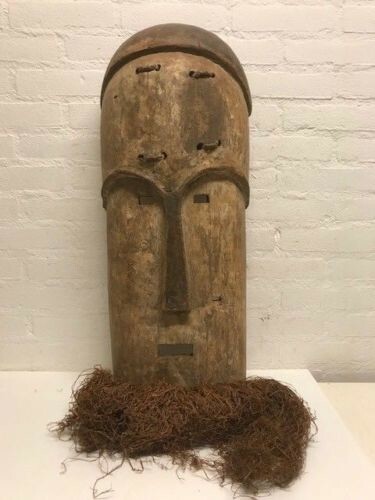 181038 - Old Tribal Used African Mask from the Dan Guere - Liberia. 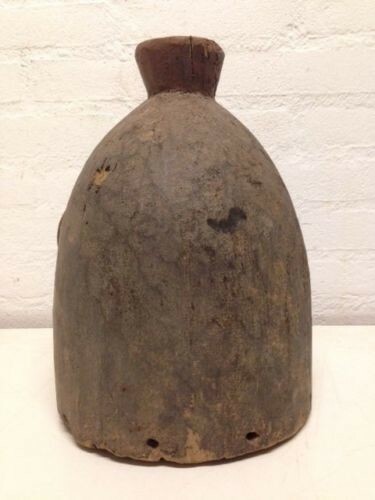 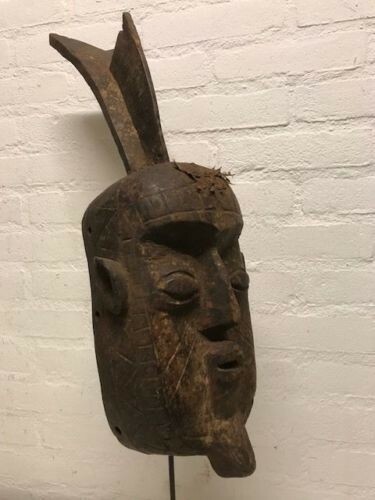 181035 - Old Tribal Used African Mask from the Dan Guere - Liberia. 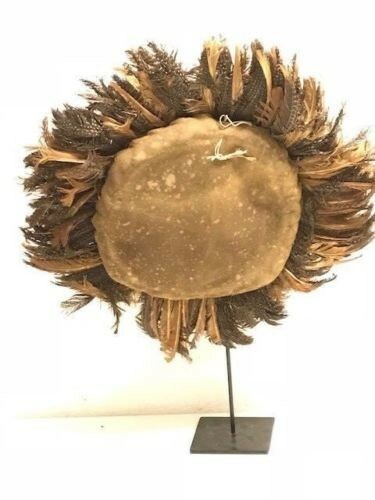 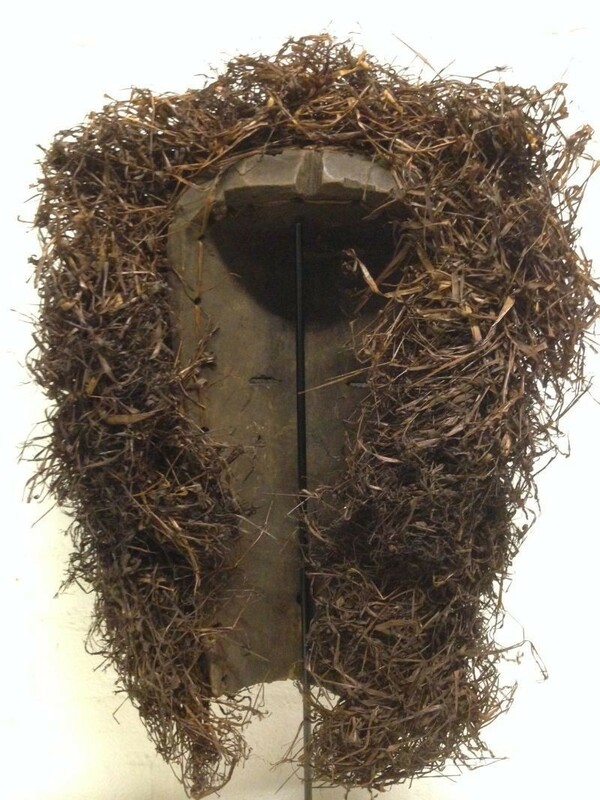 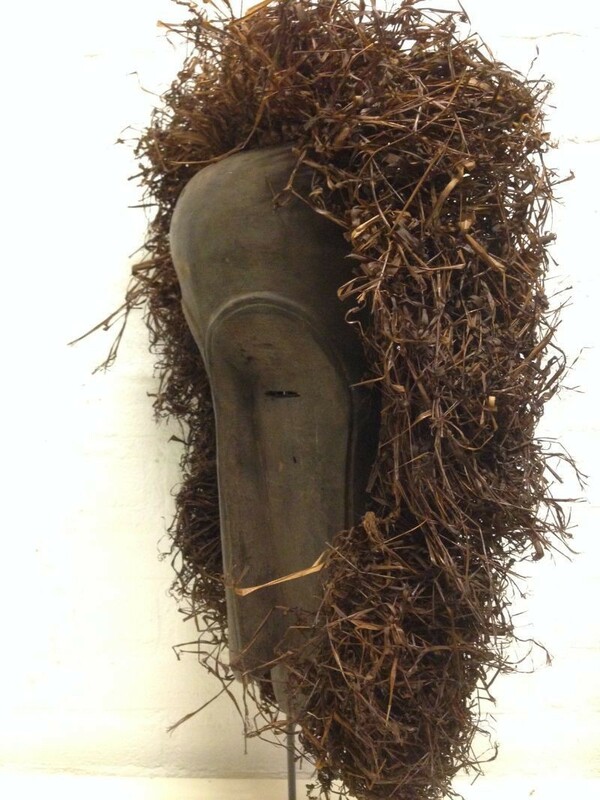 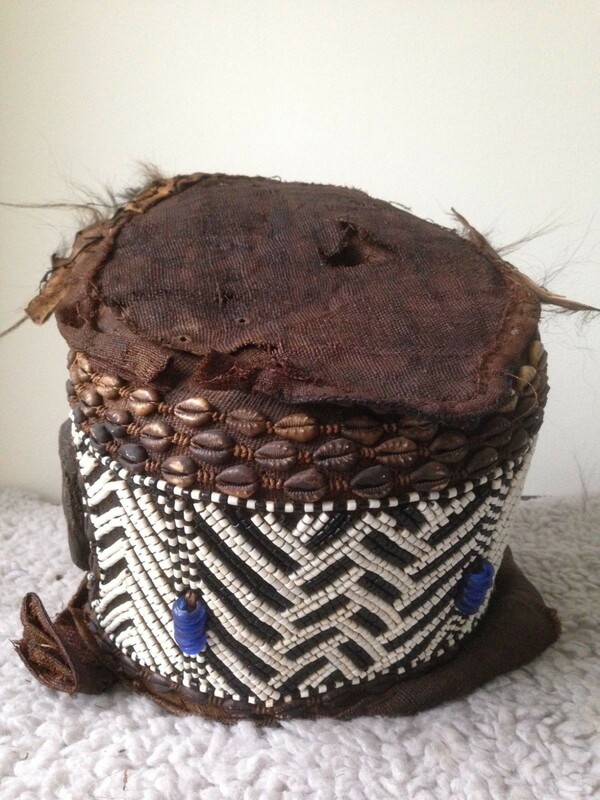 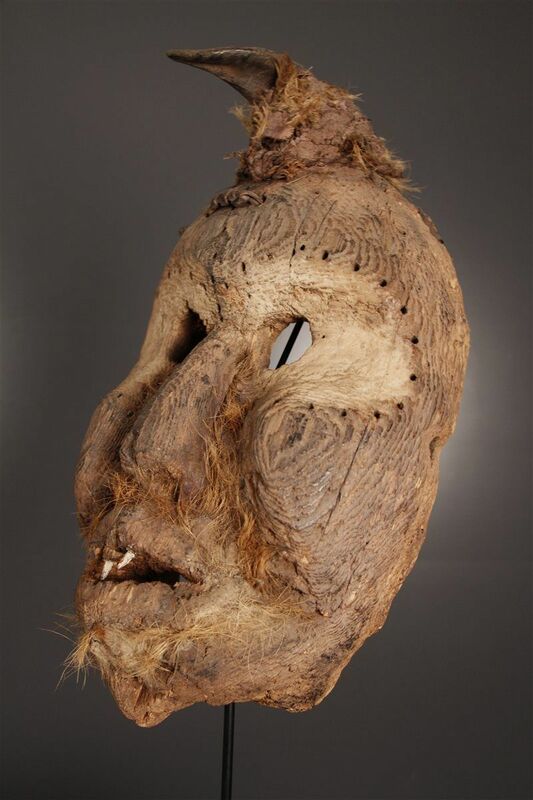 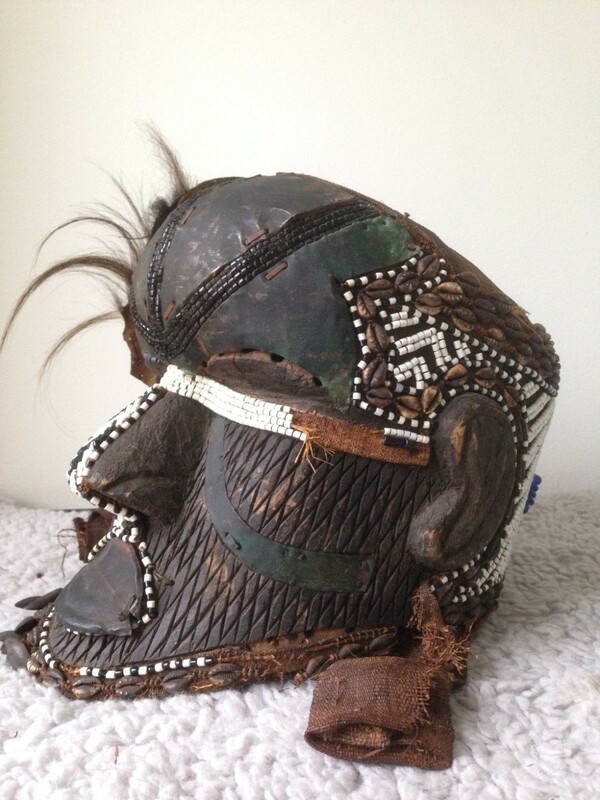 Tribal used Old Mende Head mask with Raffia. 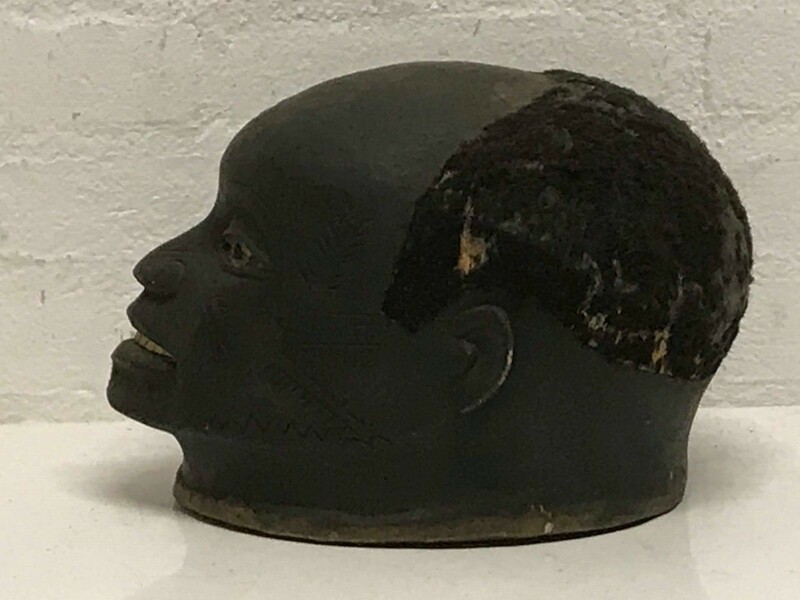 African head from the Mende. 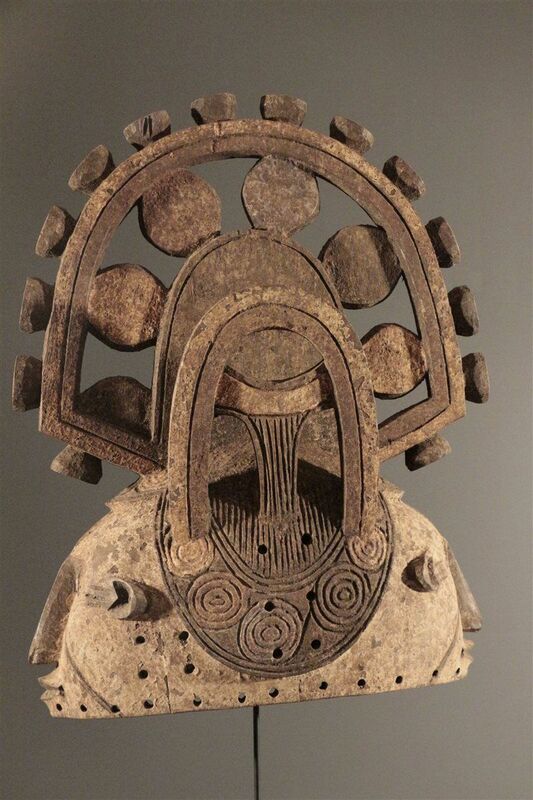 This type of bust serves the fertility cult of the Mende. 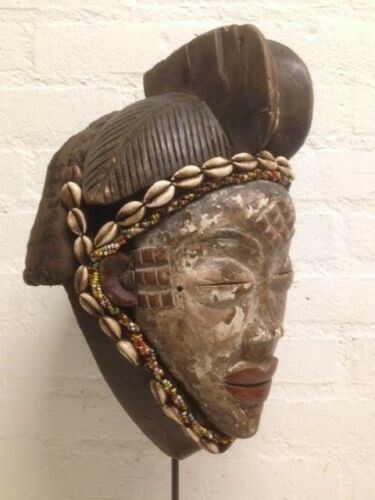 Hand carved from a single piece of hard and colorful painted wood and raffia. 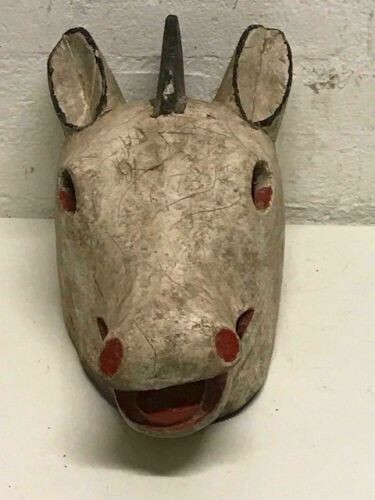 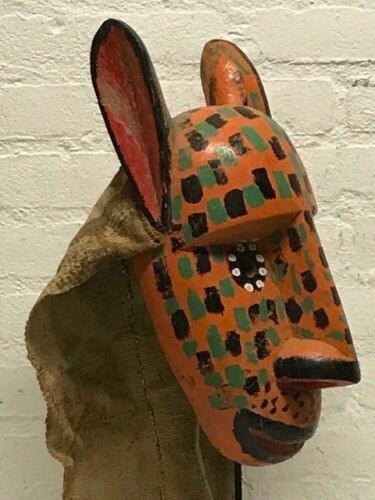 Mali : Old and Rare Tribal Used African Bozo Animal Mask. 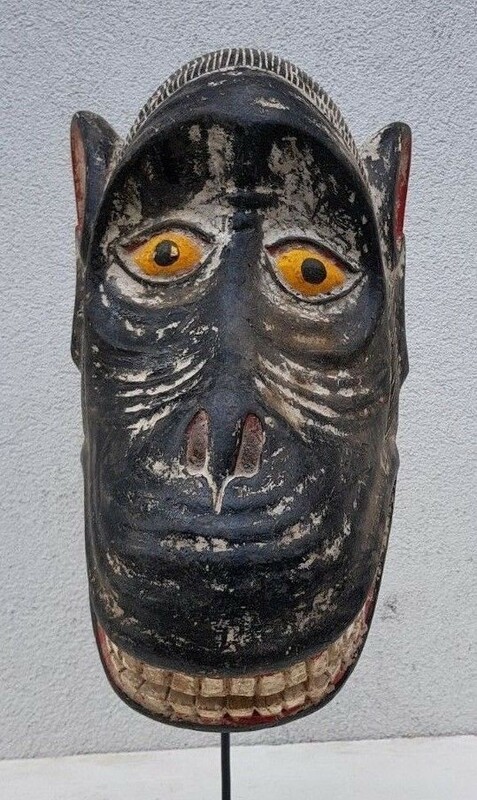 Hand carved from a single piece of colorful painted wood. 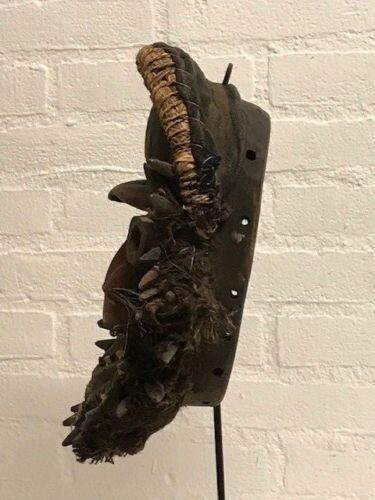 Size : 42 cm height. 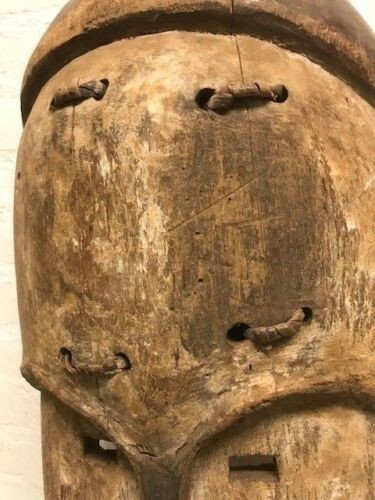 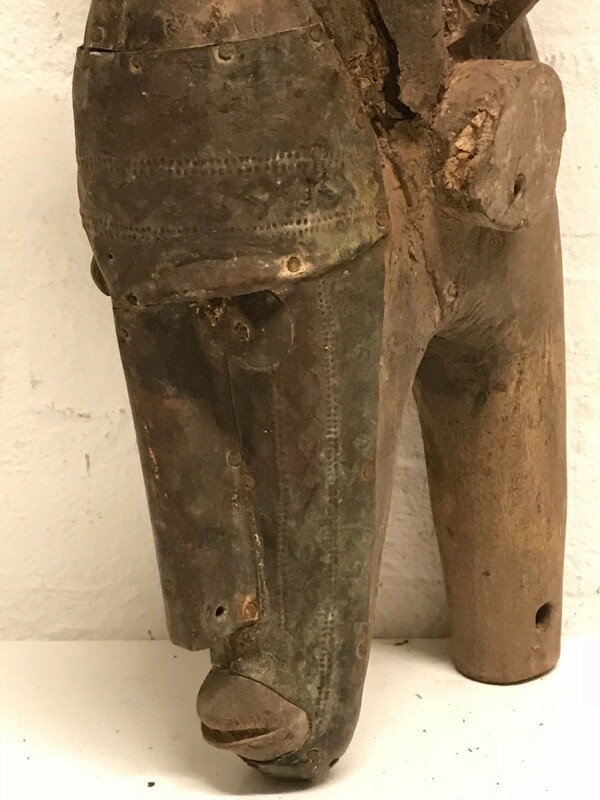 Rare Nice Old & Tribal Used African Fetisch Kumu Mask. 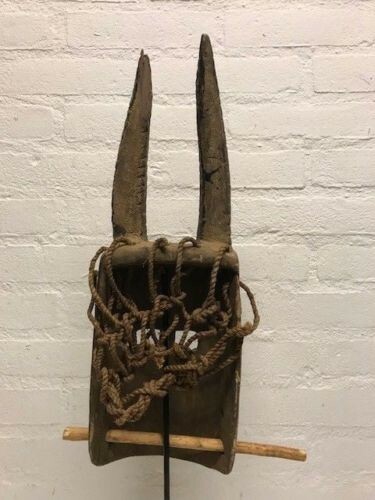 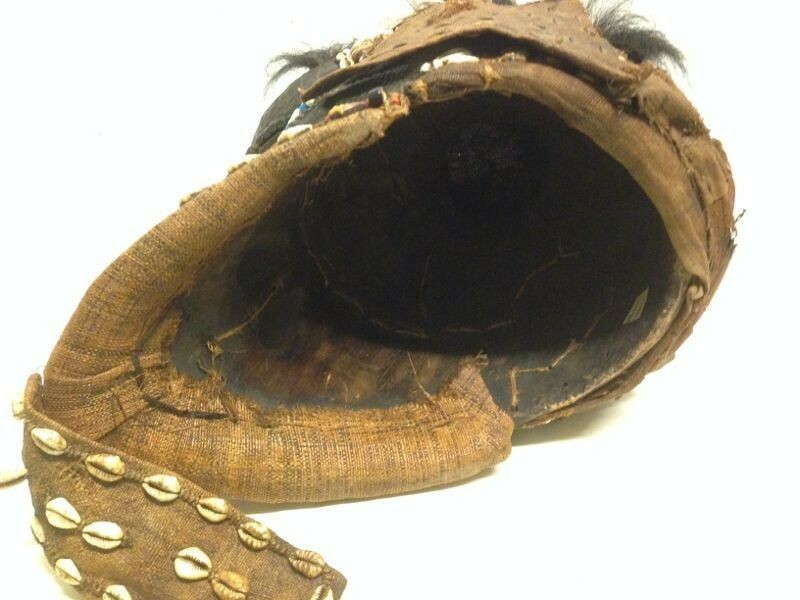 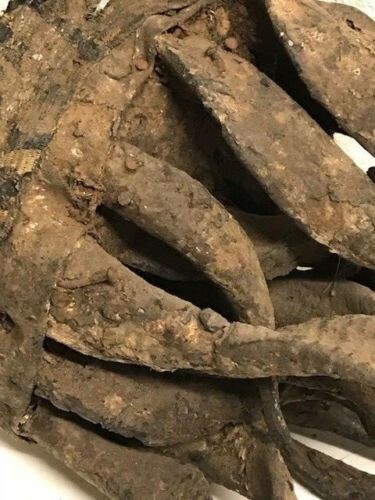 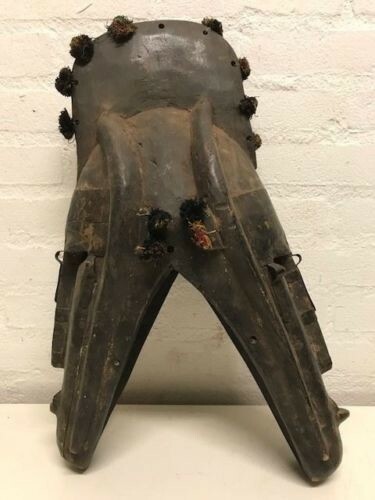 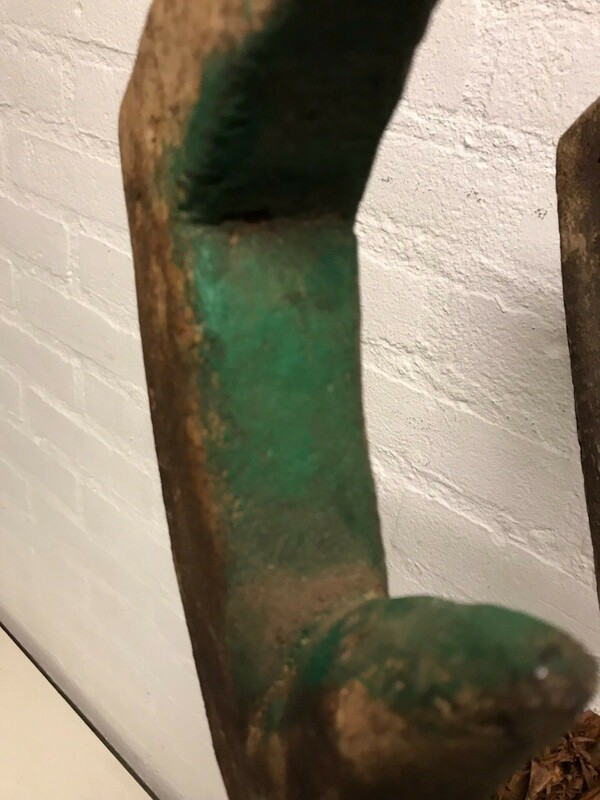 Extremly Rare Nice Old & Tribal Used African Fetisch Kumu Mask. 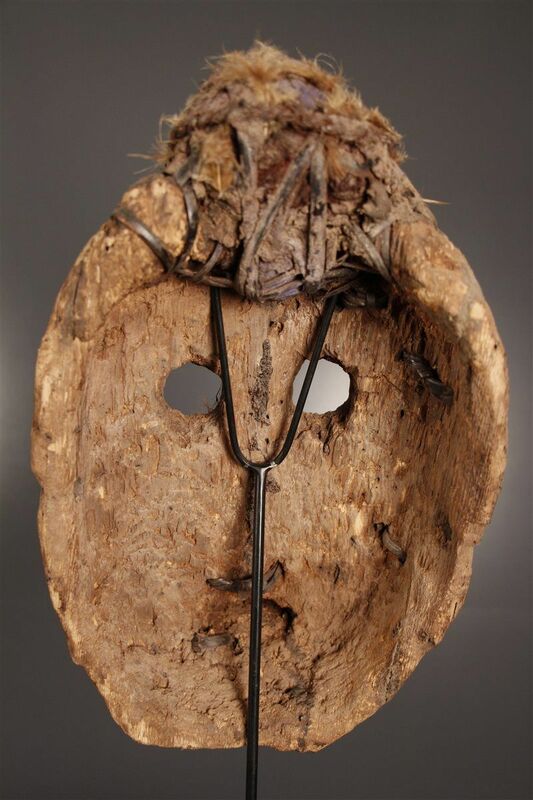 This type of mask appears in ceremonies to repel evil spirits and keep away harmful influences. 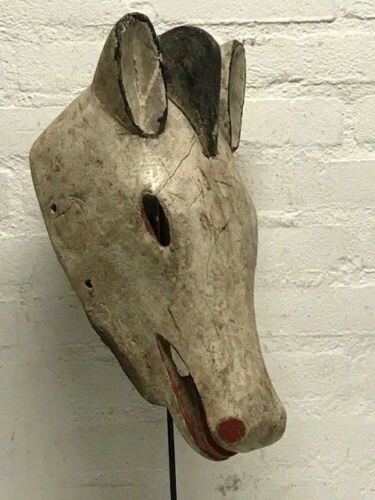 Hand carved from a single piece of wood and more then 100 years old. 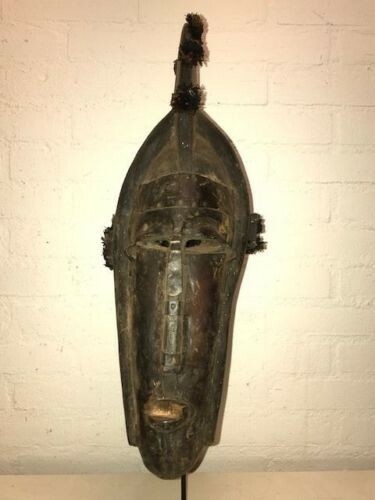 Rare Tribal used African Agni mask, Iv. 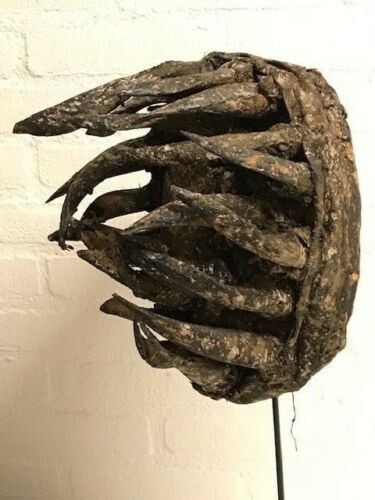 Coast. 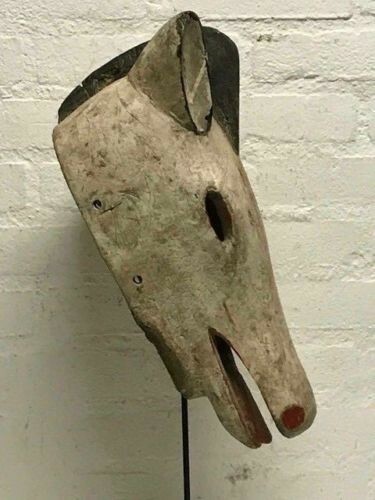 Hand carved from a single piece of wood. 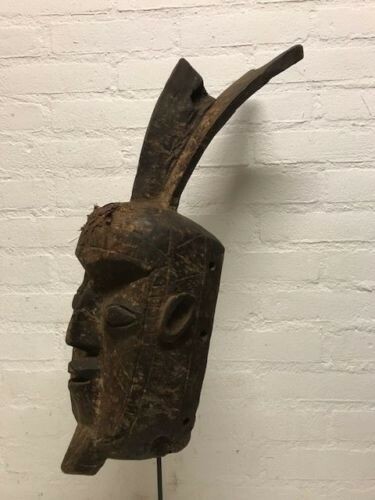 180109 - Rare & Large Tribal used African Bwoom KUBA mask. 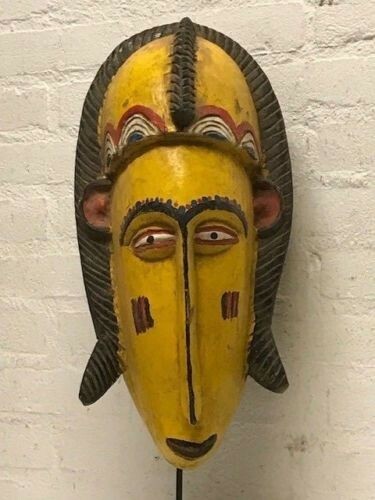 African Bwoom mask from the Kuba, Congo. 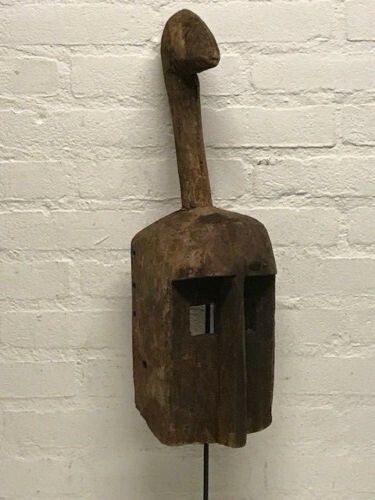 Height: 32 cm x 34 cm. 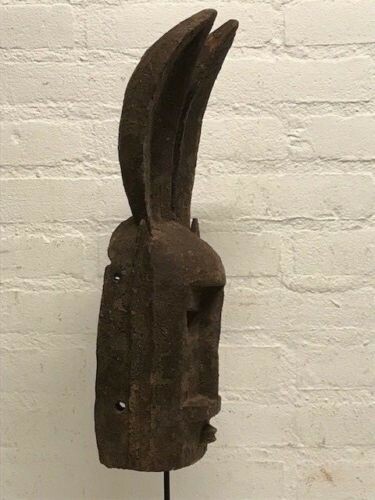 Mali: Large Old Tribal Used African Dogon Mask. 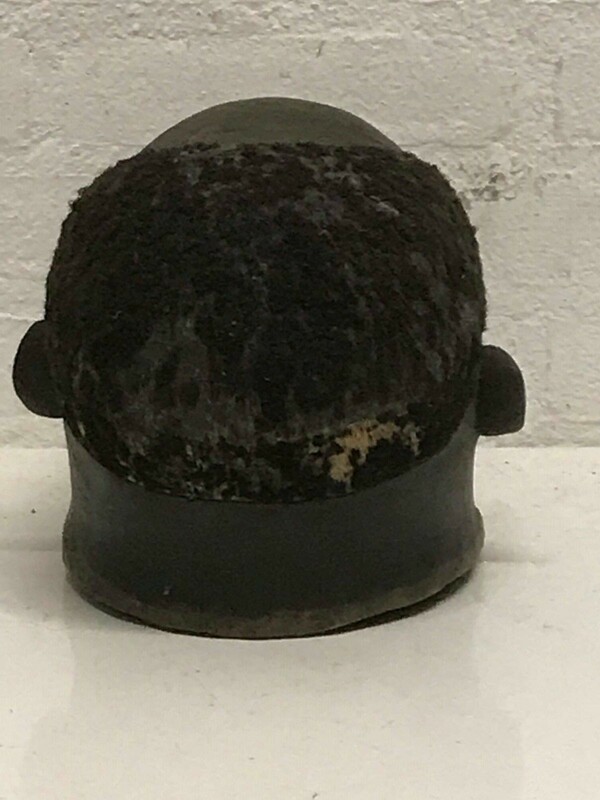 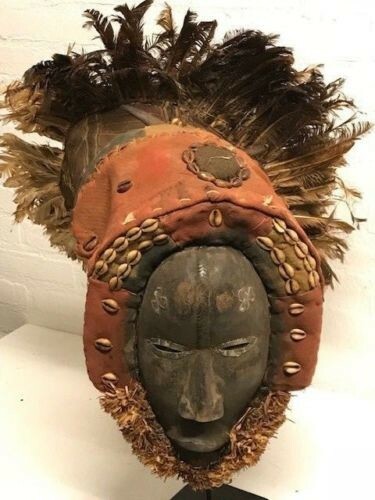 180544 - Tribal used Rare African Markha headmask - Mali. 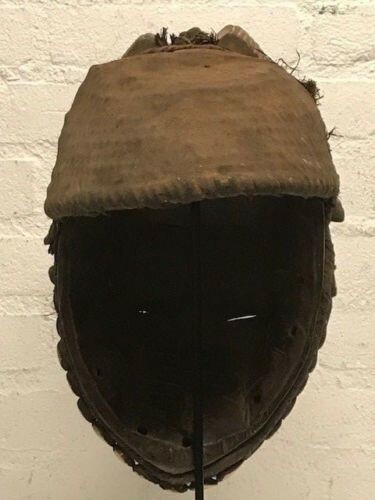 Mali: Rare Tribal used African Markha headmask. 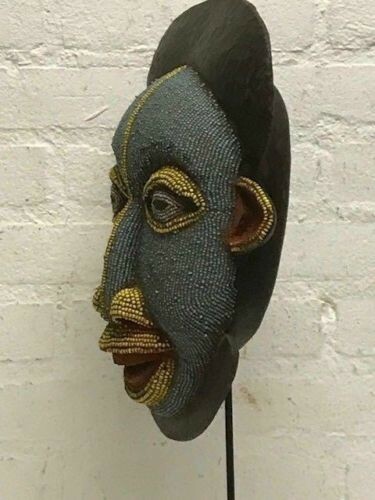 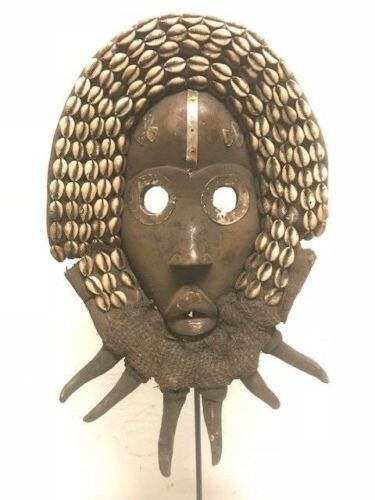 This type of mask is used in initiation ceremonies. 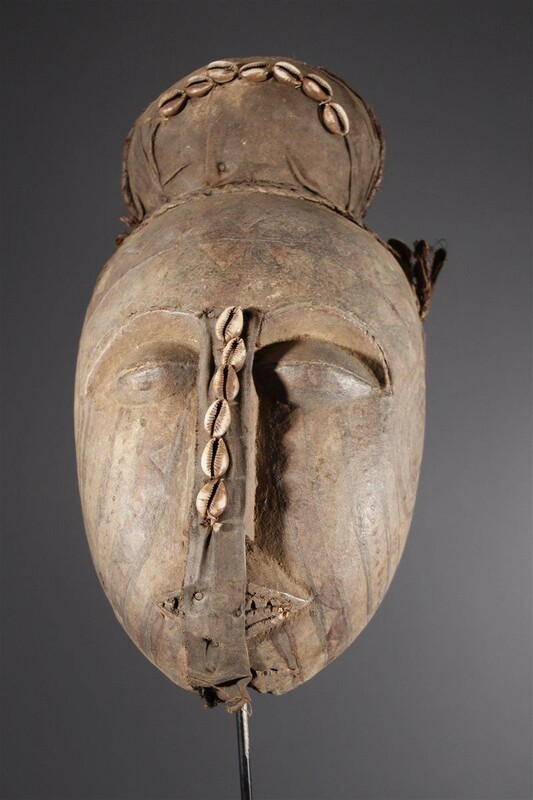 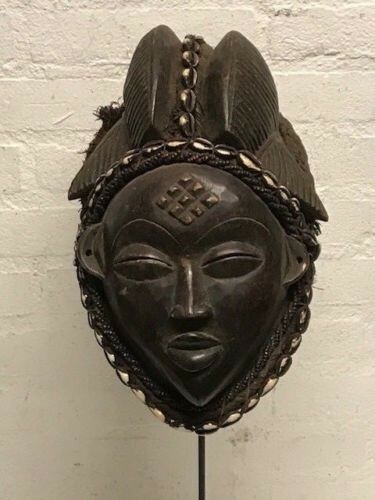 180926 - Tribal used African female Punu mask - Gabon. 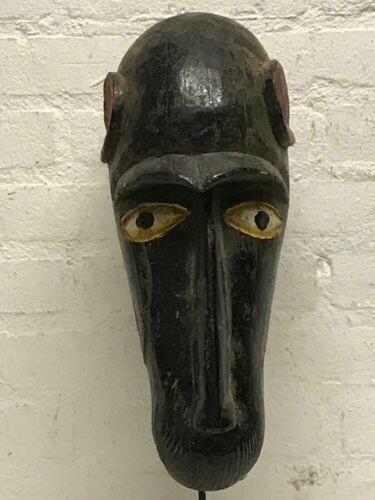 Tribal used african Old black mask from the Punu, Gabon. 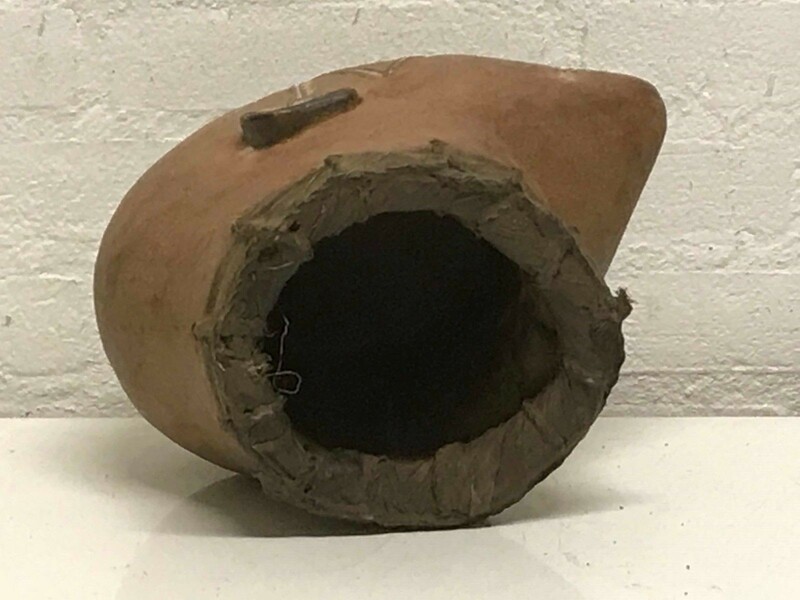 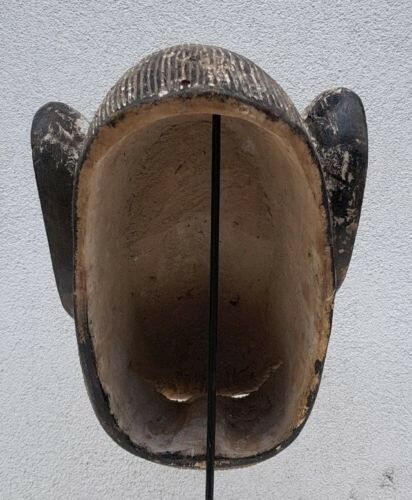 This finely crafted object depicts female face. 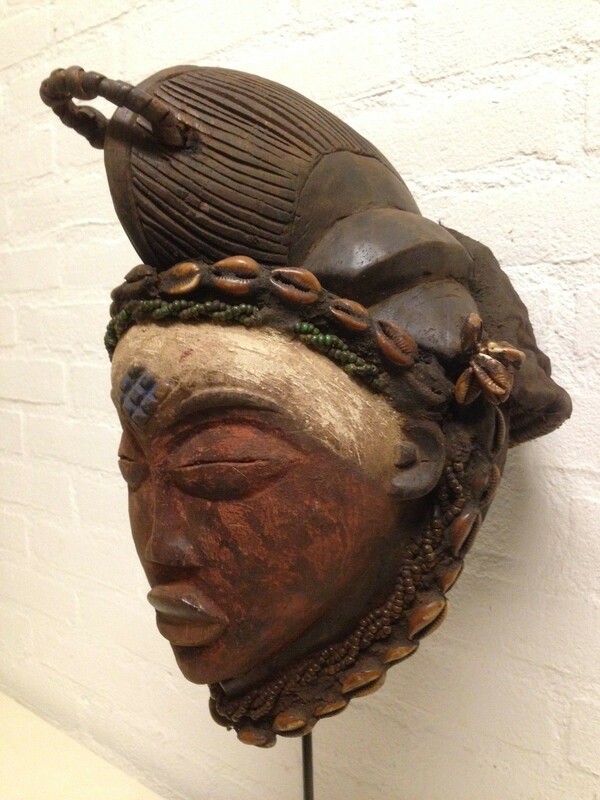 Hand carved from a single piece of colorful painted wood, with scar tattoos and artful hairdo. 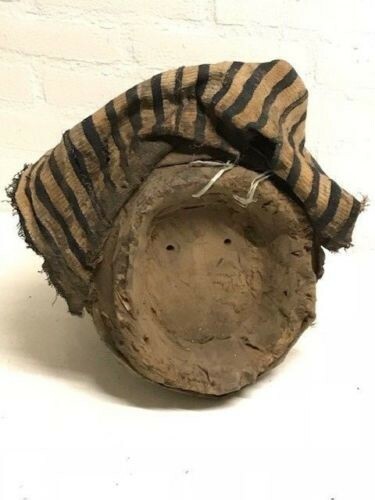 180250 - Old and Rare Tribal Used African Bozo Mask - Mali. 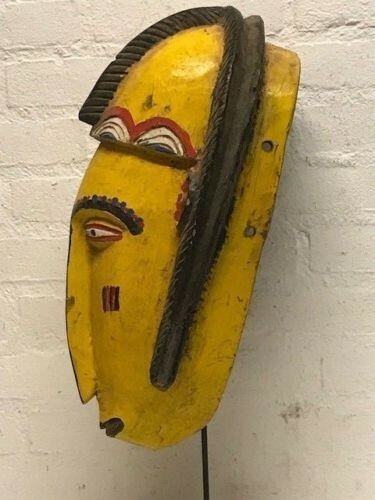 Mali : Large Old and Rare Tribal Used African - Bozo - Mask. 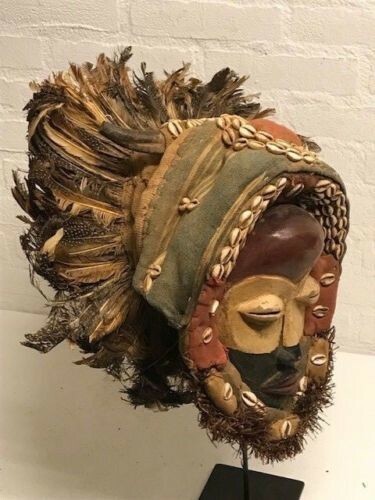 181008 - Old Tribal Used African Mask from the Dan Nguerre - Liberia. 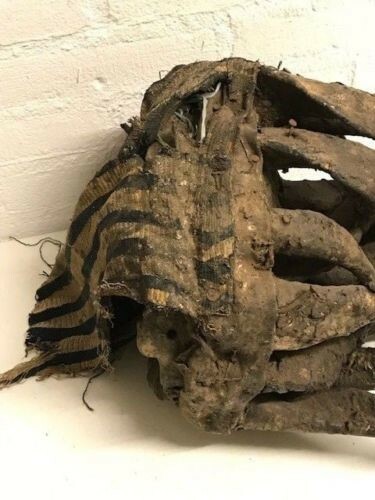 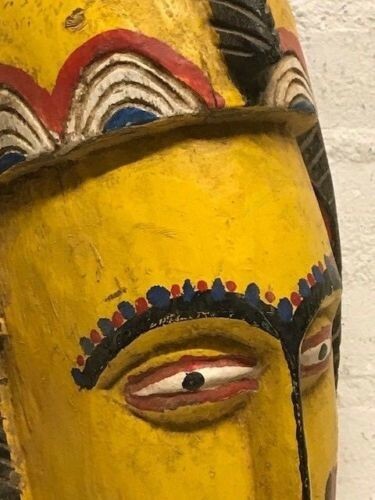 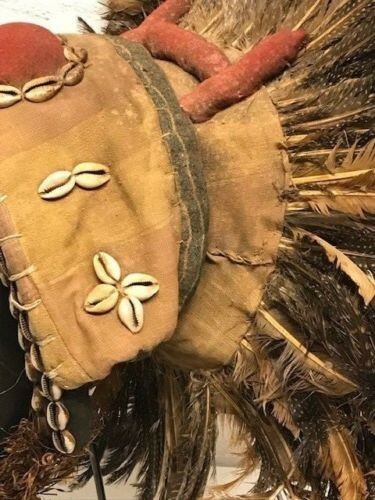 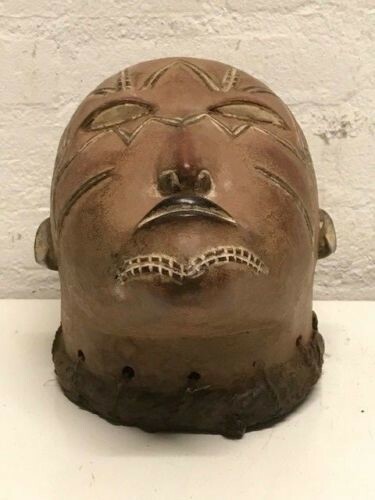 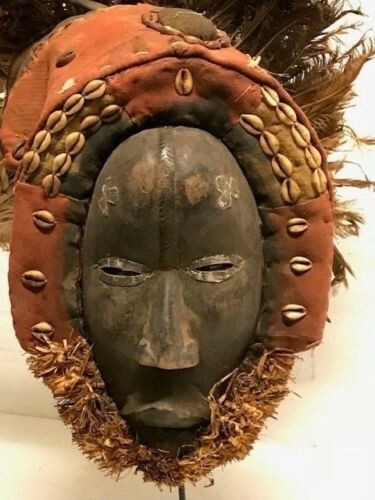 Old tribal used Dan Nguerre mask from Liberia. 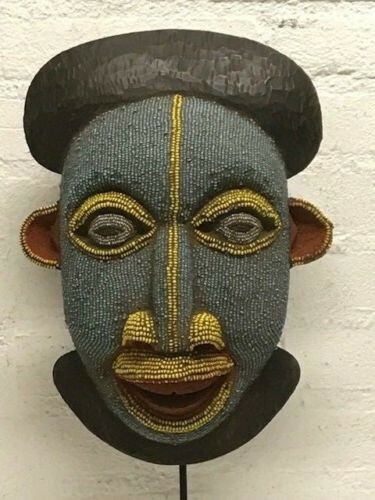 Hand carved from a single piece of wood and other material with color pigments. 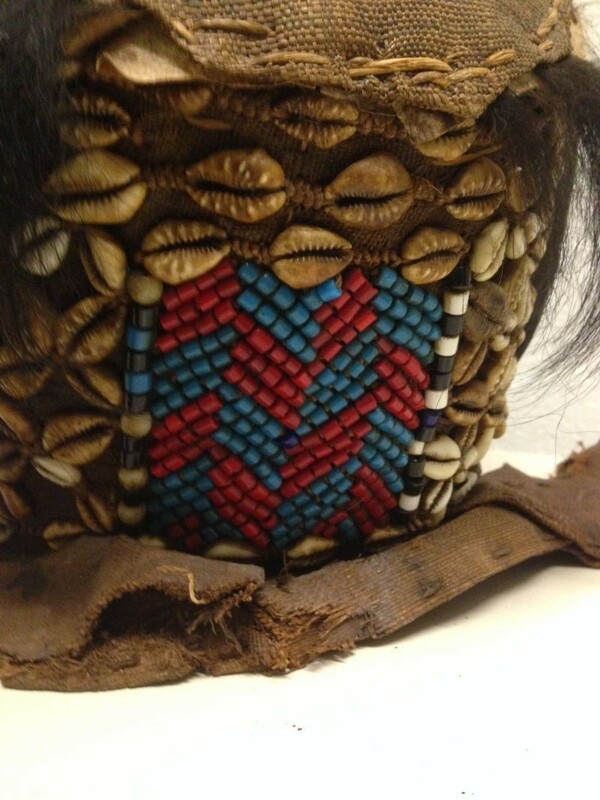 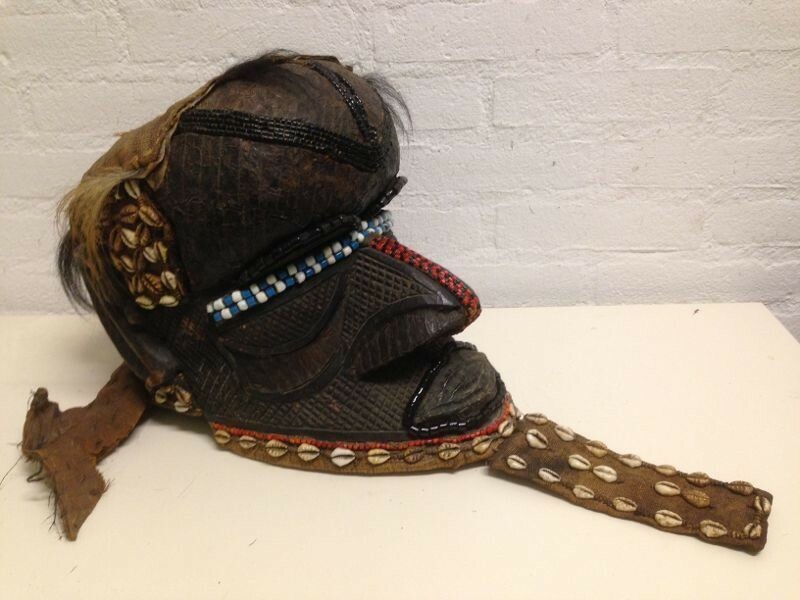 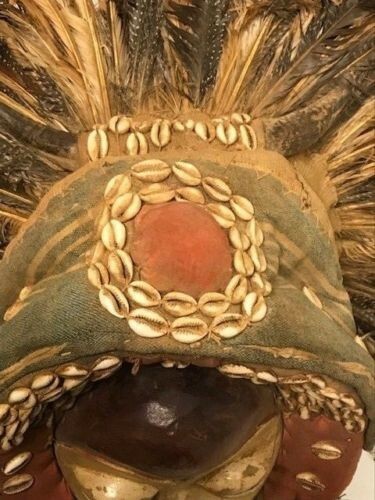 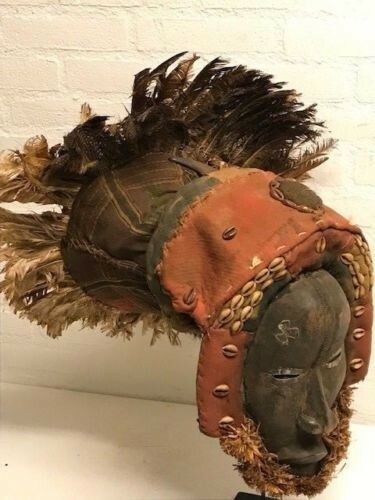 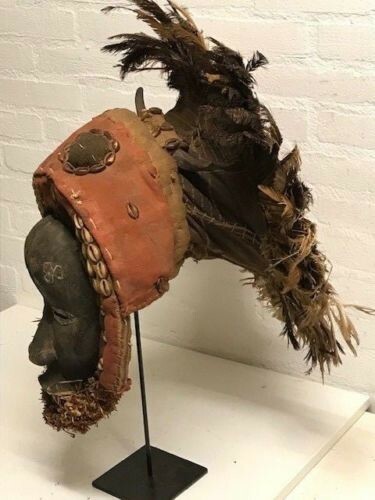 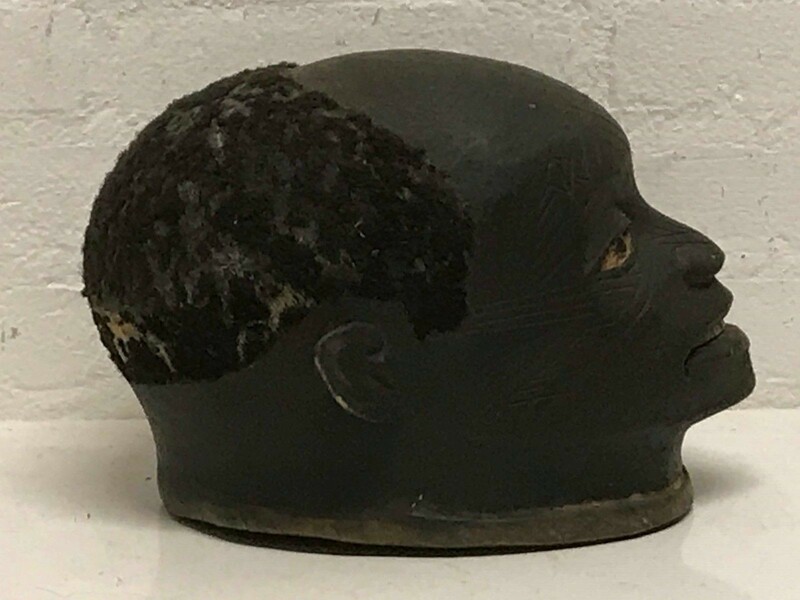 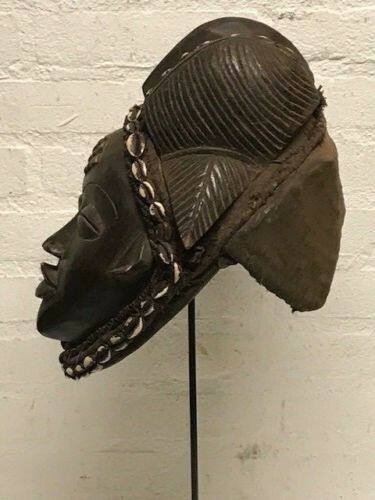 170219 - Tribal used African Lega helm mask - Congo. 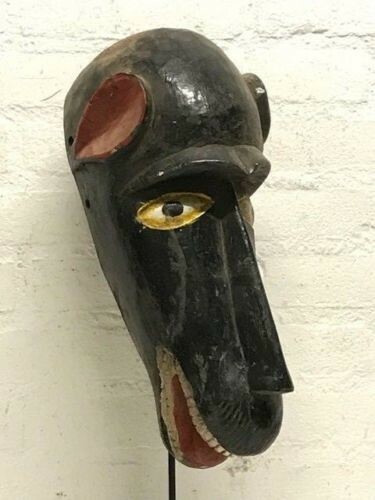 Tribal used African mask from the Lega, Congo. 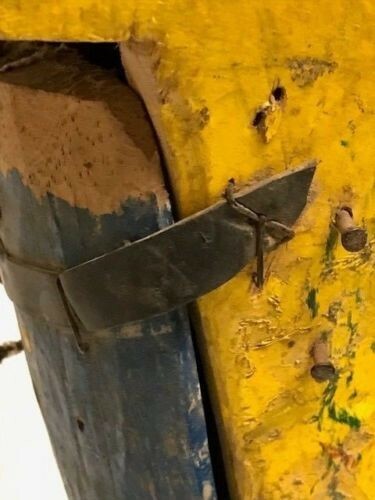 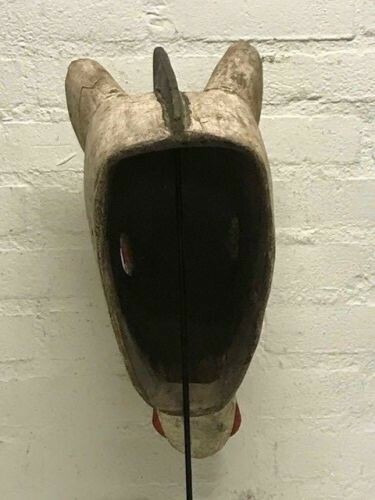 Made of one piece of wood. 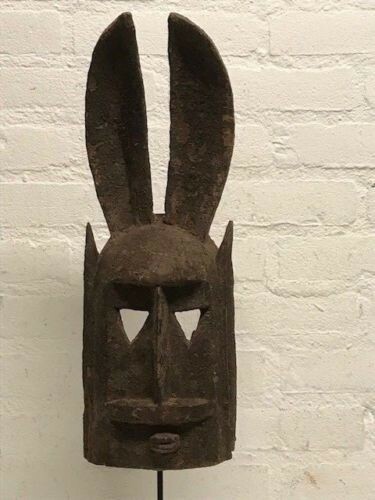 Height: 32 x 30 x 23 cm. 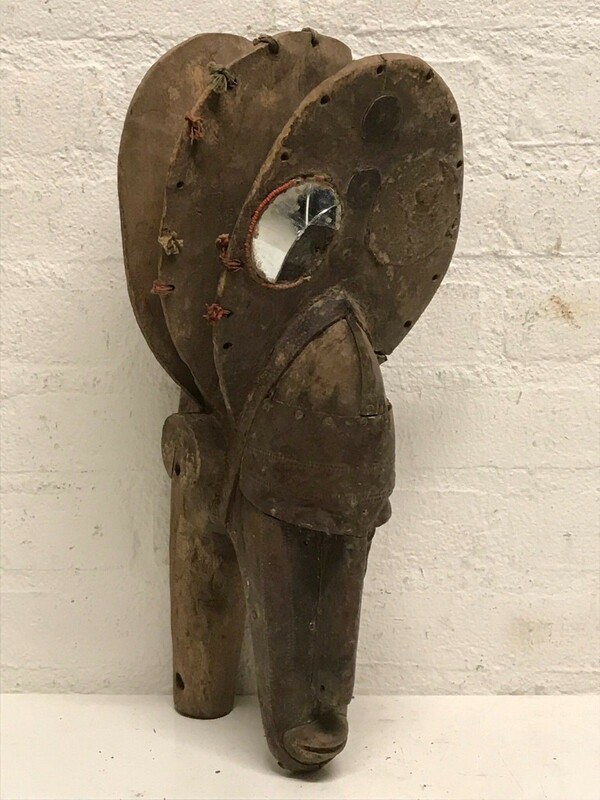 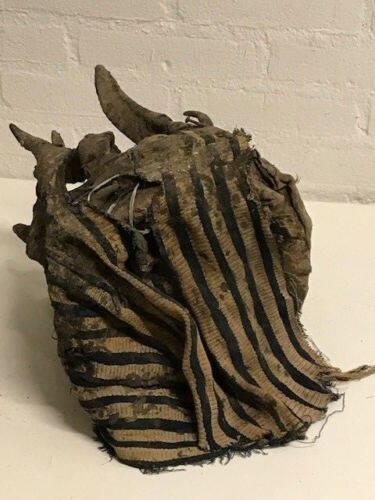 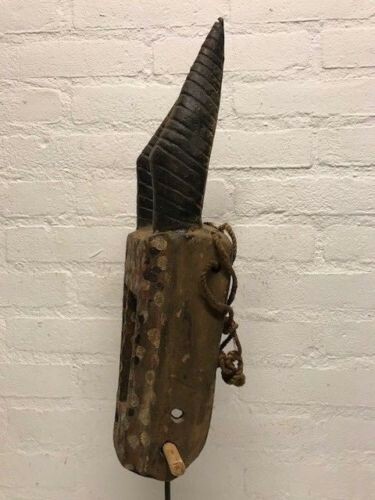 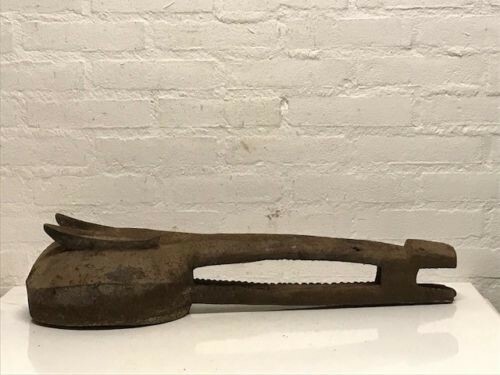 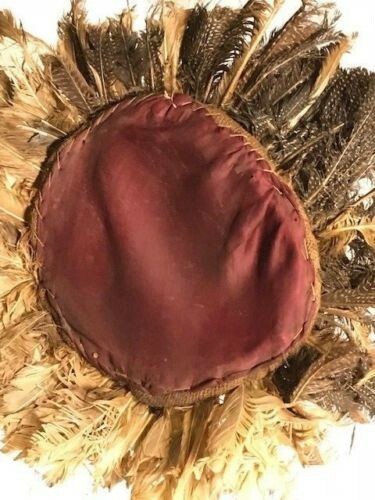 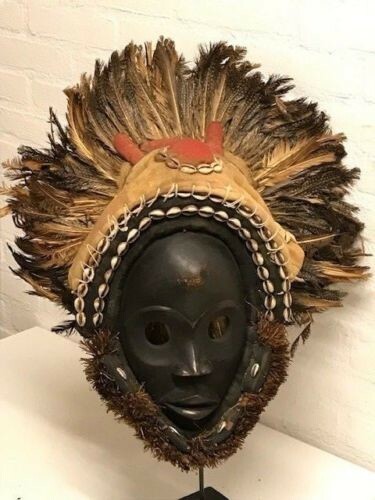 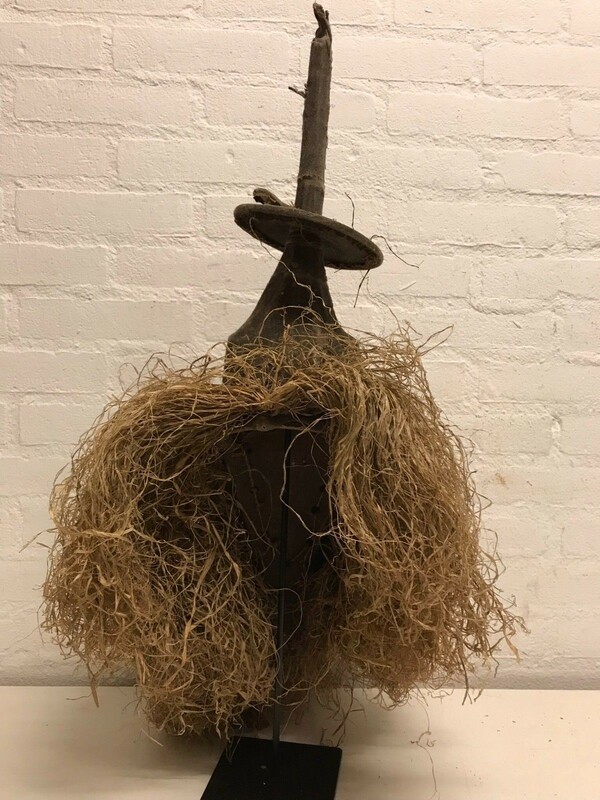 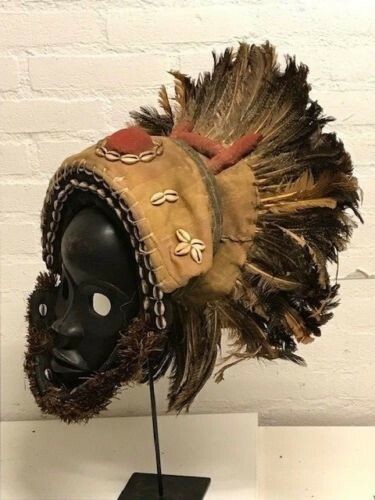 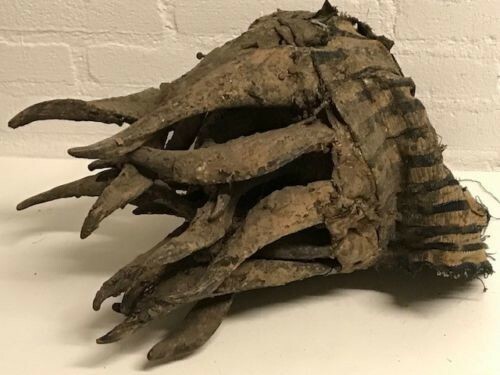 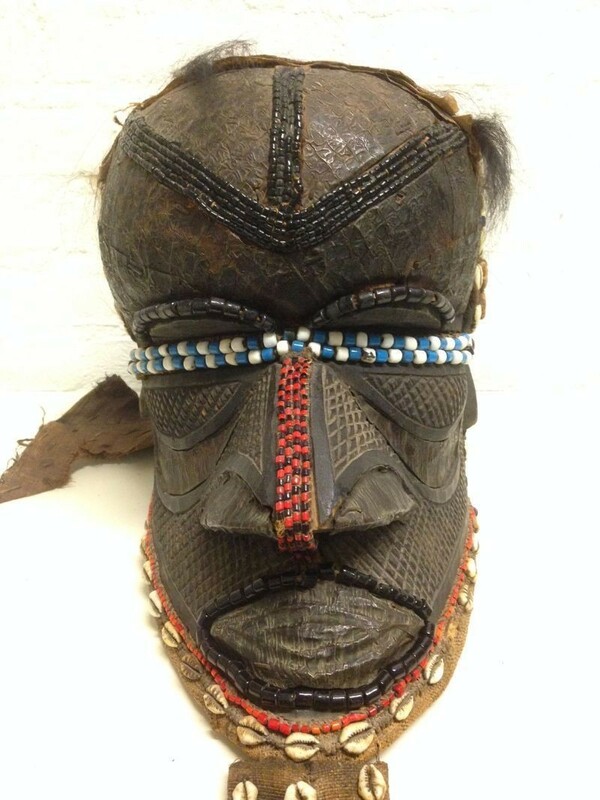 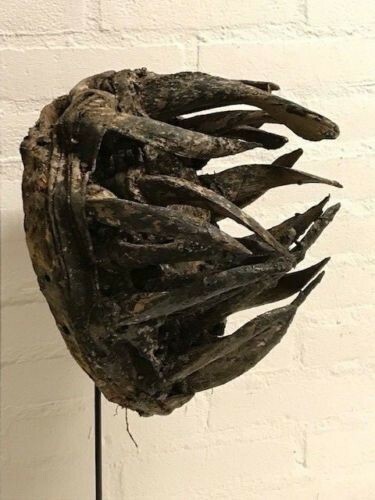 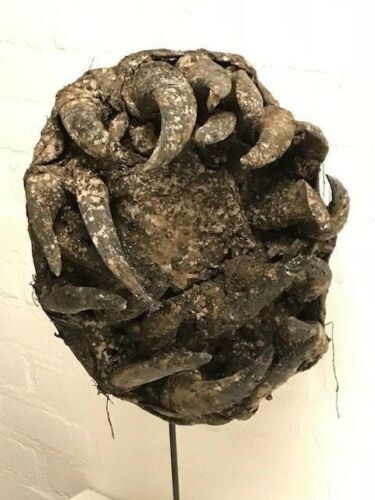 180515 - Large Old & Tribal used African Fang Mask - Gabon. 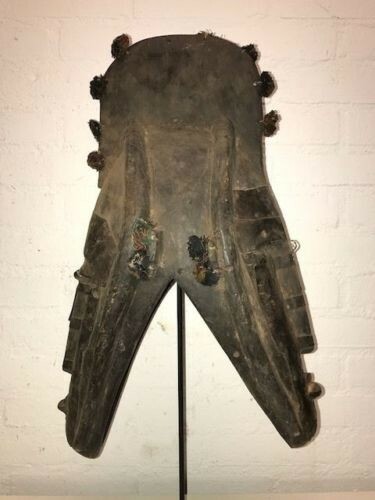 Large old tribal used Impressive african Ngil mask from the Fang, Gabon. 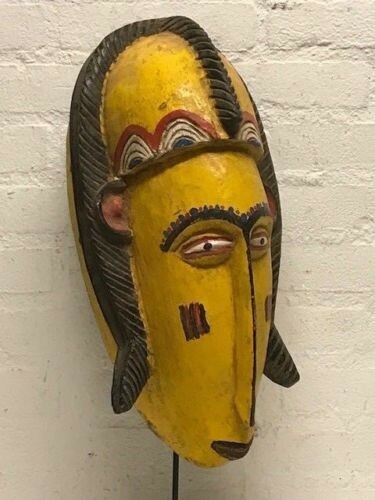 This type of mask appears in a secret society and serves to fight witchcraft. 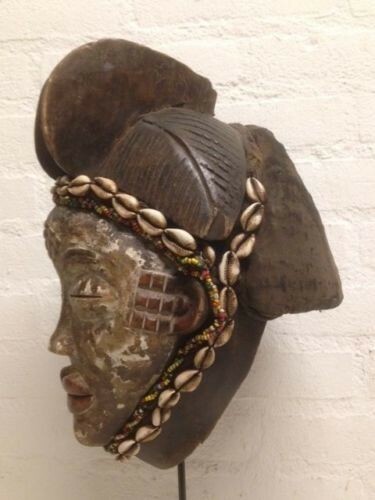 Height: 60 cm x 50 cm. 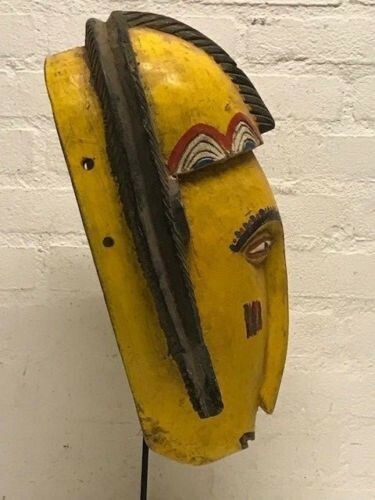 180423 - Large & Old Tribal Used African Bozo Mask - Mali. 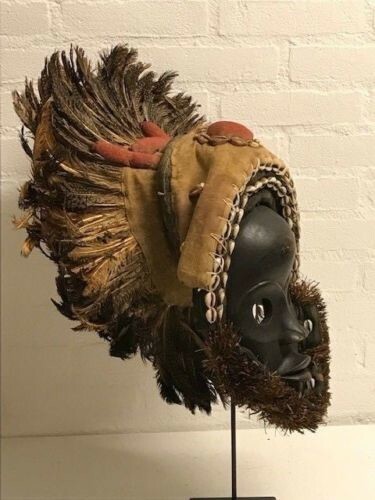 Tribal used African african headdress mask from the Mumuye, Nigeria. 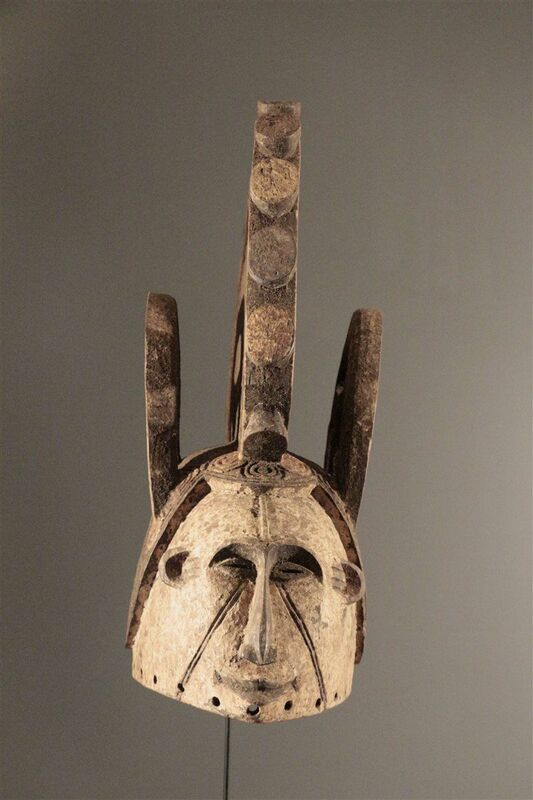 This mask depicts an abstract animal head with round eyes and open mouth. 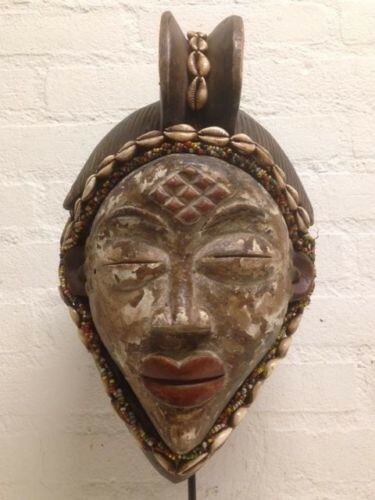 Hand carved from a single piece of wood, with color pigments. 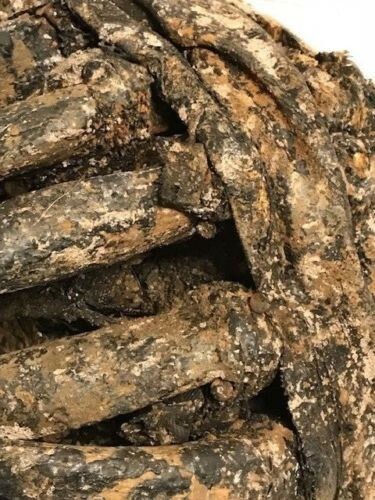 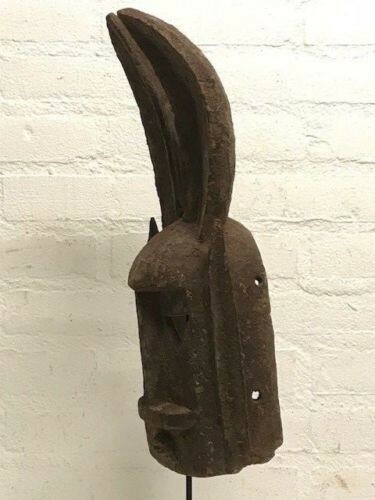 Height 60 cm, museum piece. 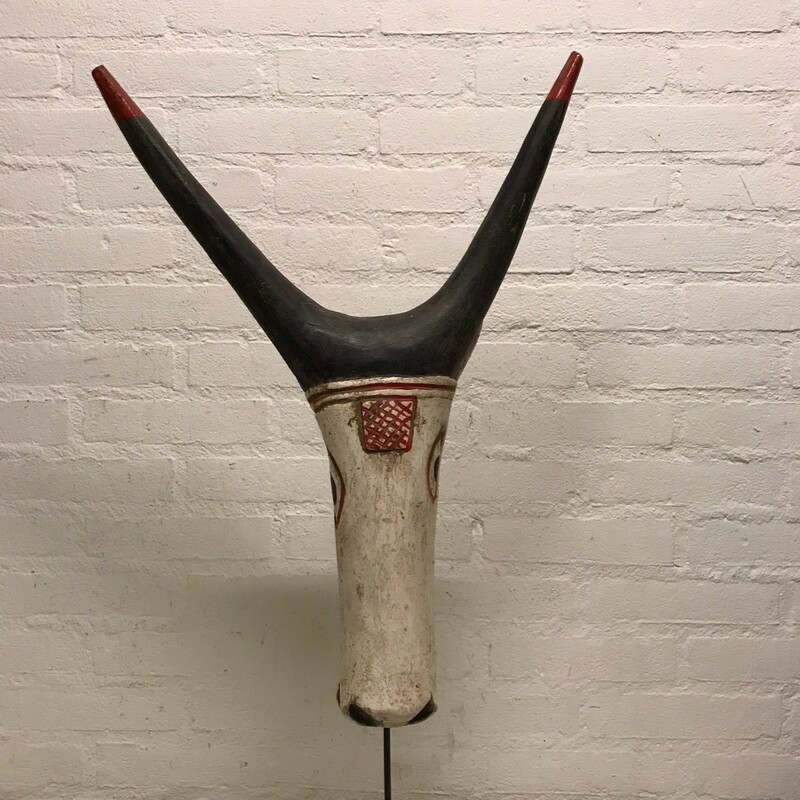 Size : 39 cm high. 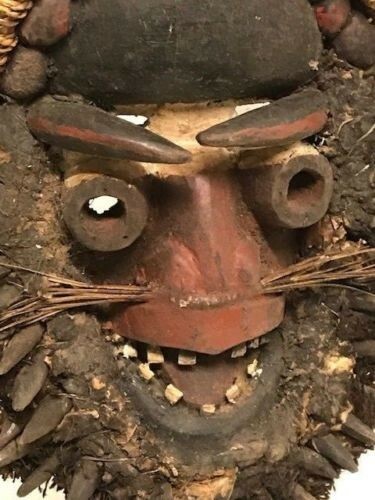 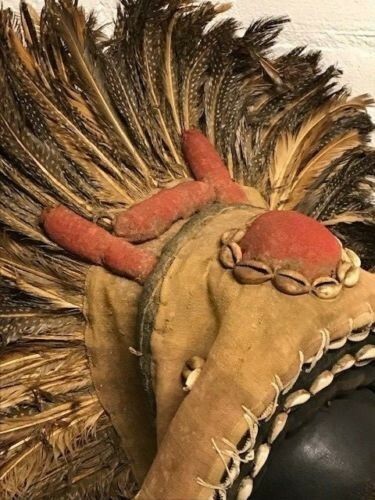 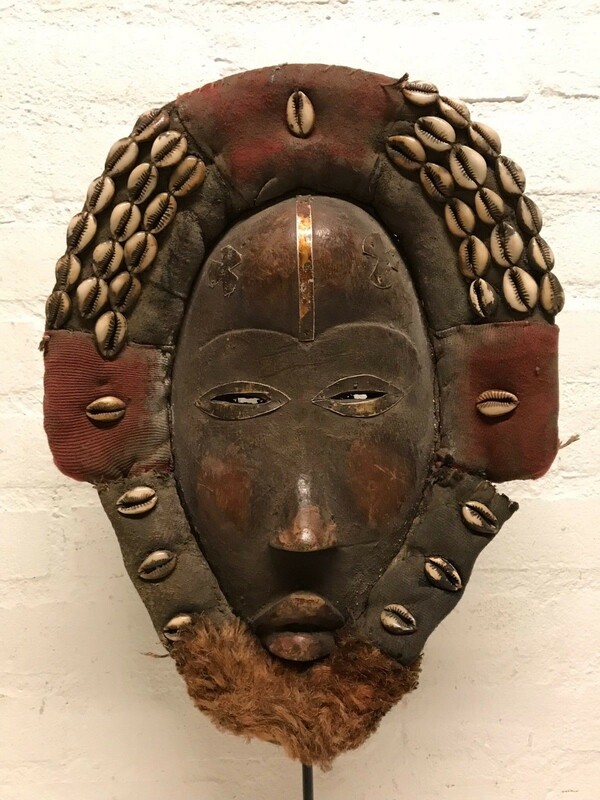 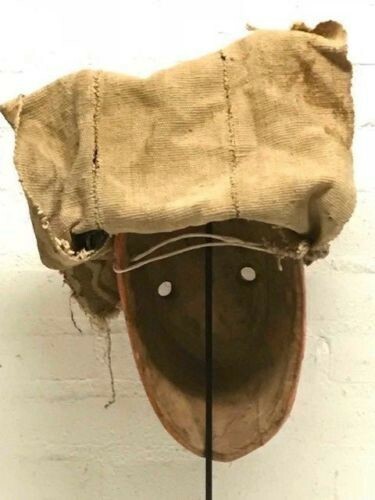 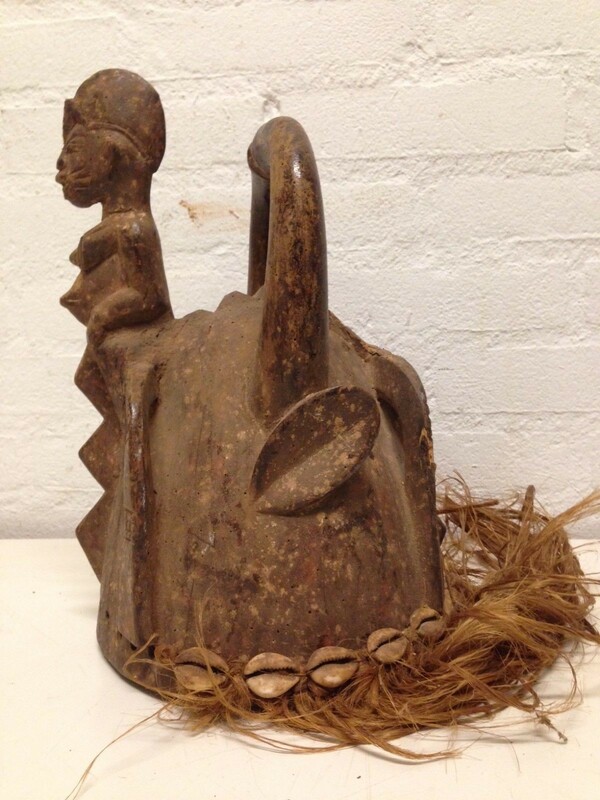 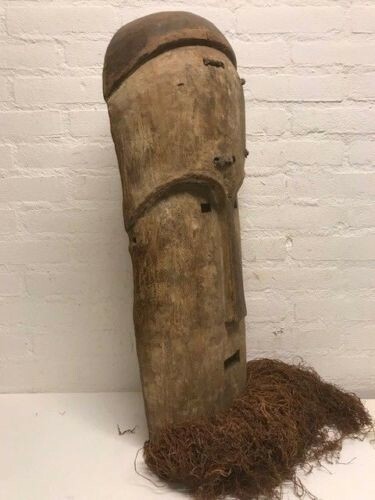 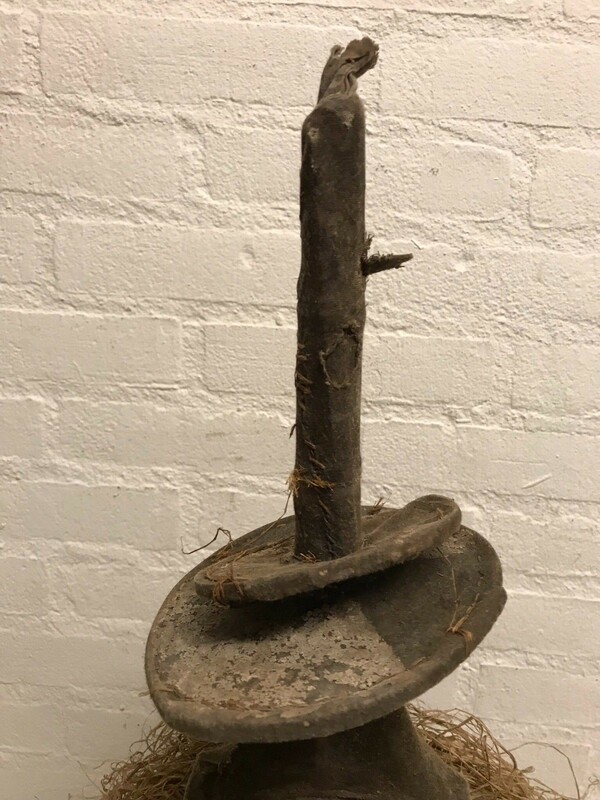 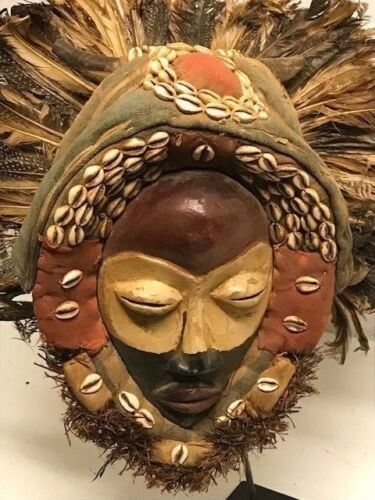 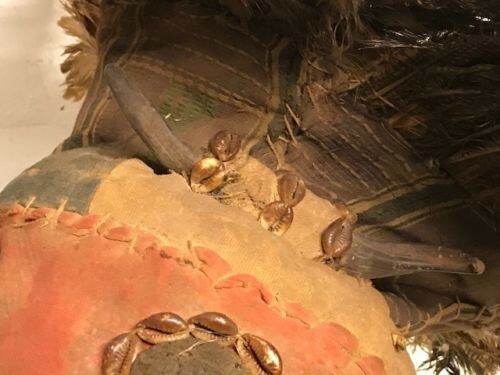 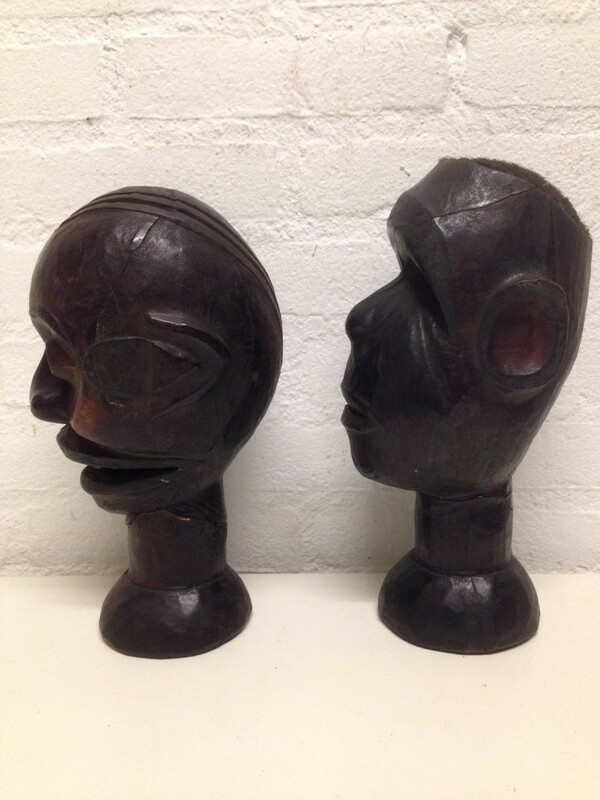 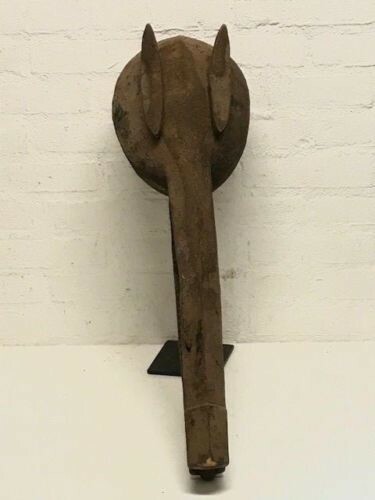 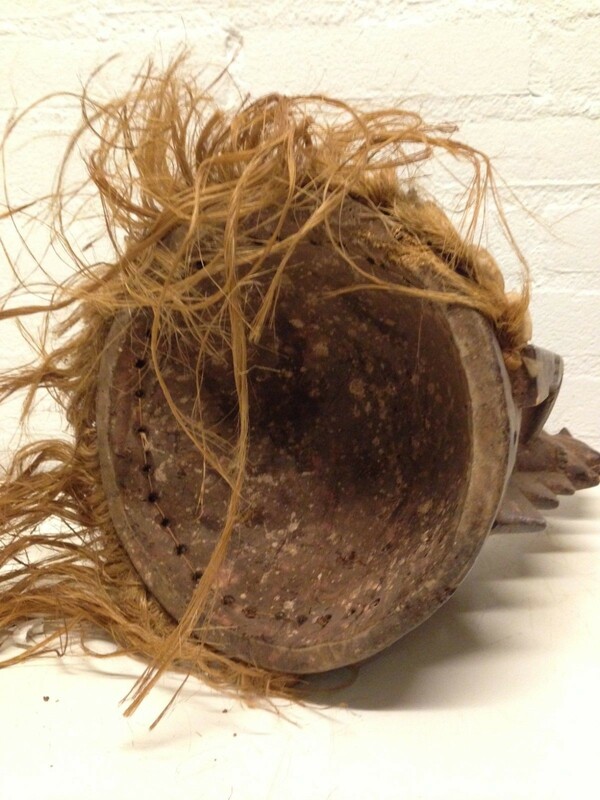 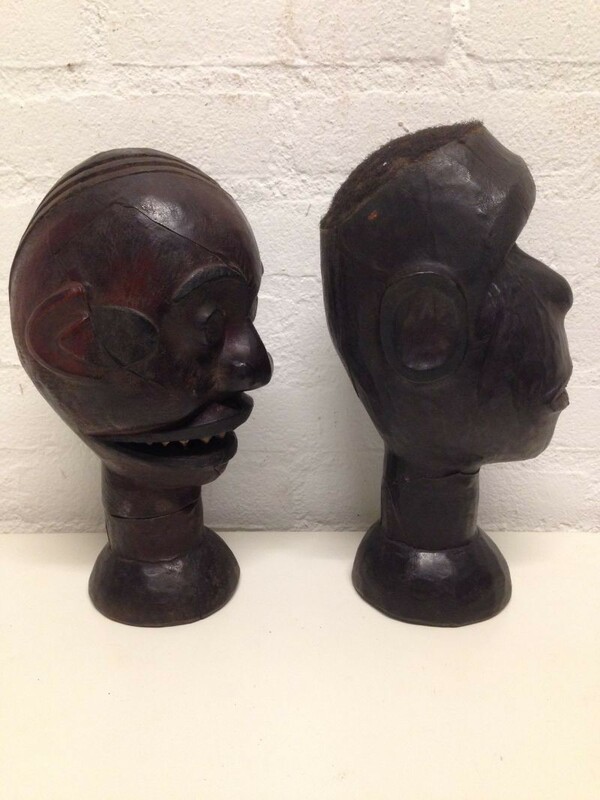 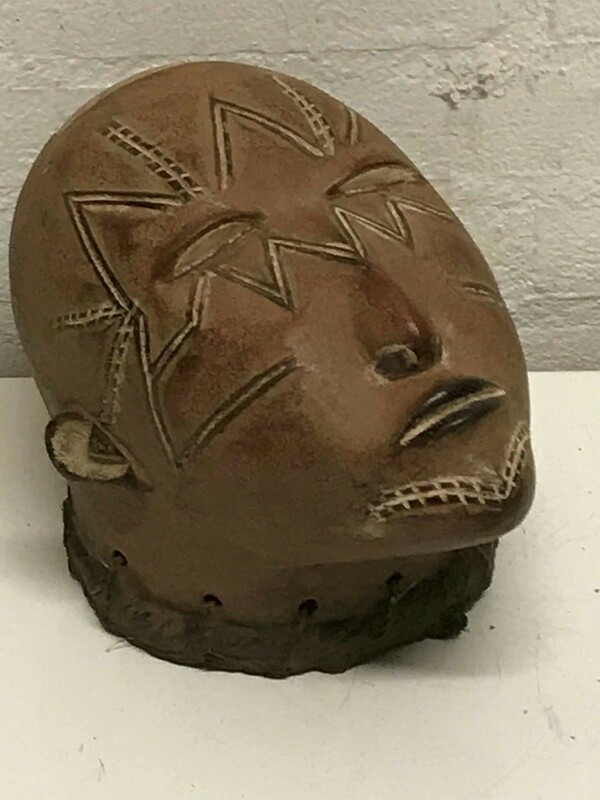 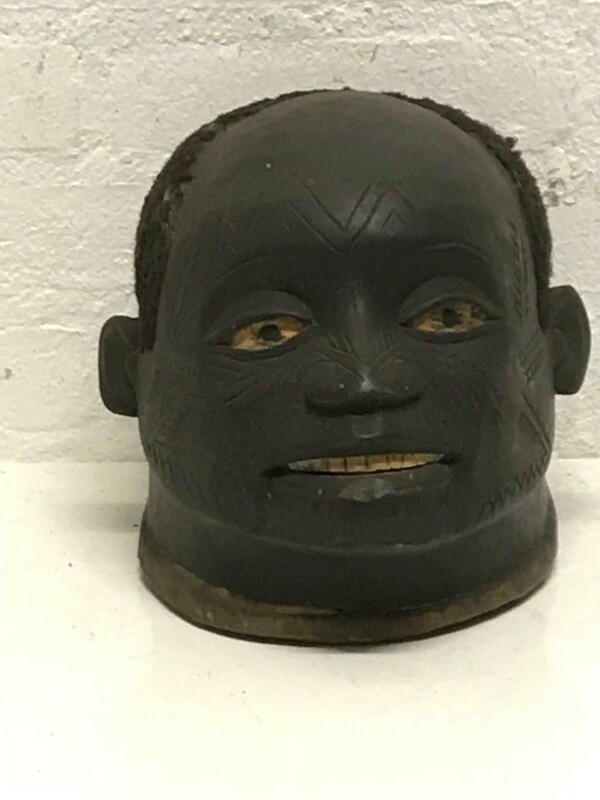 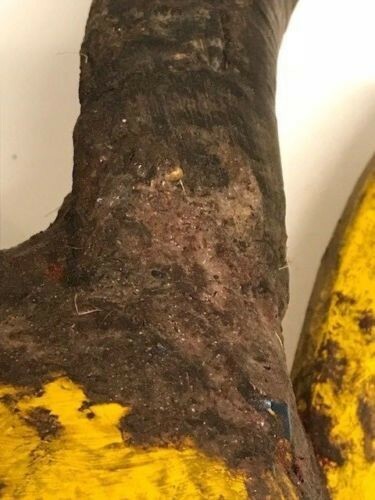 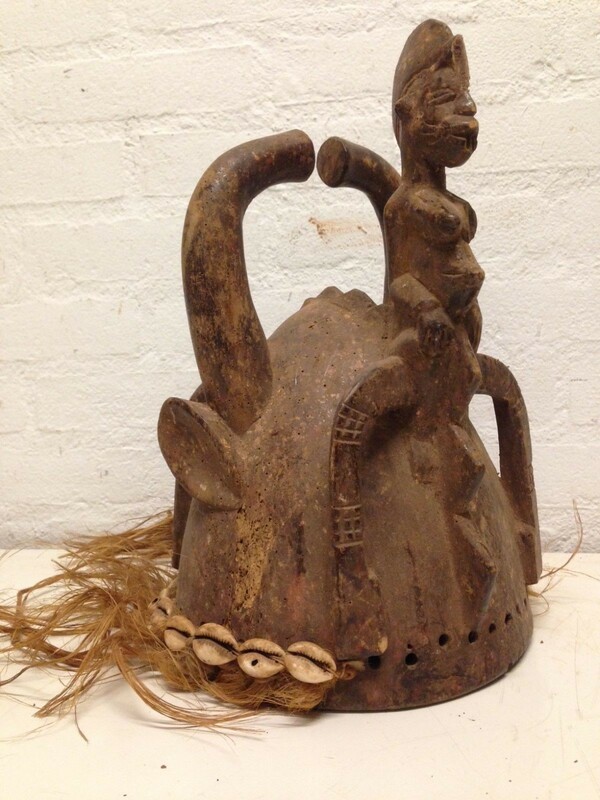 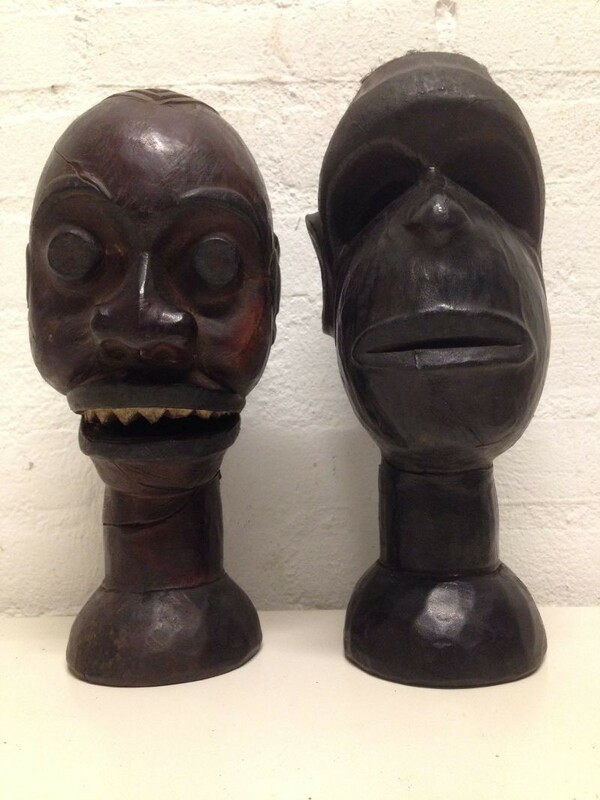 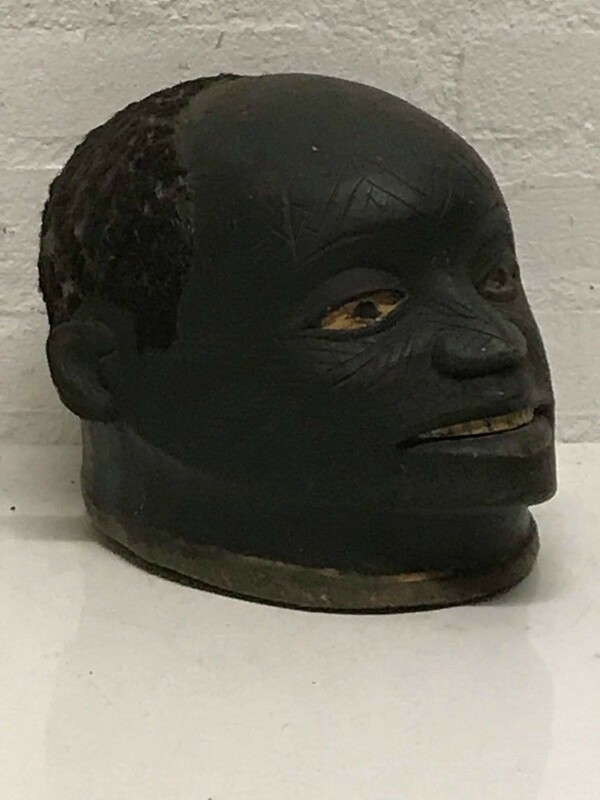 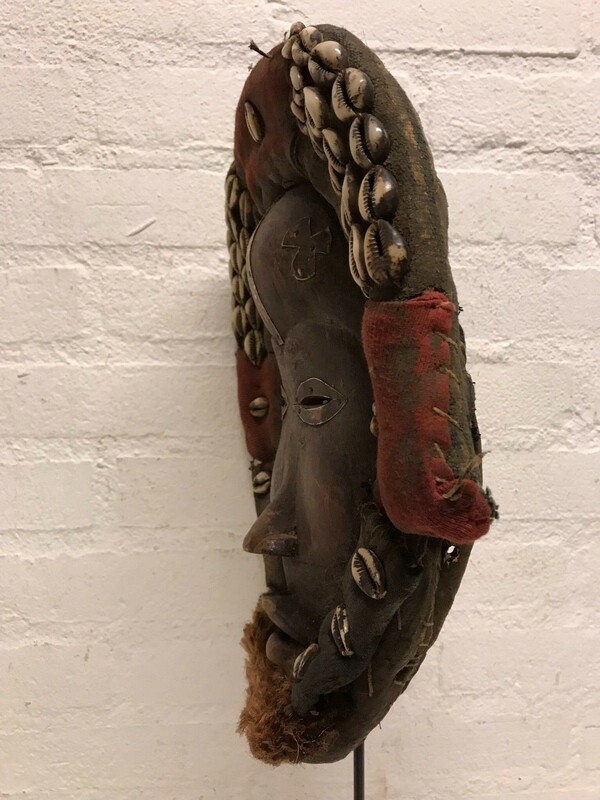 180416 - Old Tribal Used African Dan Mask - Liberia. 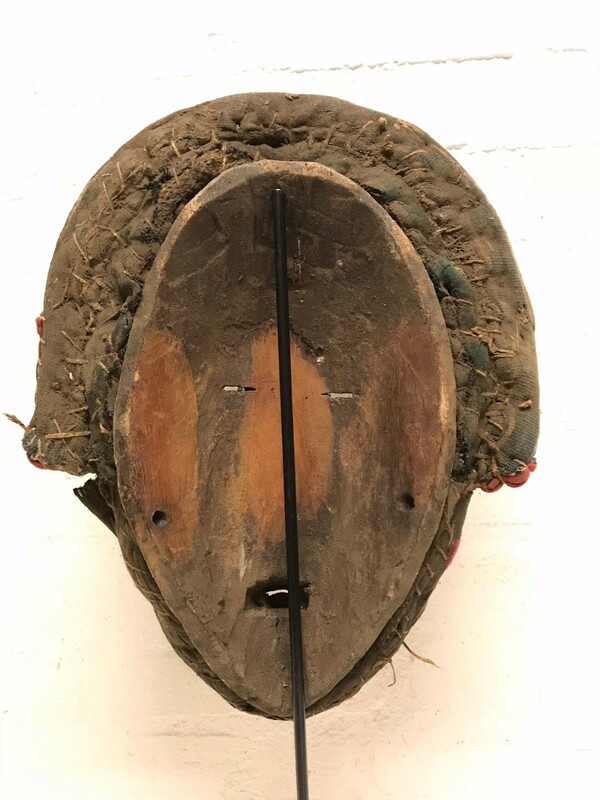 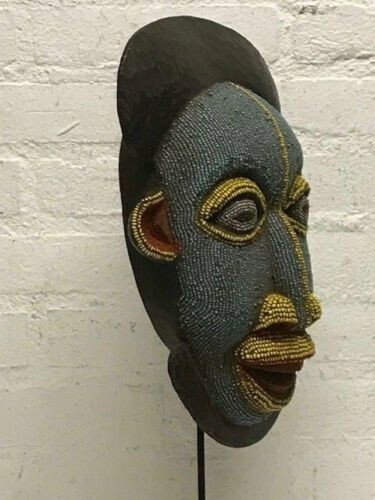 Old tribal used Dan mask from Liberia. 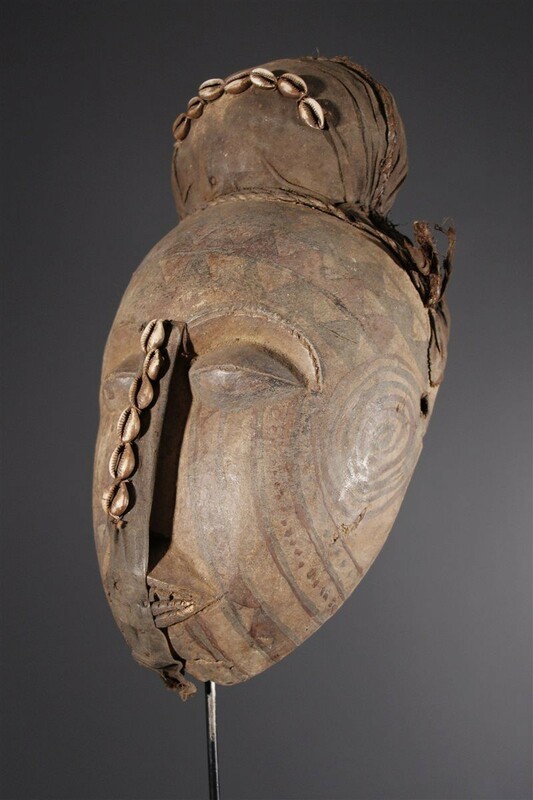 This type of masks embodies the ideal of female beauty. 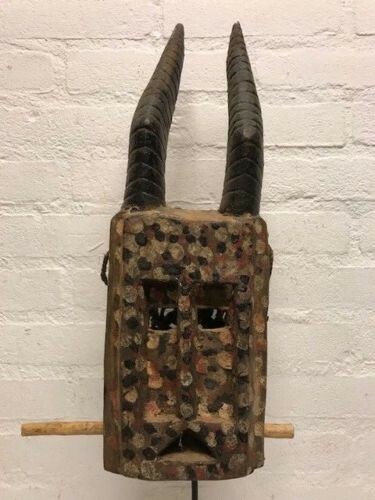 Mali: Tribal Used African Dogon Mask. 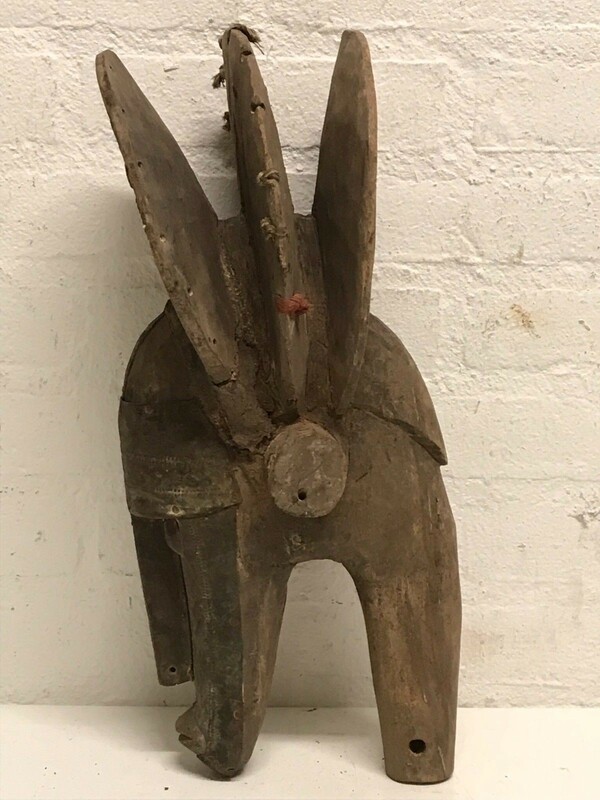 180104 - Large African Tribal used Bwoom Kuba mask. 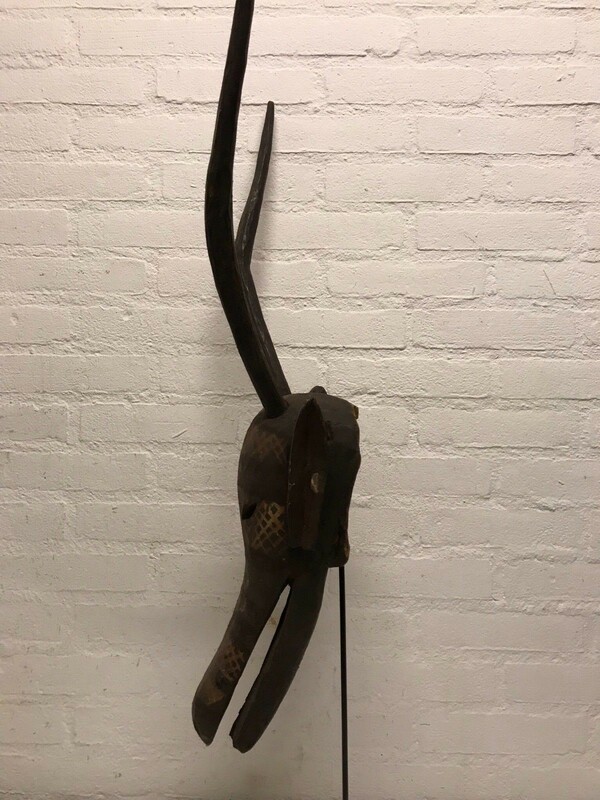 Size: 36 cm x 28 cm. 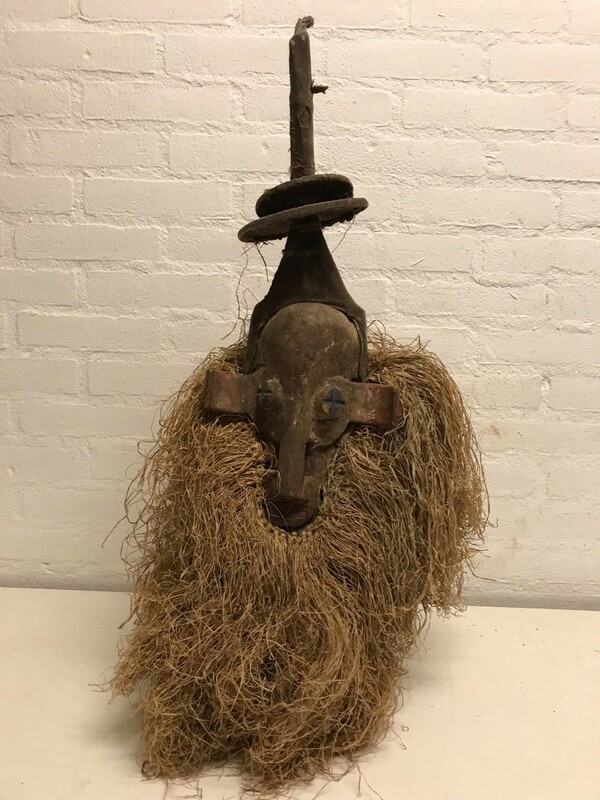 170605 - Old Tribal Used African Gurunsi mask - Burkina Faso. 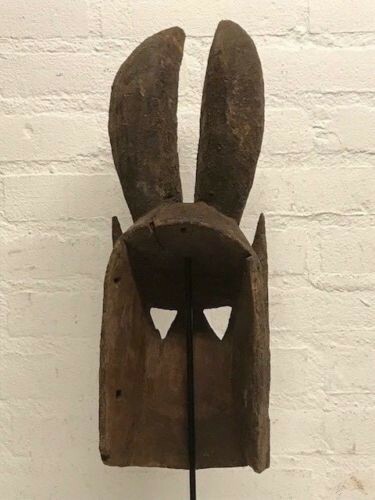 Burkina Faso: Large Old Tribal used African Animal mask from the Gurunsi. 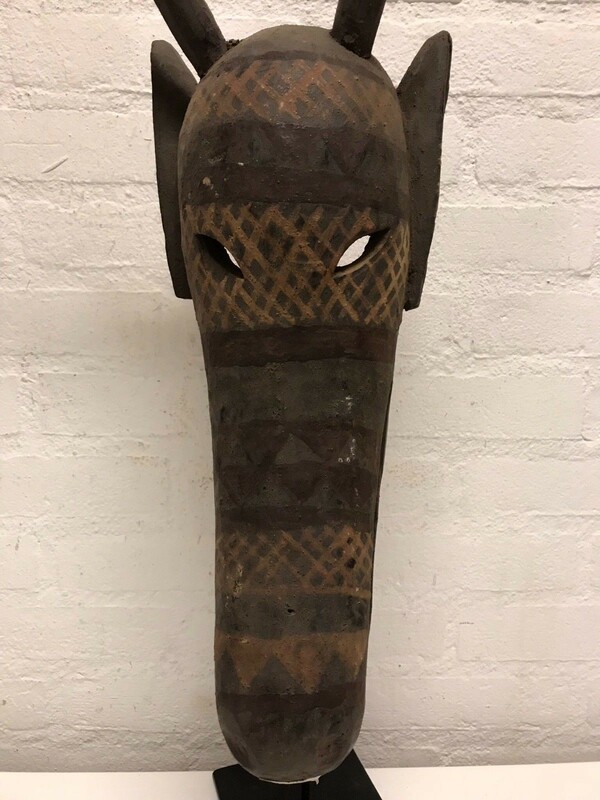 180701 - Tribal used African mask from the Bambara - Mali. 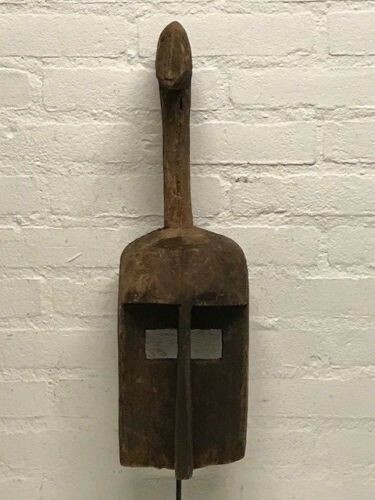 Old Tribal used Bambara mask from Mali. 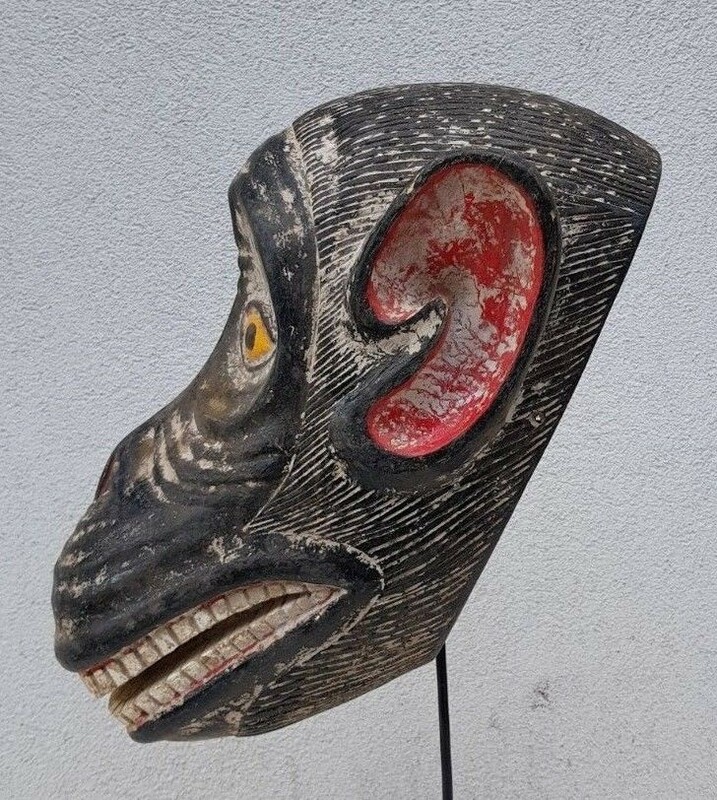 Hand carved from wood, carved decoration. 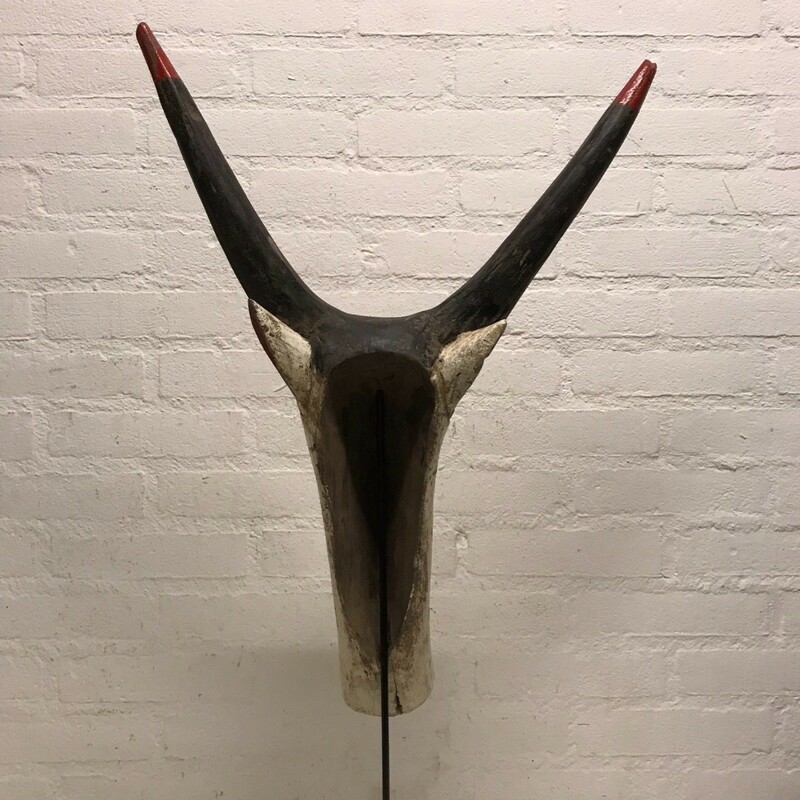 Size : 40 cm height. 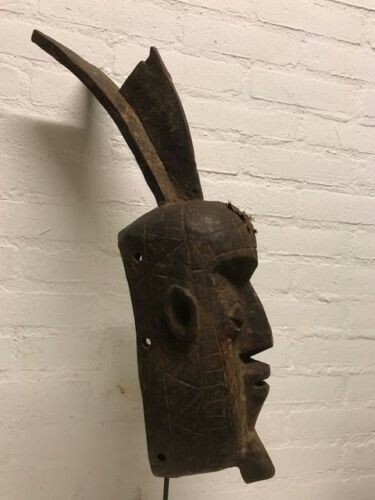 181010 - Old Tribal Used African Mask from the Dan Nguerre - Liberia. 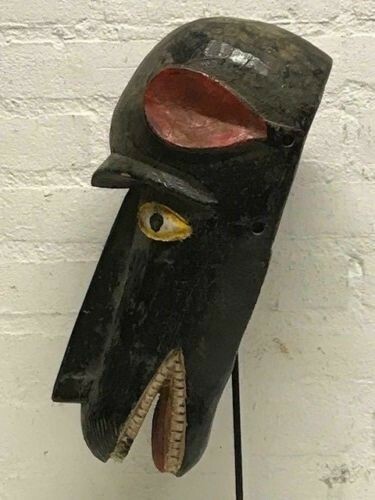 180902 - Tribal used African Bamun mask - Cameroon. 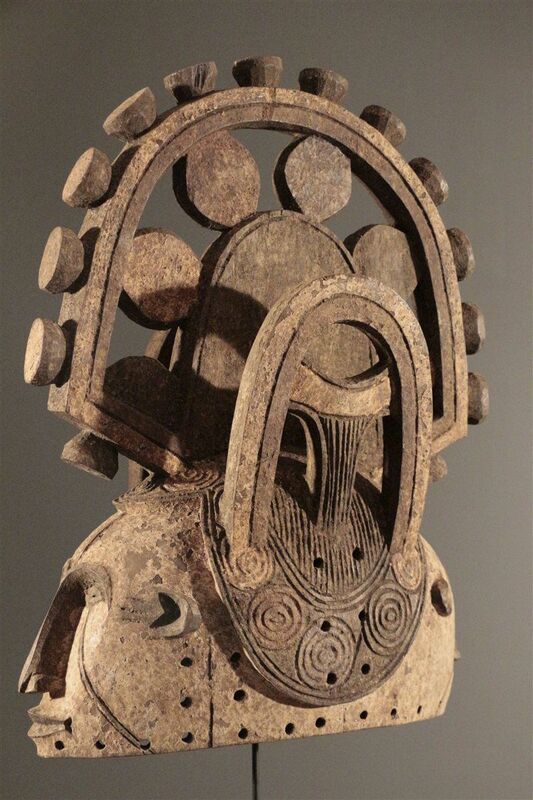 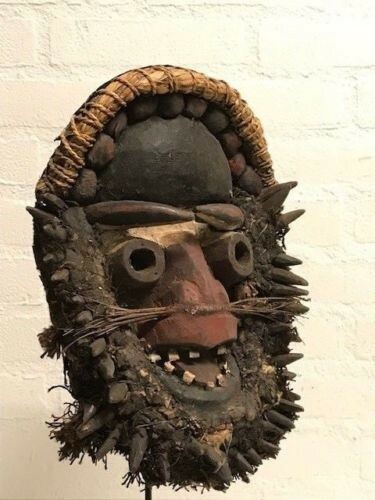 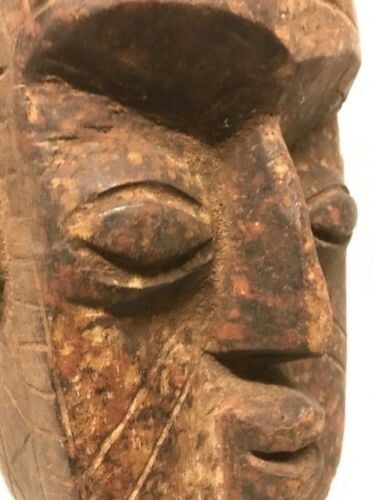 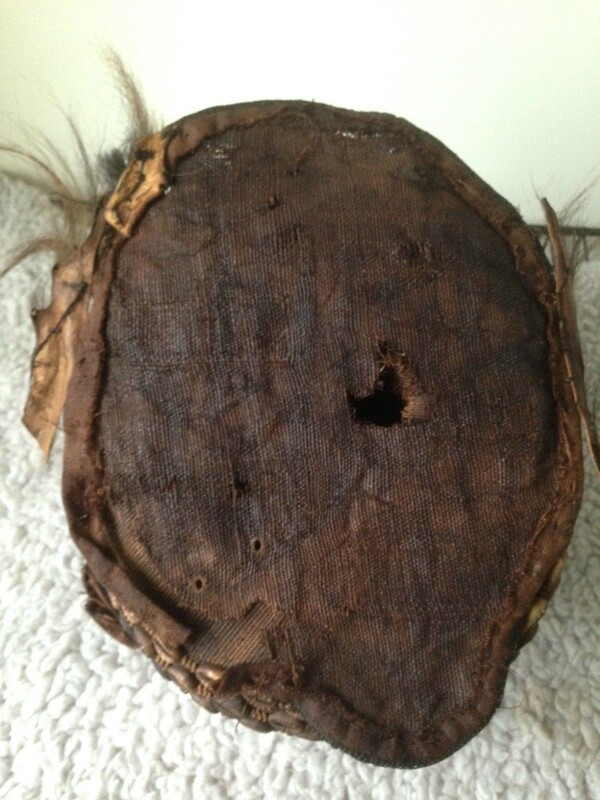 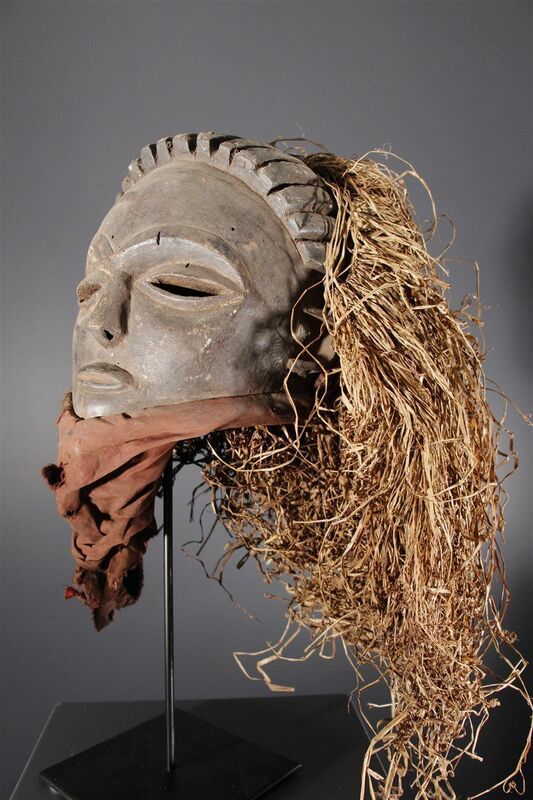 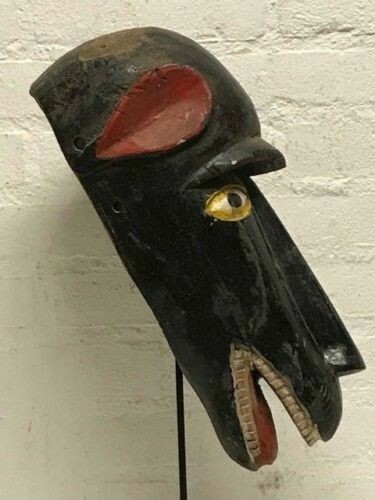 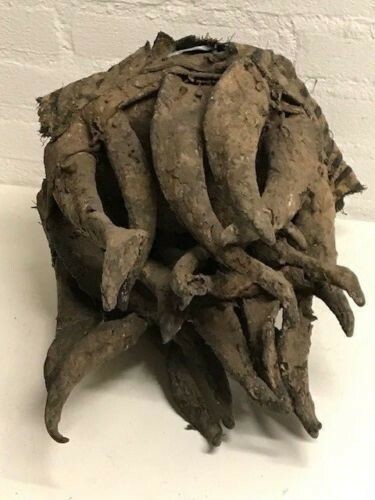 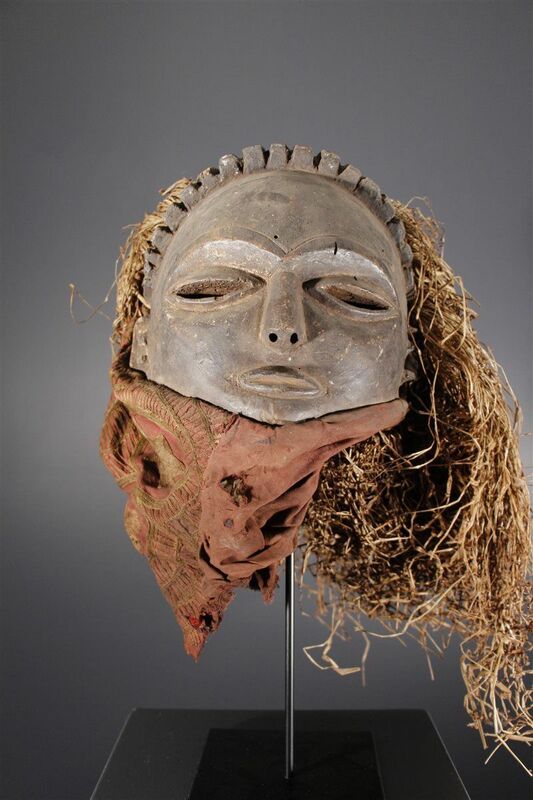 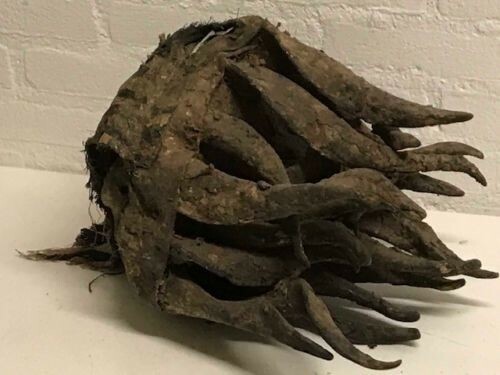 Congo: Tribal used old African Yaka mask. 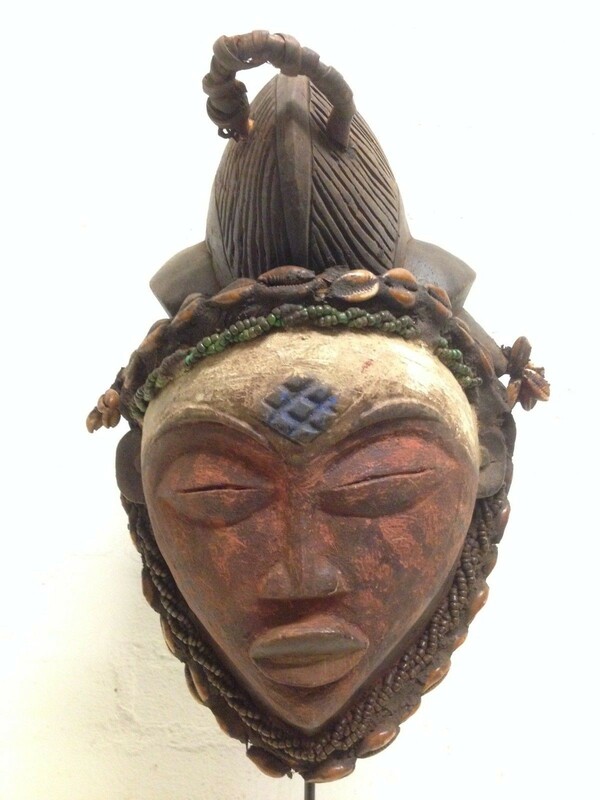 Hand carved from a single piece of wood, with color pigments and Raffia. 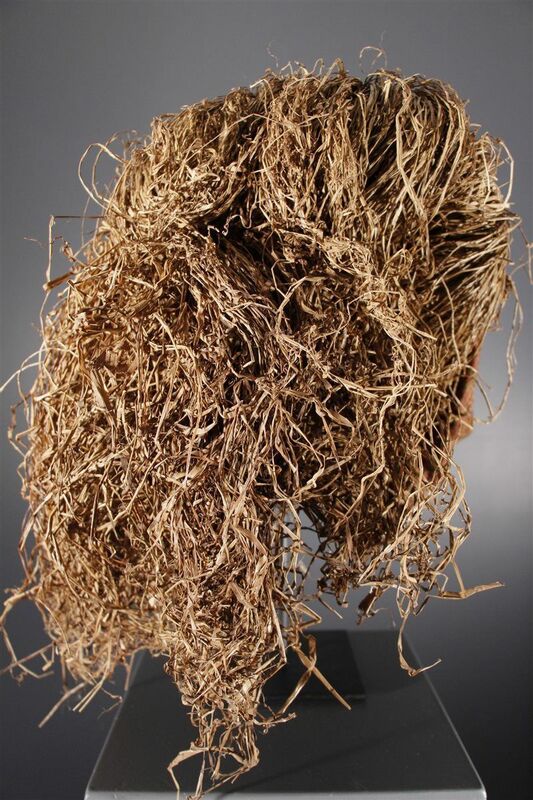 Height: 62 cm. 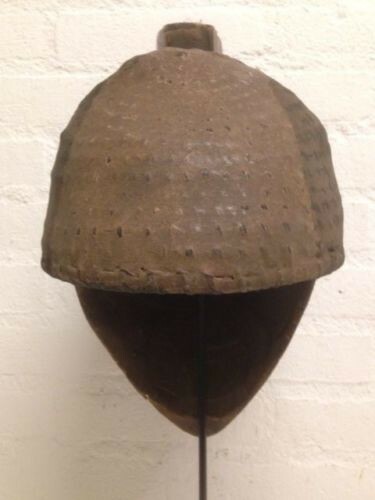 ( only the wood part and the cap on the head). 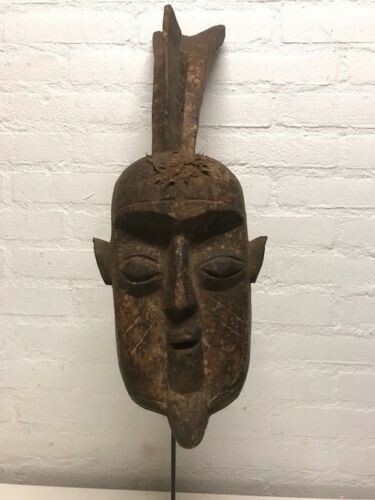 180448 - Old Tribal Used African Dan Mask - Liberia. 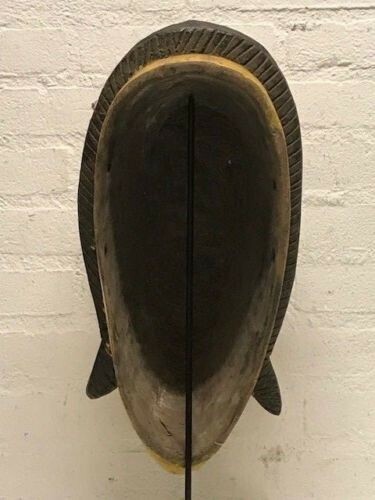 Size: 30 cm only the wooden part. 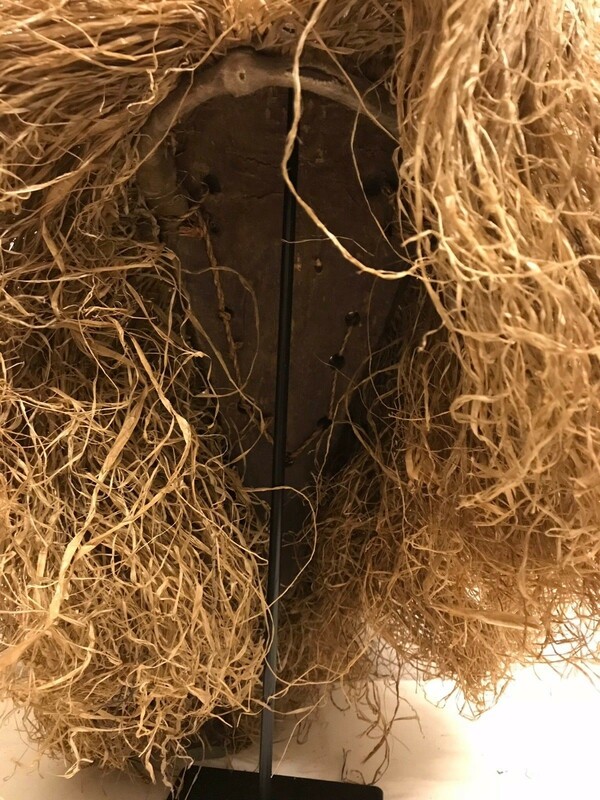 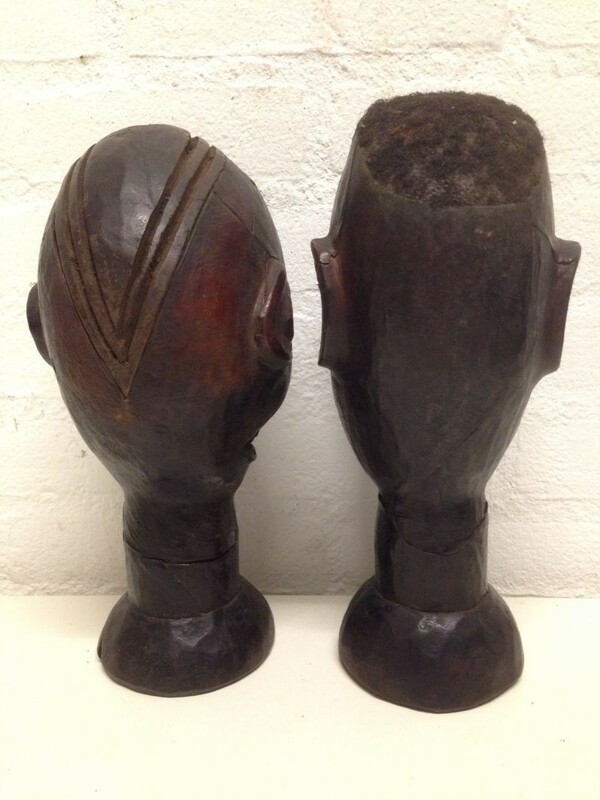 170218 - African Ekoi male & female heads real hair - Nigeria. 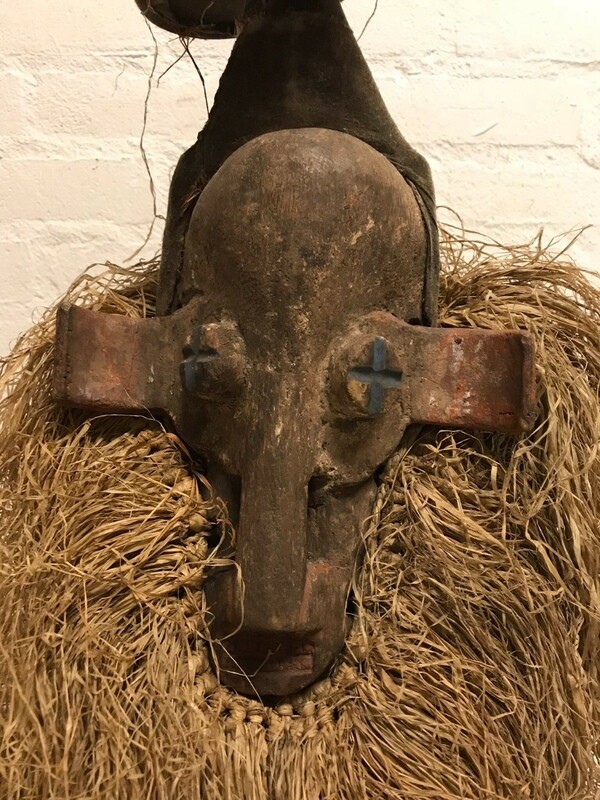 Nigeria, Tribal used Old African 2 Ekoi male & female head, leather, real hair. 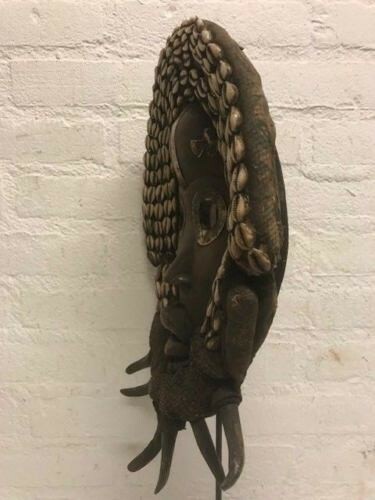 Hand carved from wood and covered with leather. 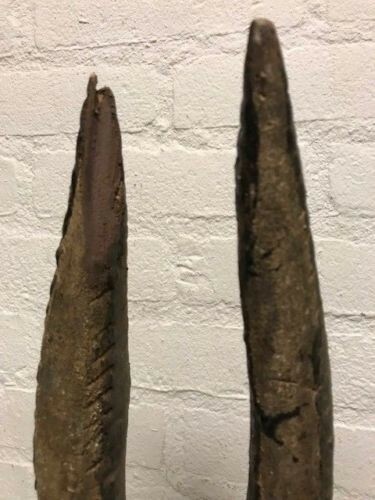 Height: 27 cm and 29 cm. 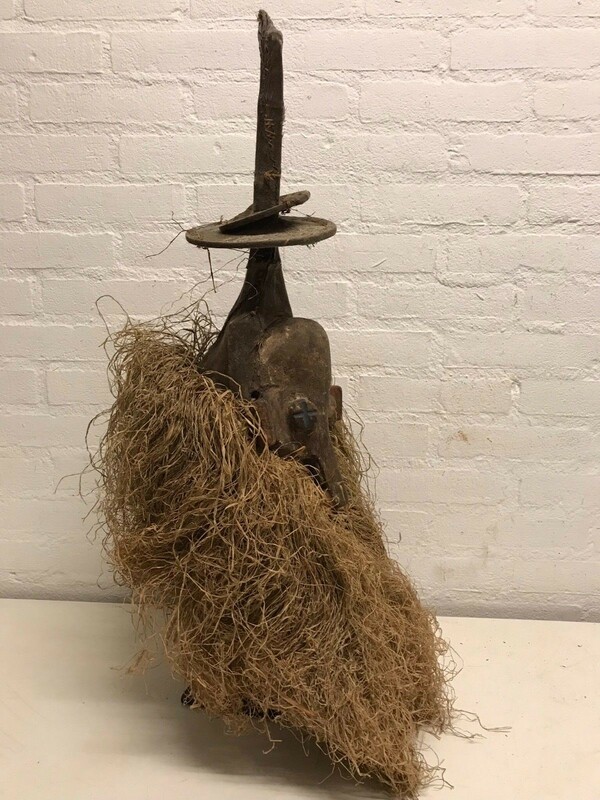 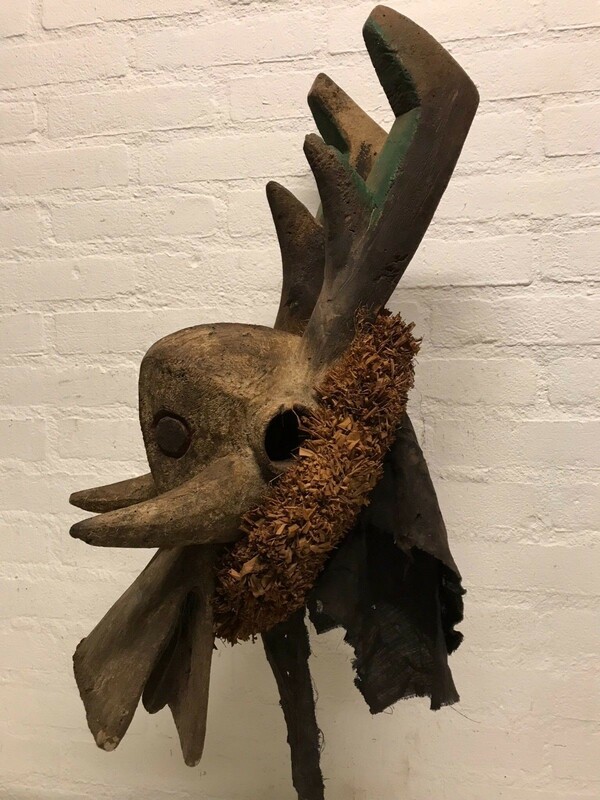 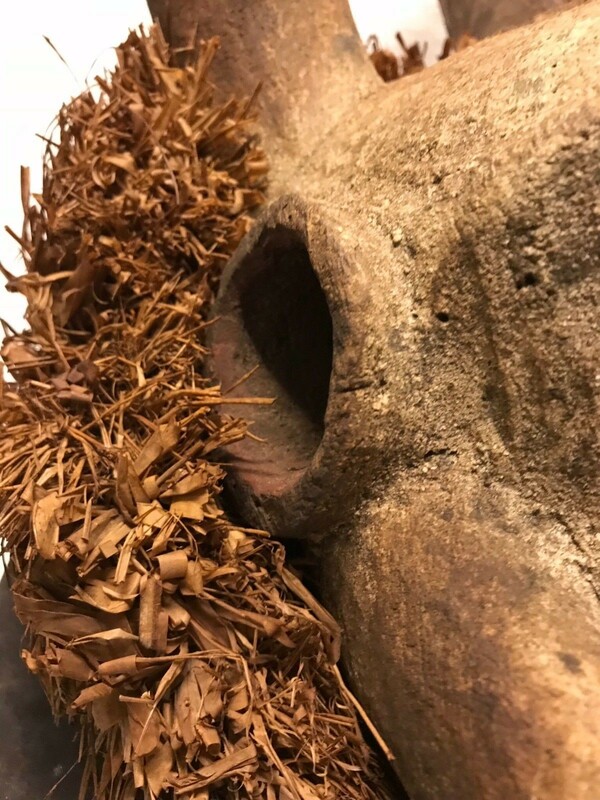 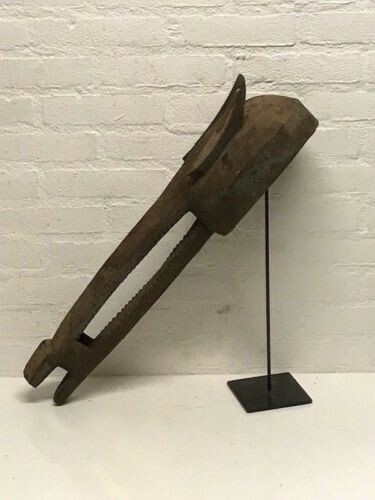 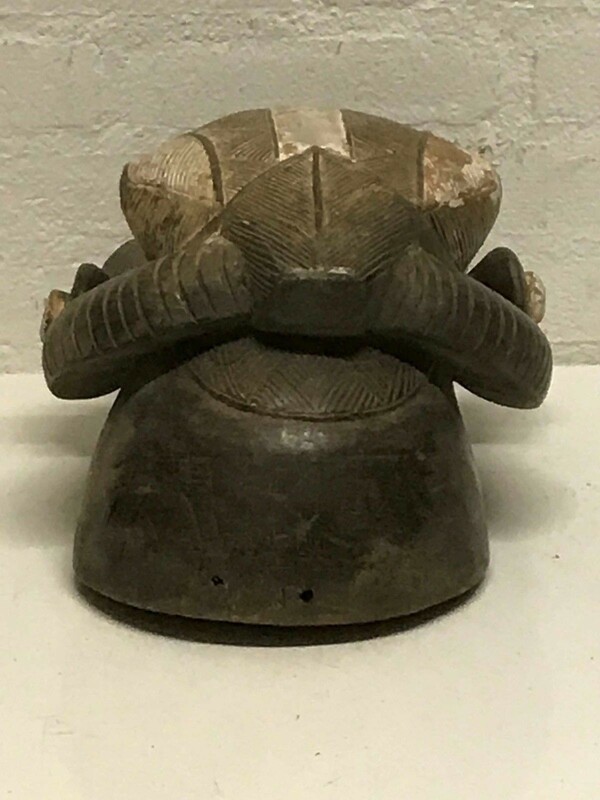 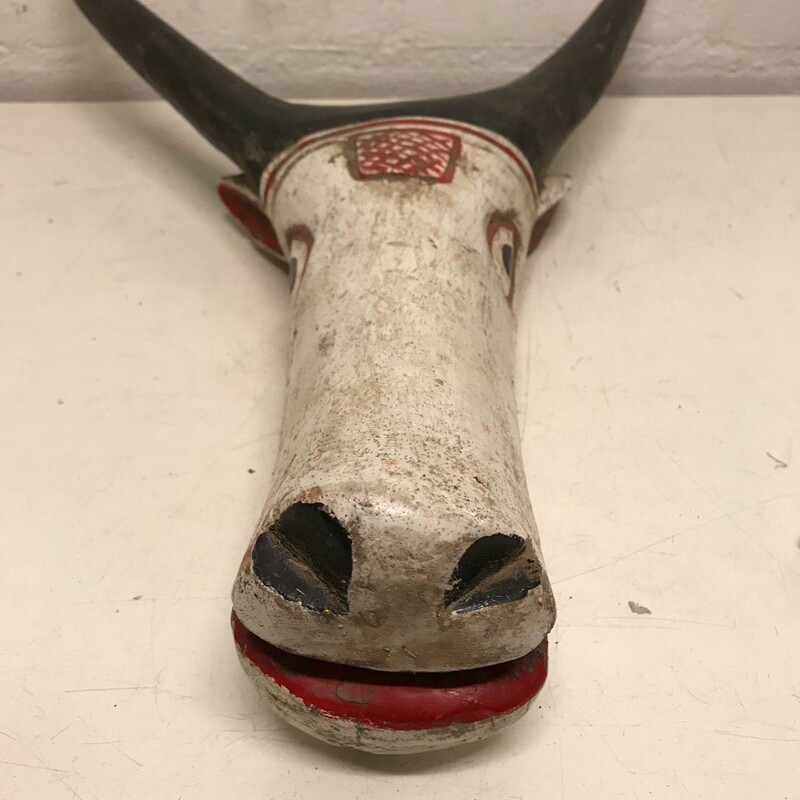 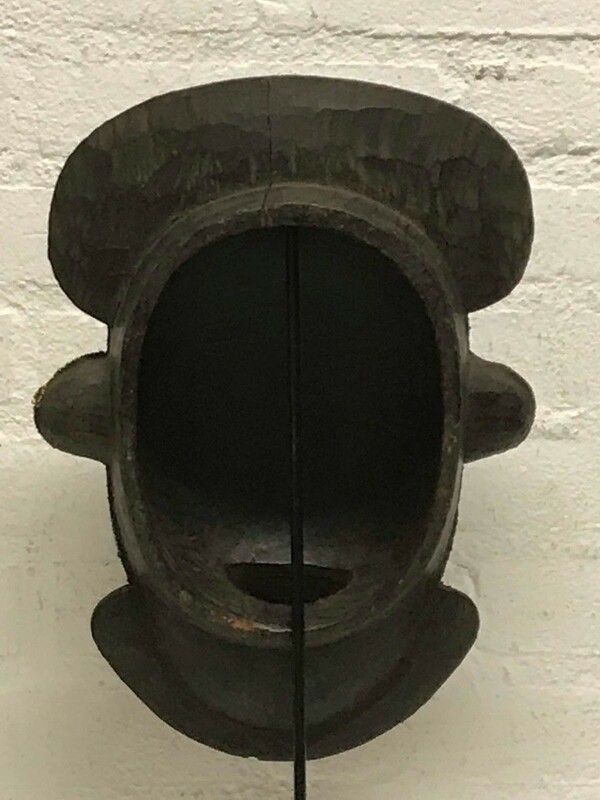 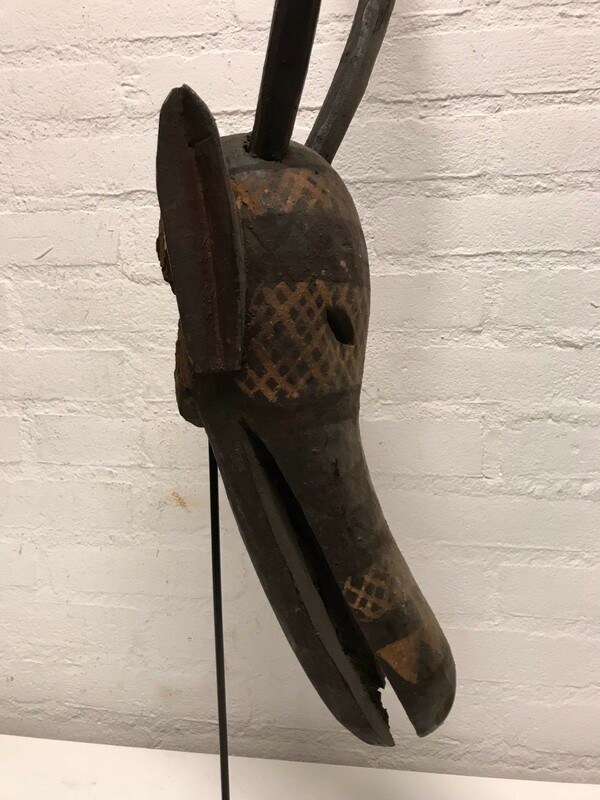 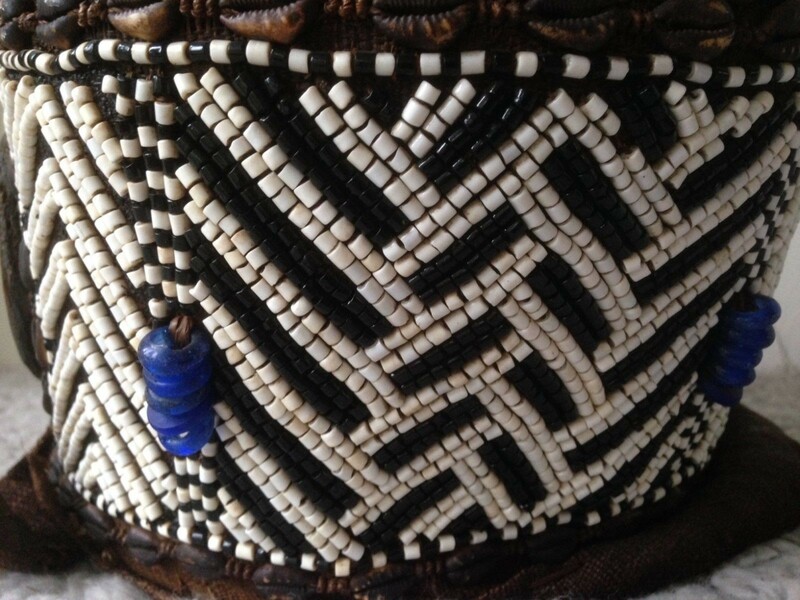 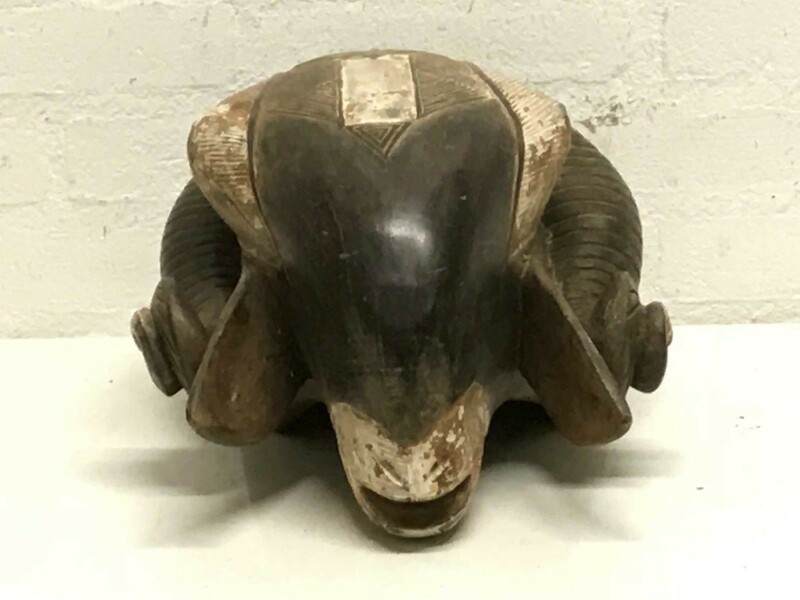 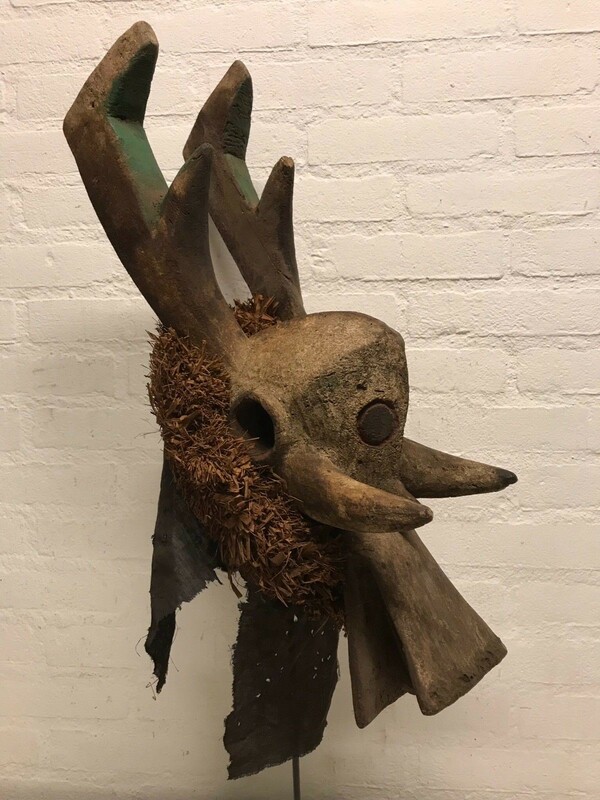 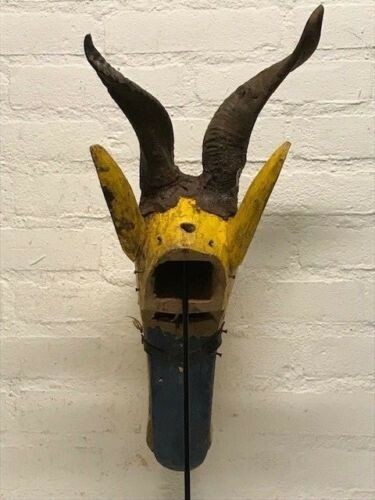 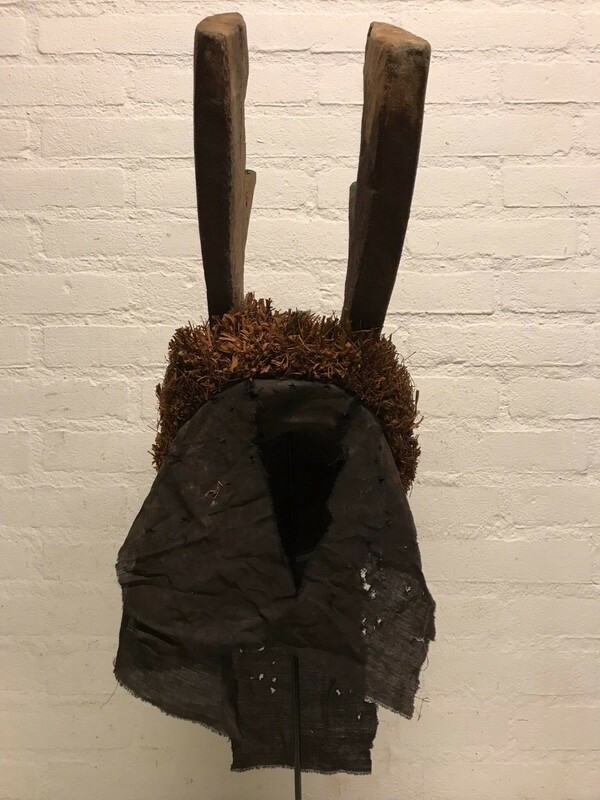 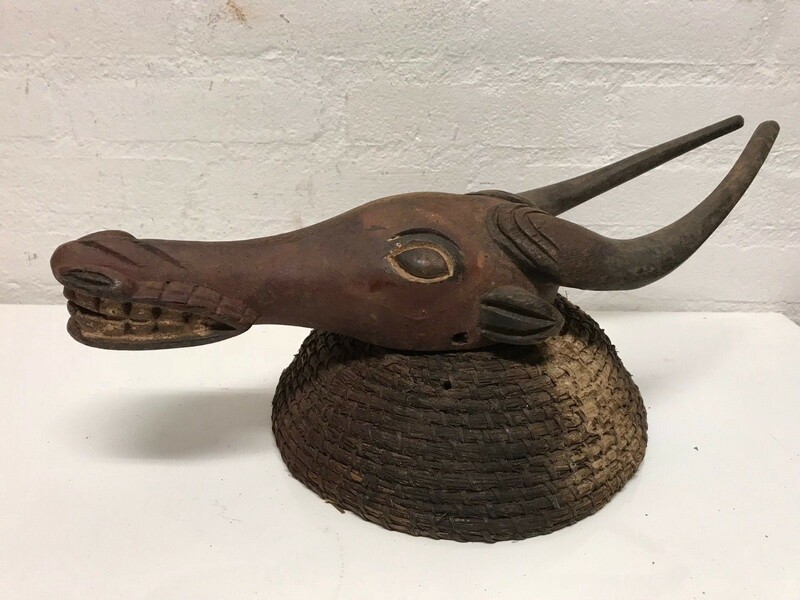 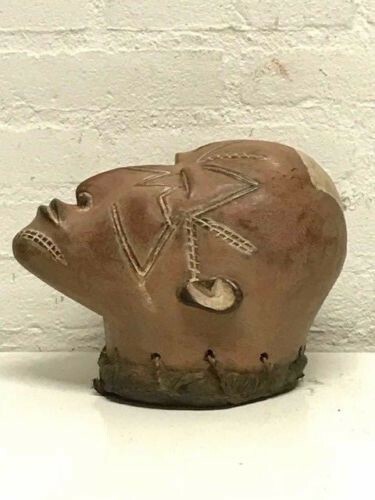 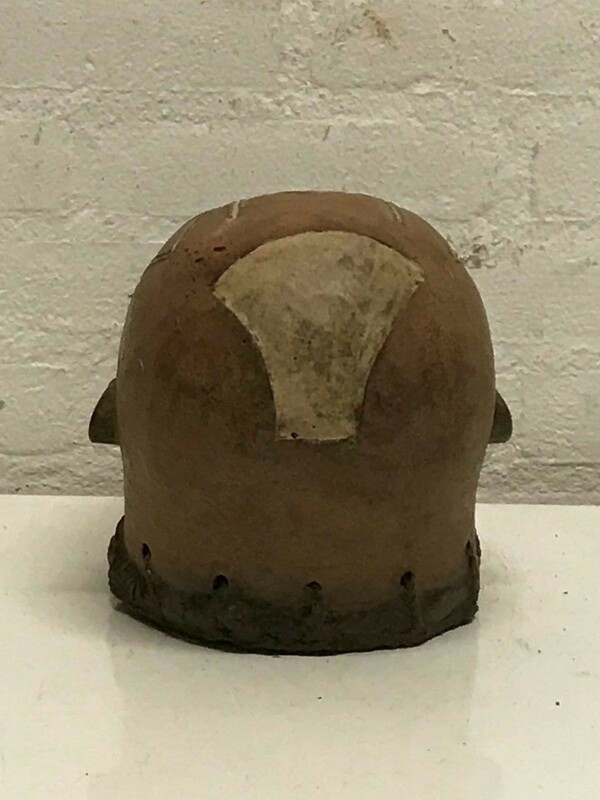 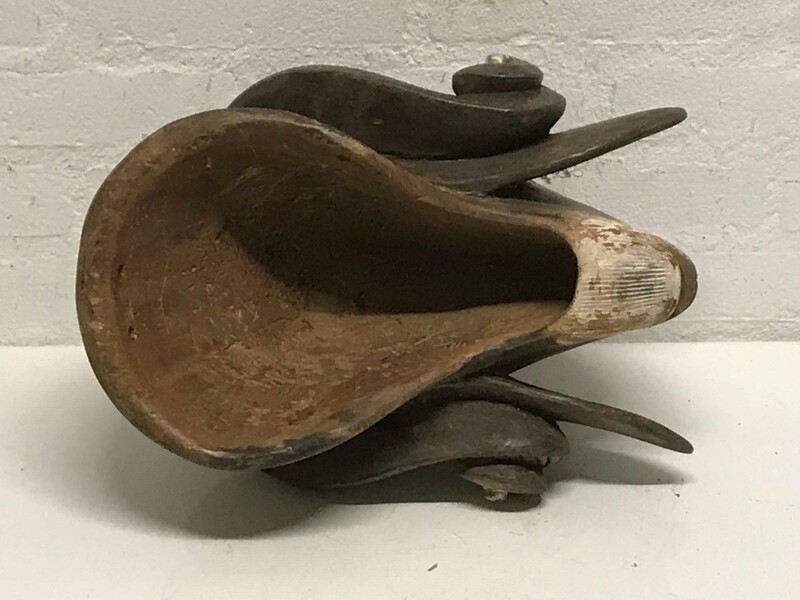 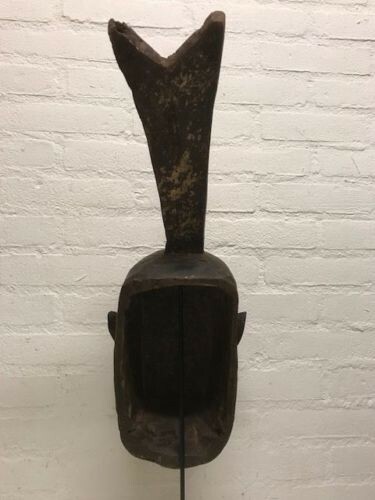 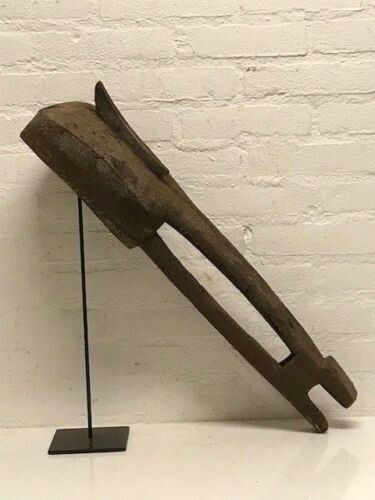 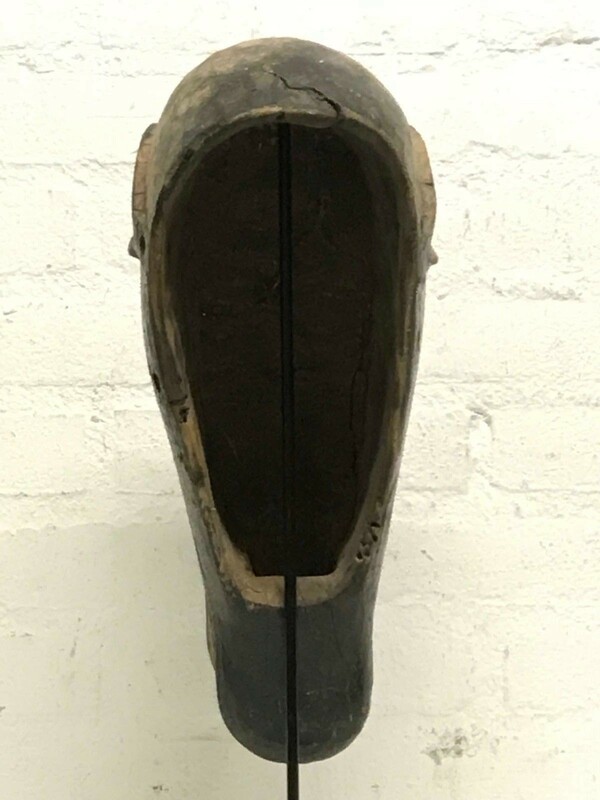 180652 - Tribal used African Senufo head mask - Iv. 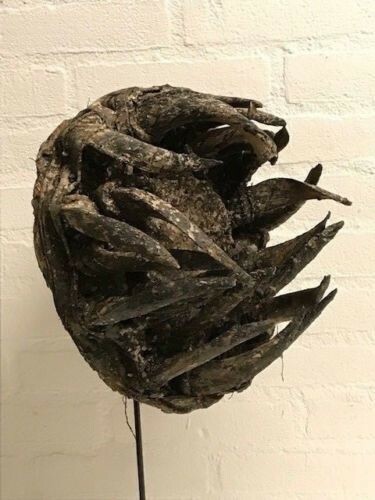 Coast. 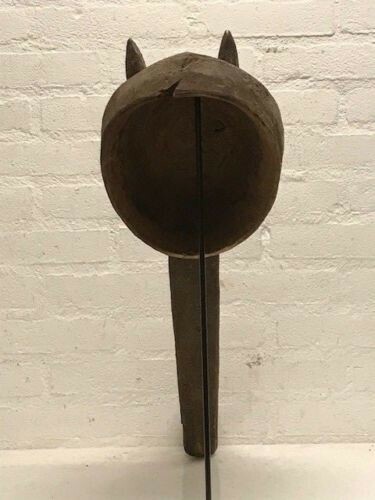 Large Tribal used African Senufo mask, Iv. 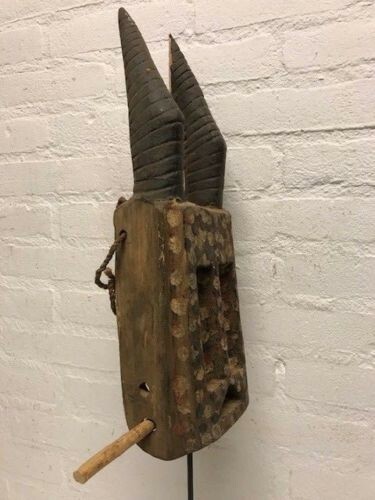 Coast. 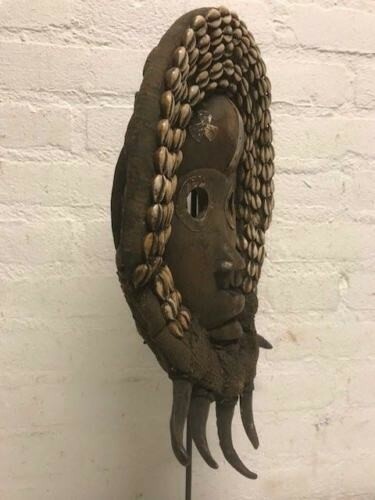 Tribal used african Old mask from the Punu, Gabon. 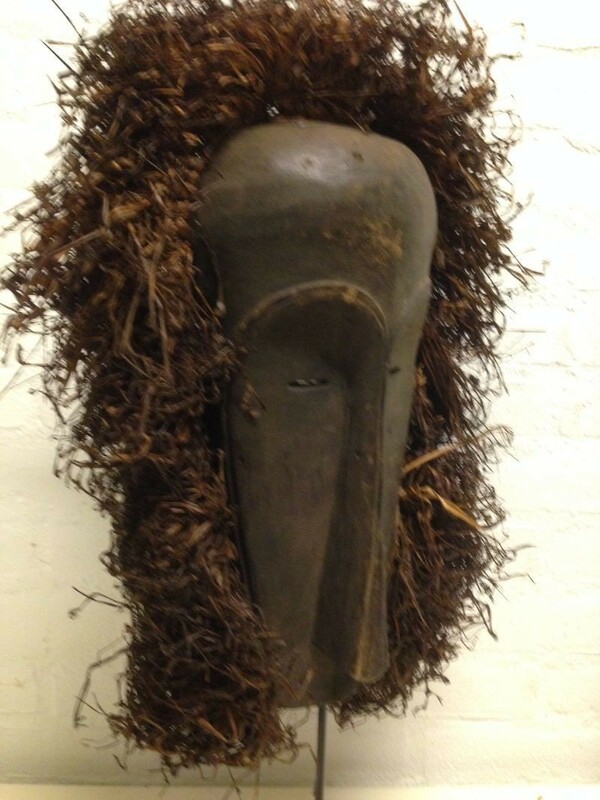 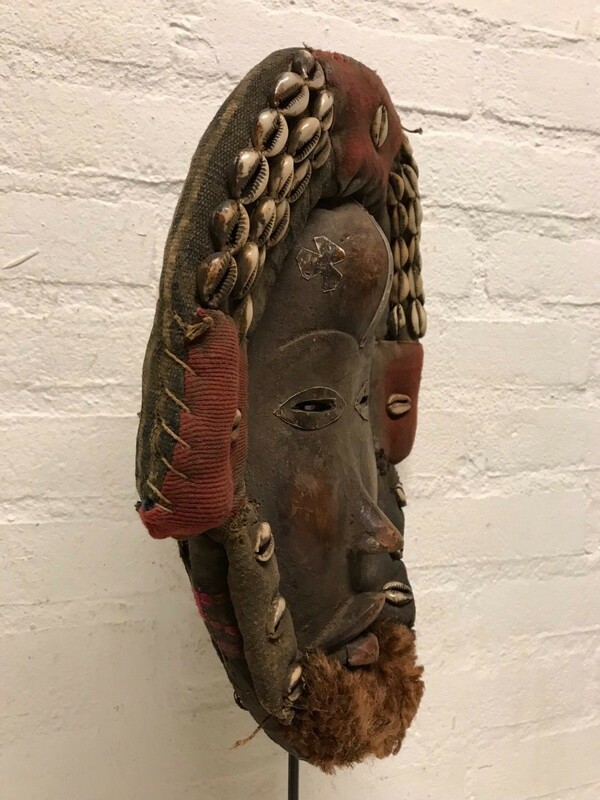 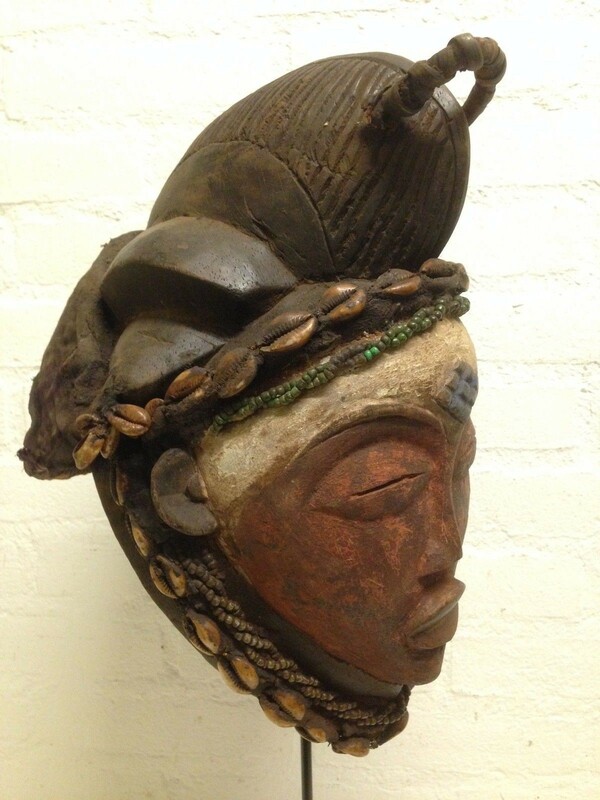 180425- Tribal used Old African female Punu mask - Gabon. 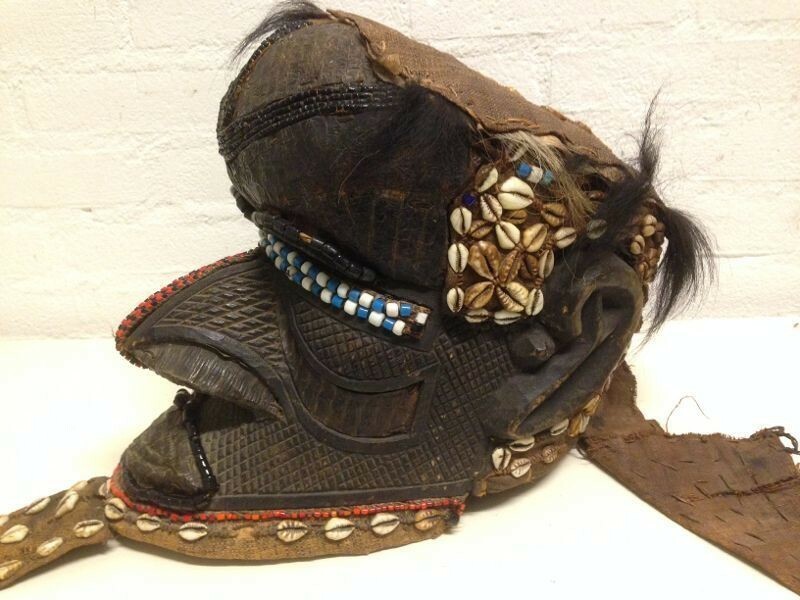 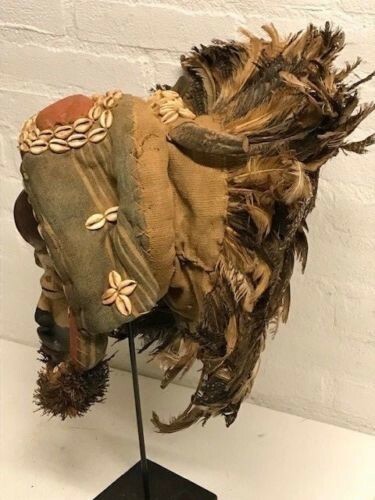 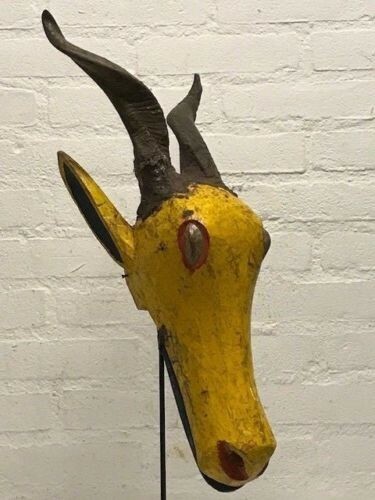 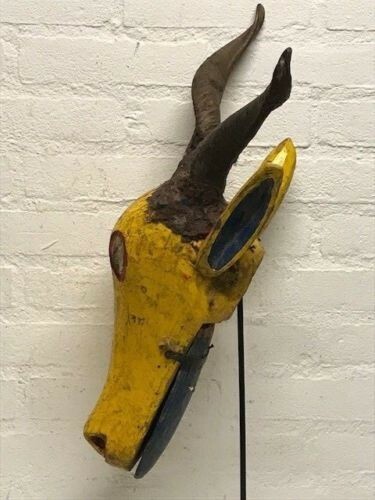 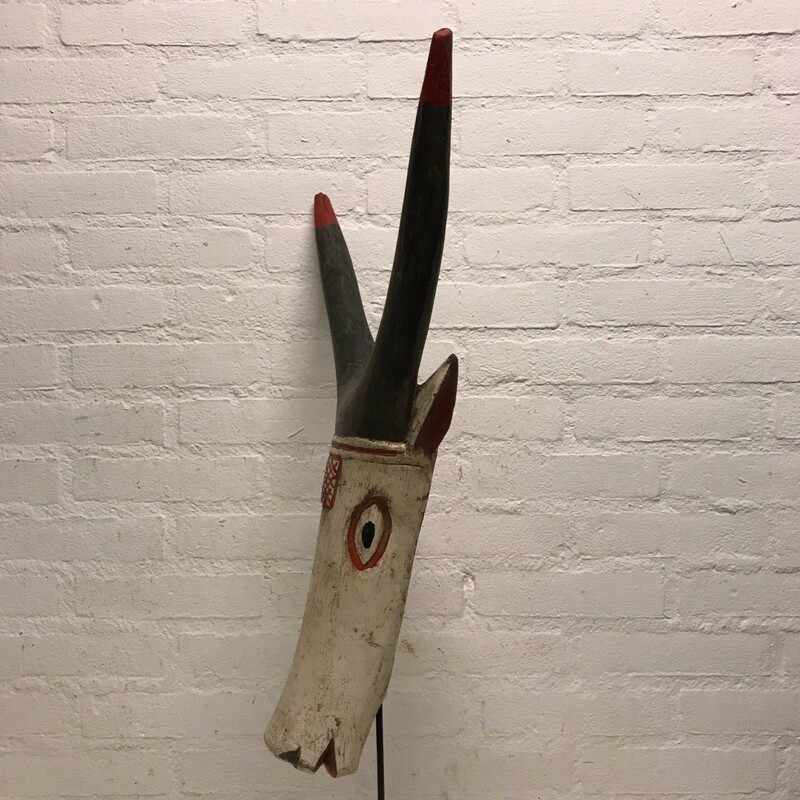 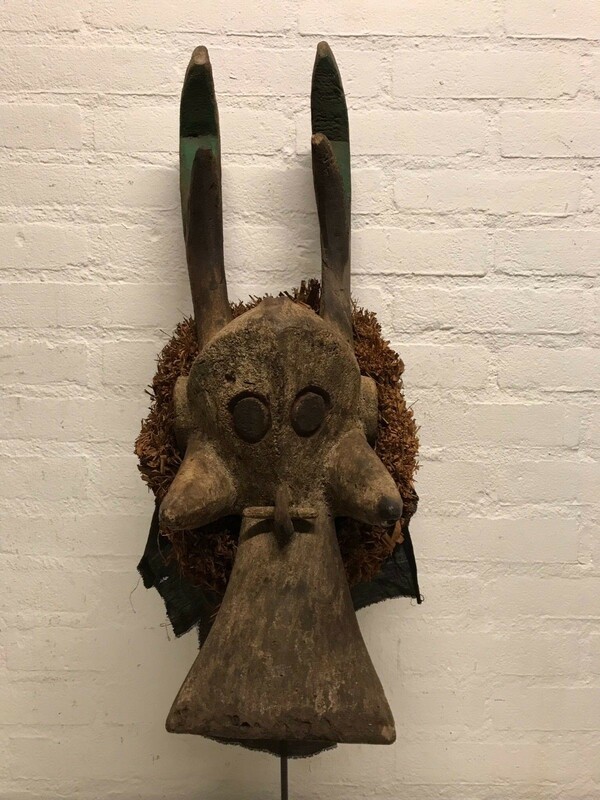 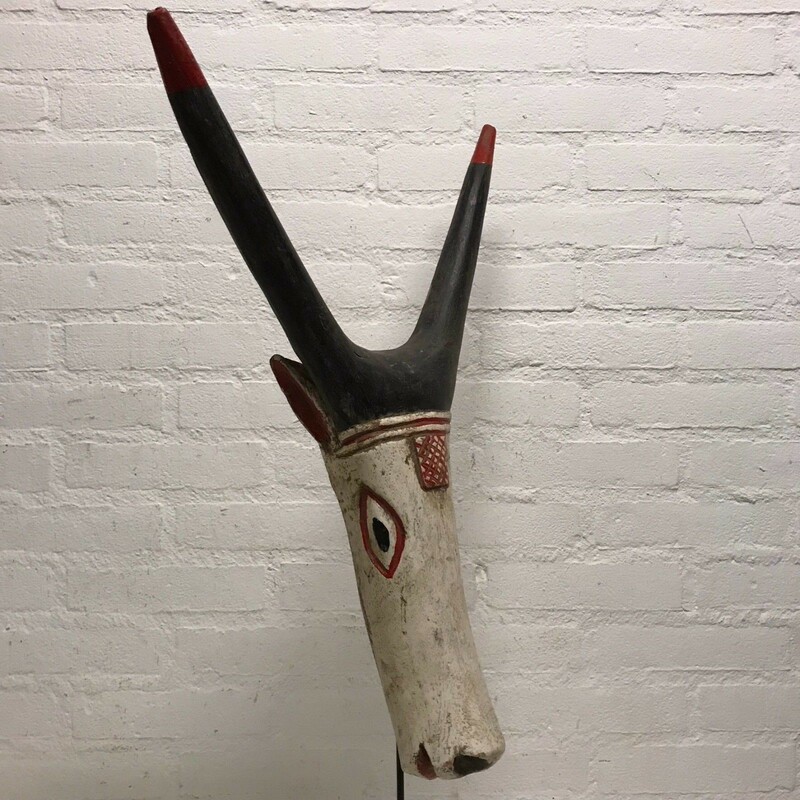 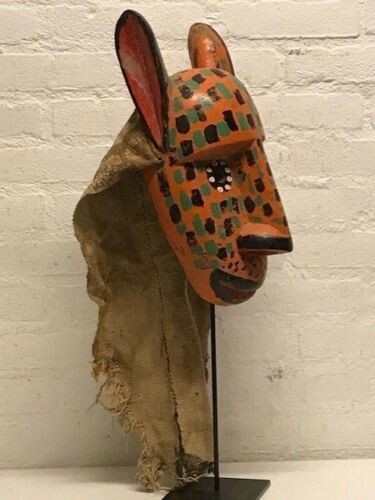 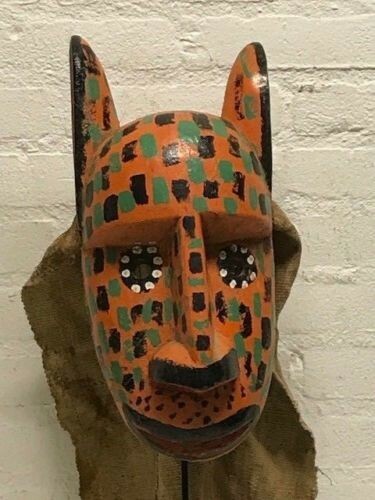 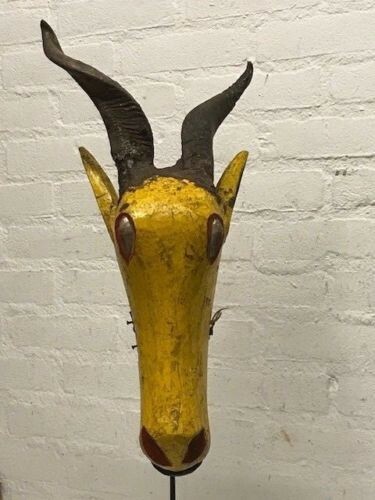 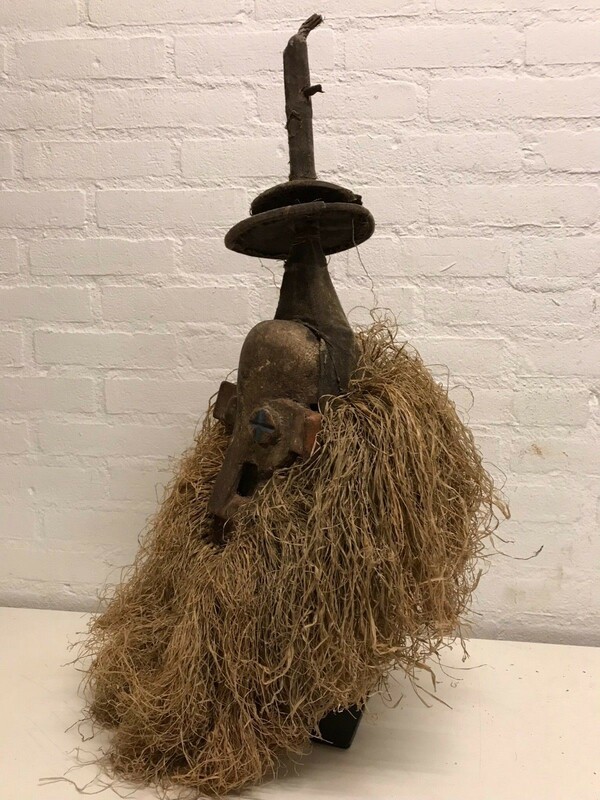 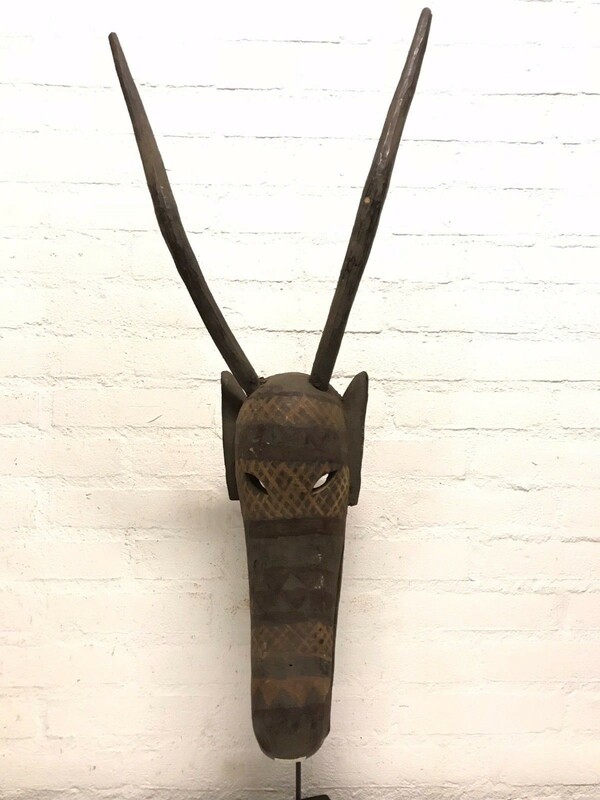 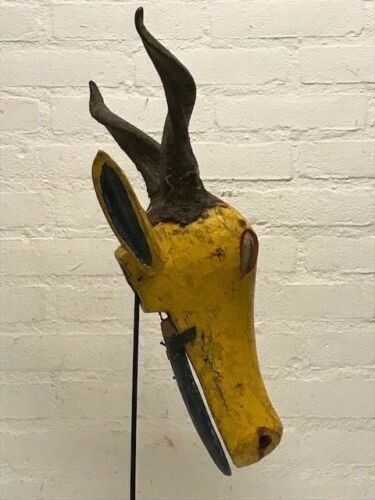 180921 - Tribal Used African Bozo animal mask from Mali. 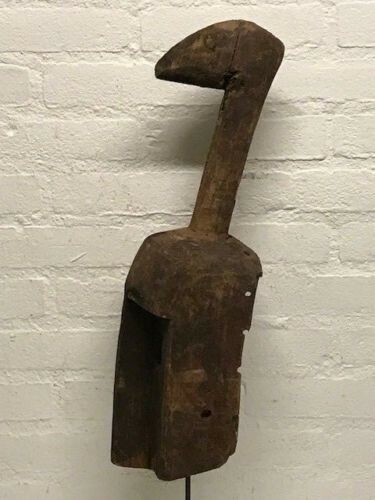 Mali : Rare Tribal Used African Bozo Animal Marionet. 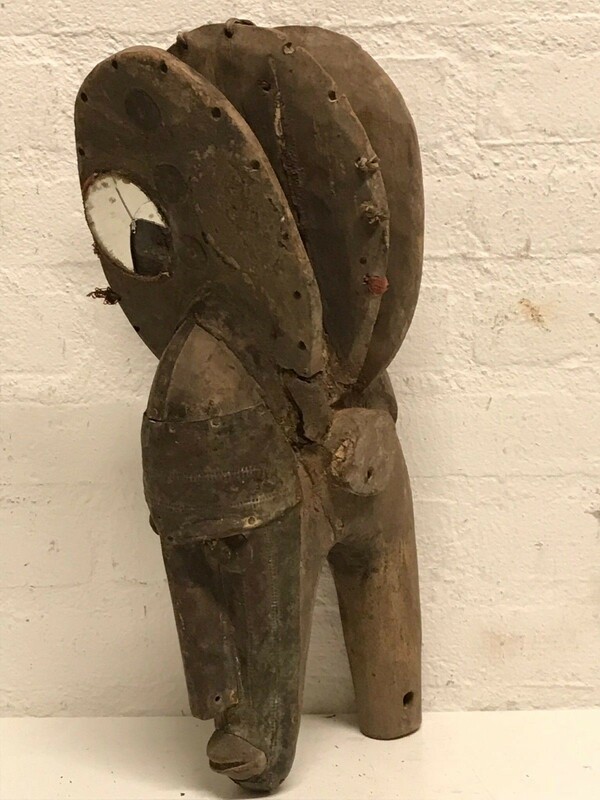 Size : 38 cm height. 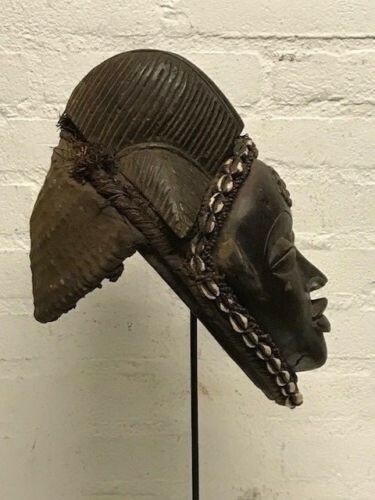 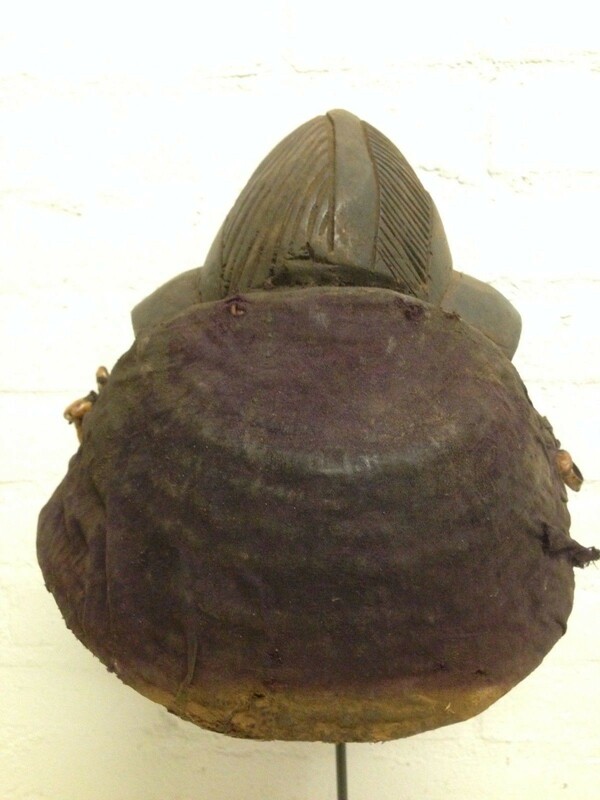 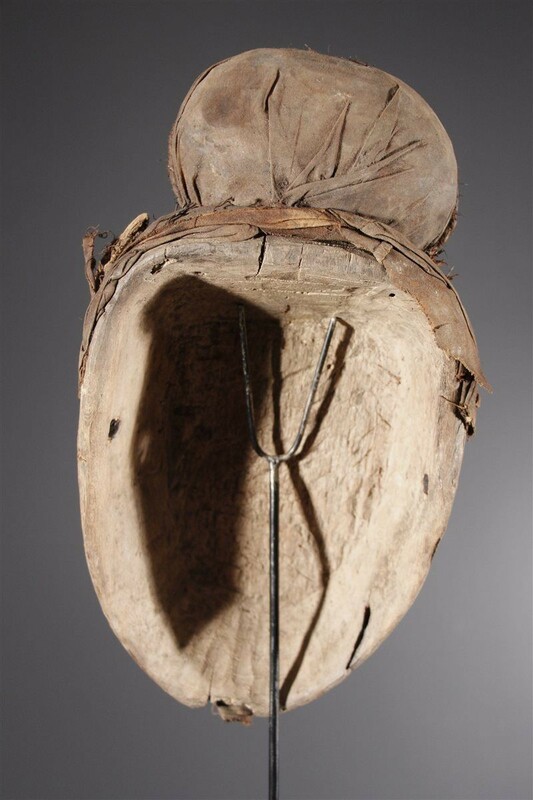 180900 - Tribal used Makonde helm mask - Tanzania. 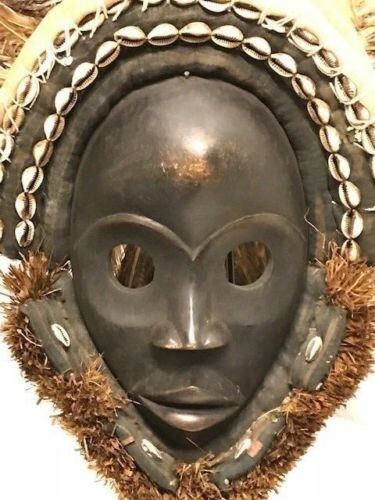 Tanzania: Rare tribal used old Black Makonde helm mask. 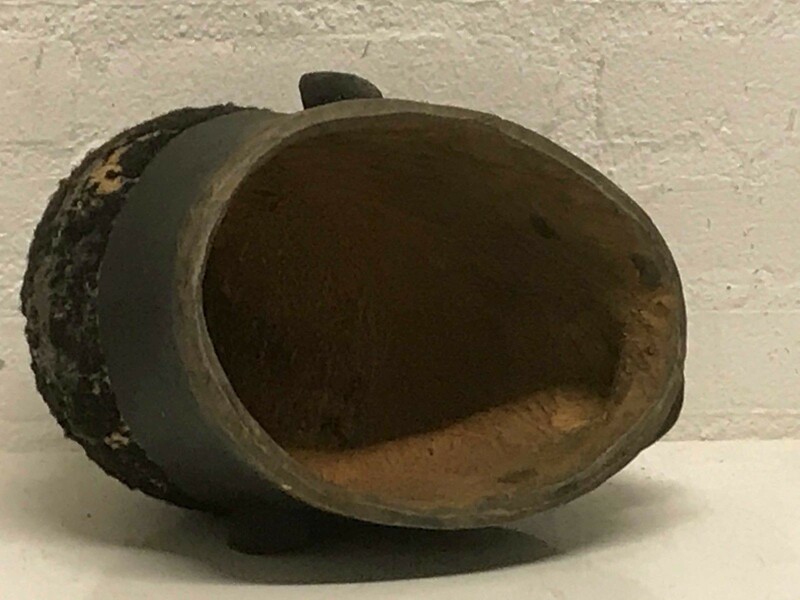 Size: 27 cm x 19 cm. 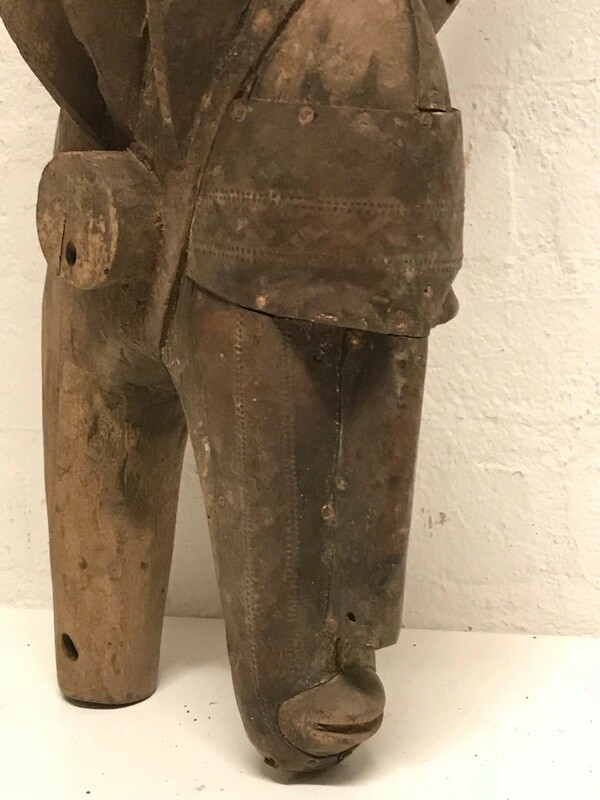 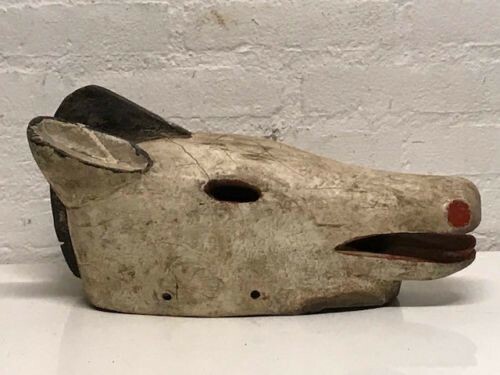 180605 - Old Tribal Used African Dogon Mask - Mali. 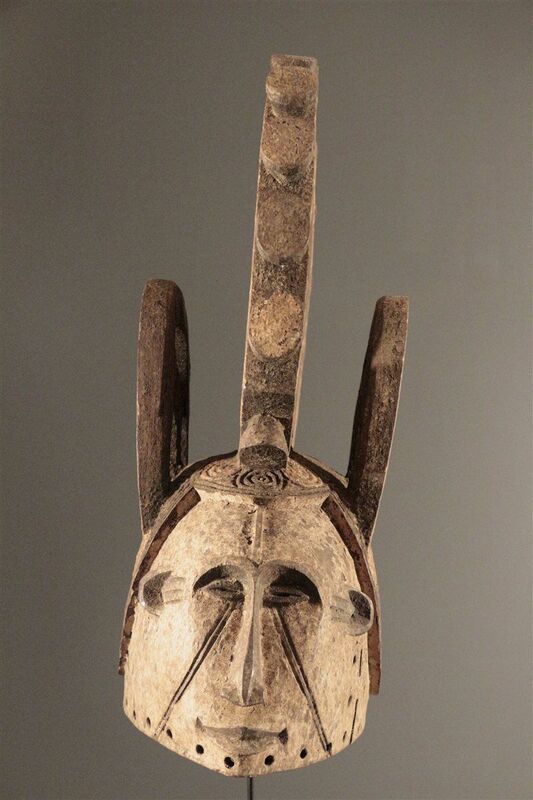 Mali: Old Tribal Used African Dogon Mask. 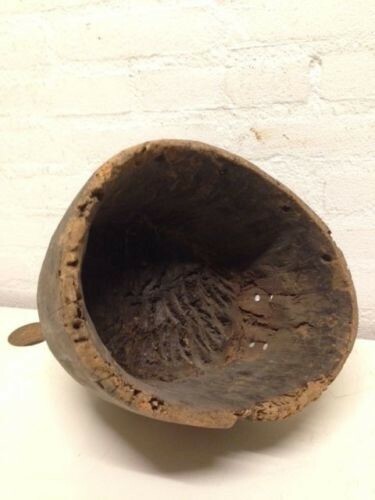 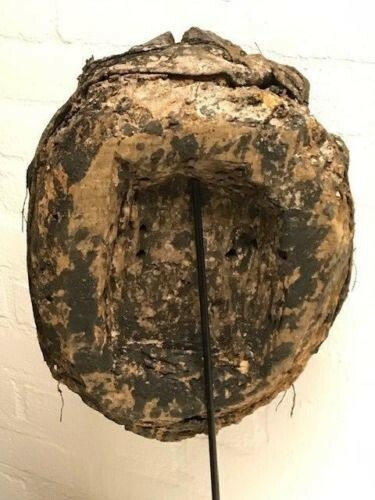 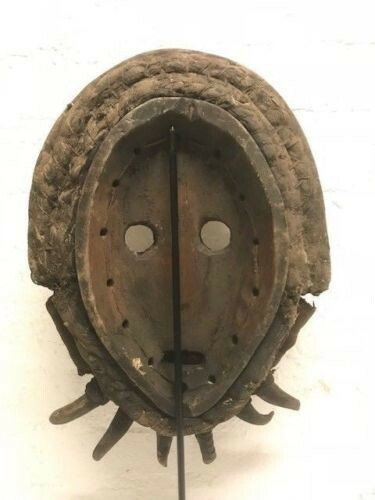 180753 - Rare tribal used old Makonde helm mask - Tanzania. 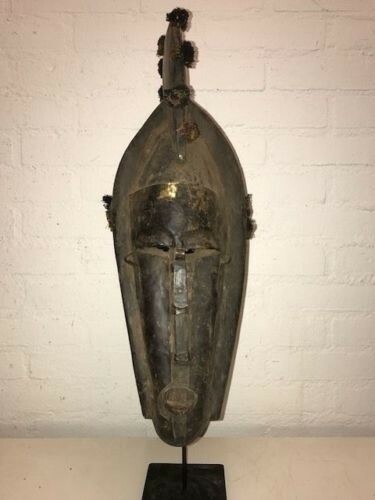 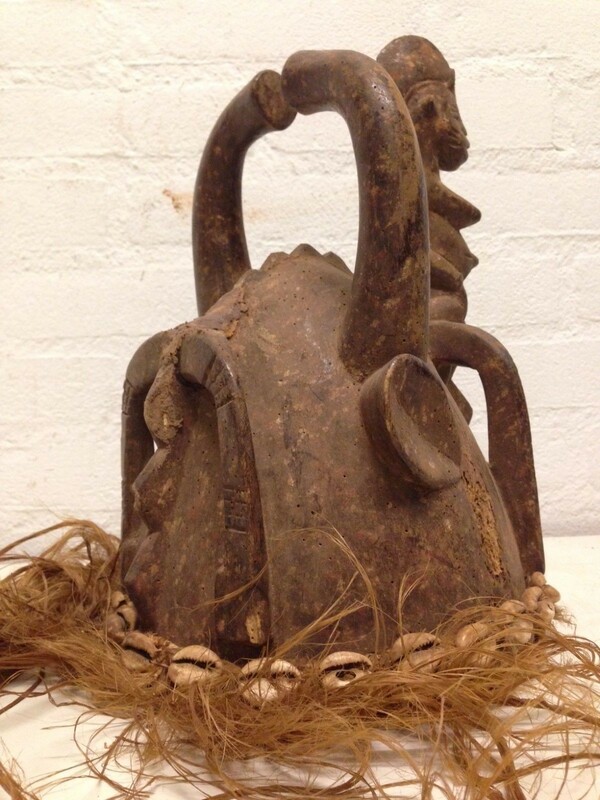 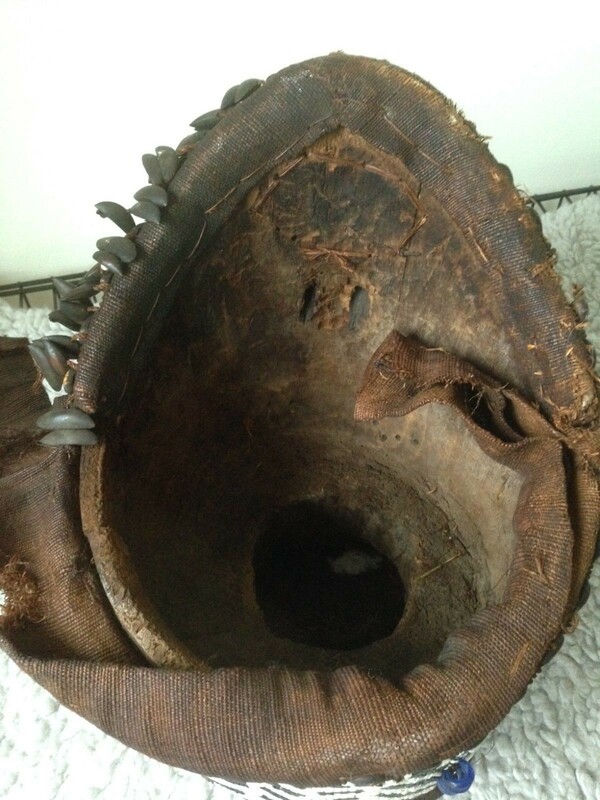 Tanzania: Rare tribal used old Makonde helm mask. 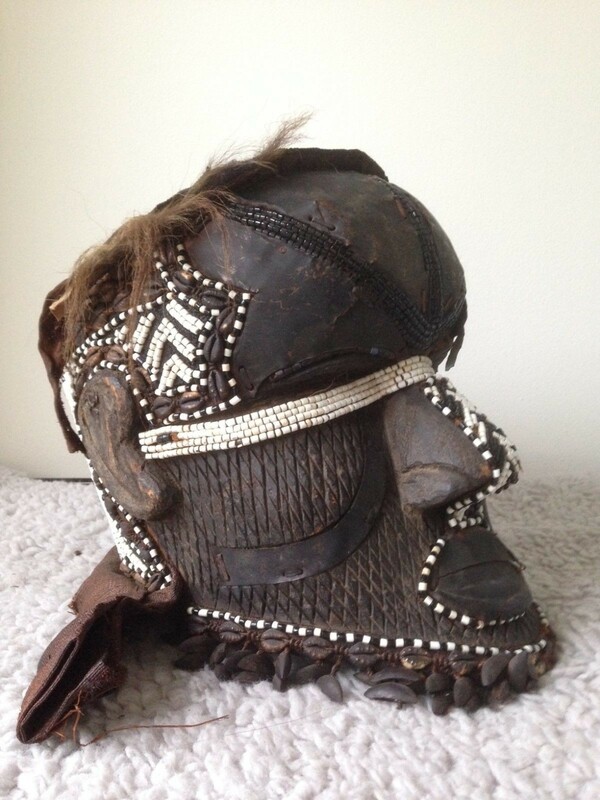 Size: 28 cm x 20 cm. 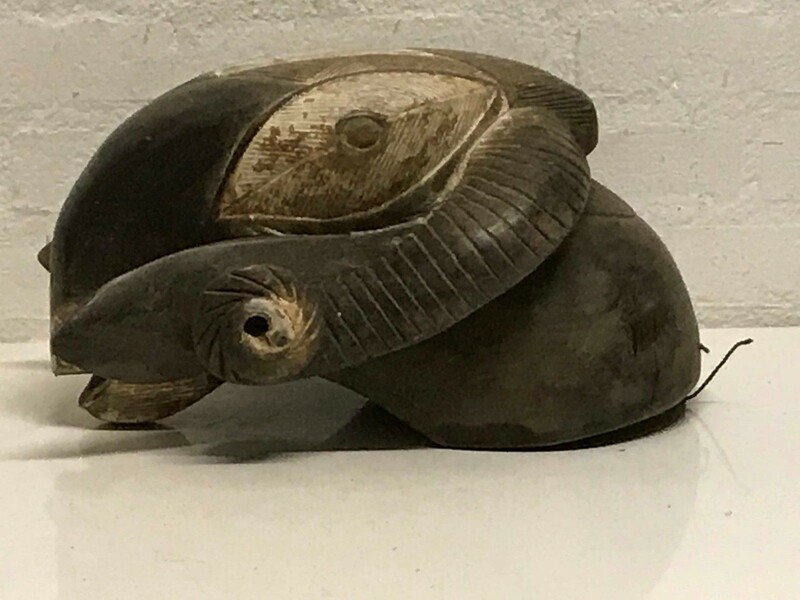 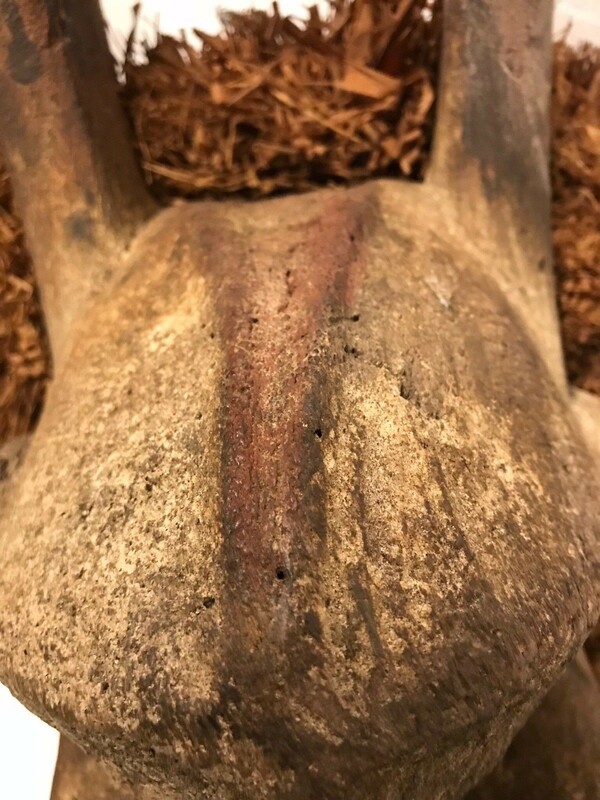 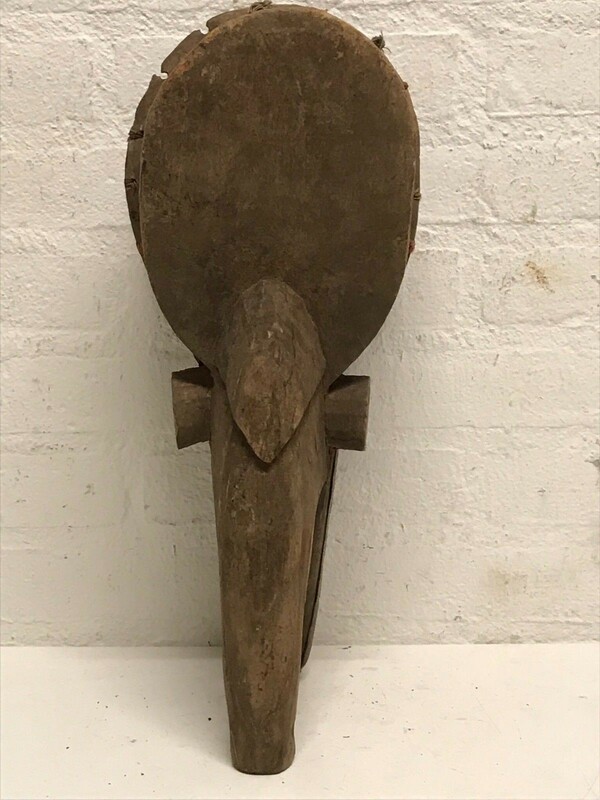 180905 - Old Tribal used African Bambara mask - Mali. 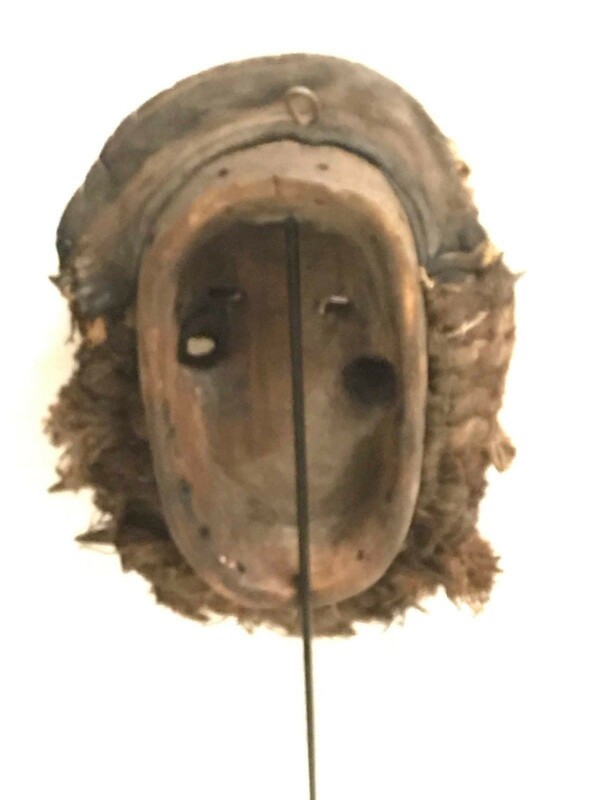 Mali: Tribal used African Bambara mask. 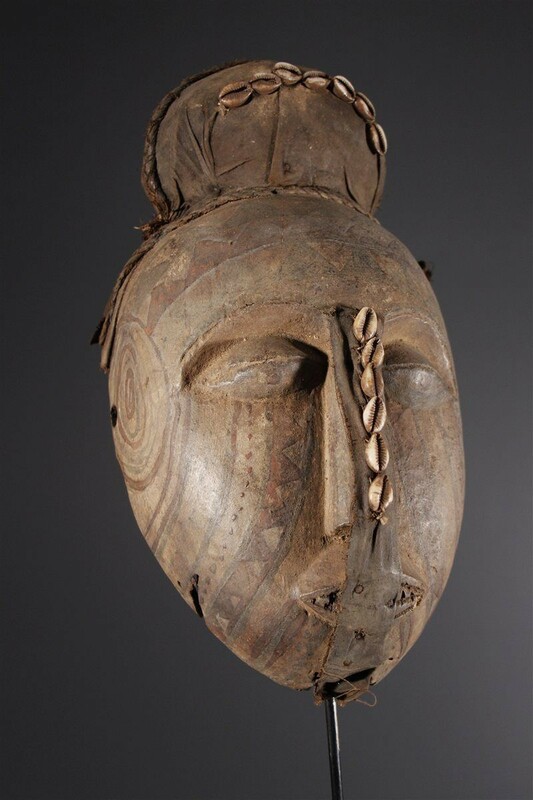 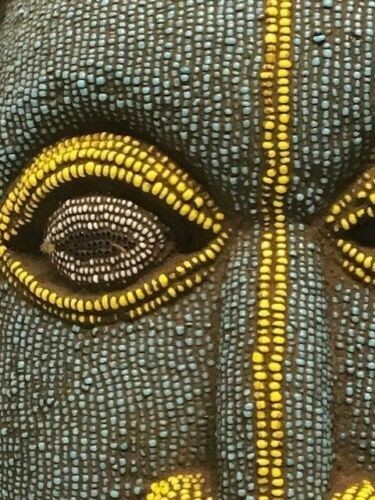 African mask from the Kuba, Congo. 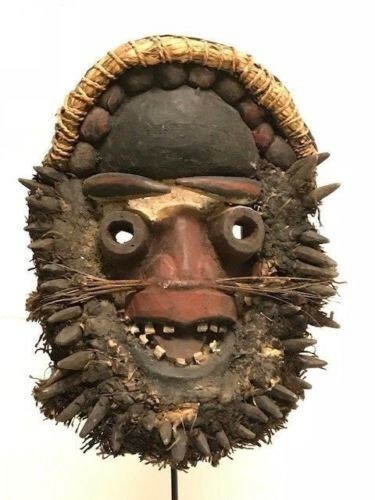 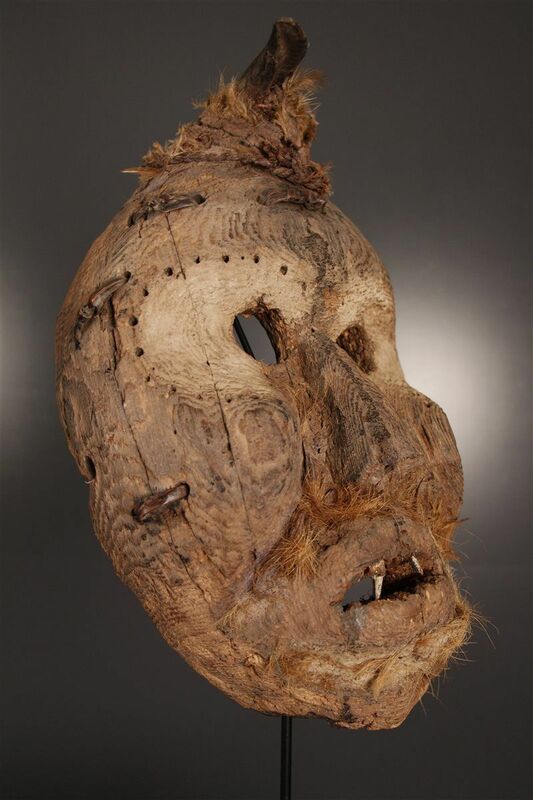 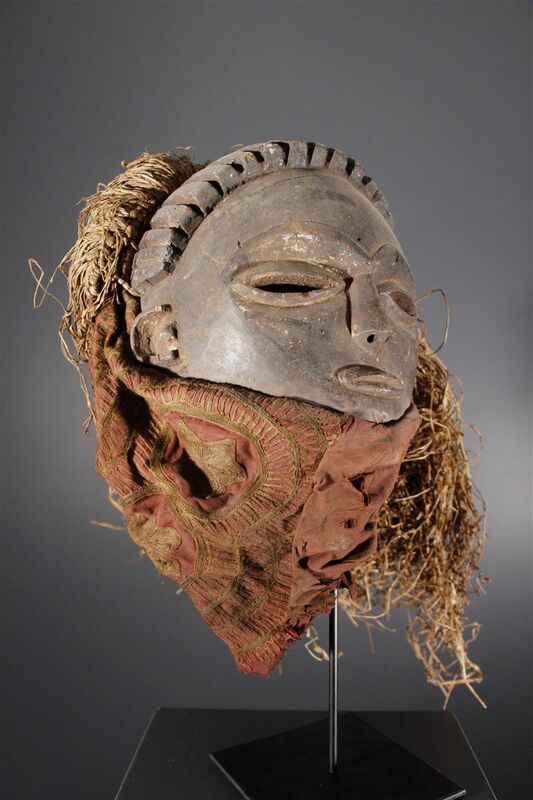 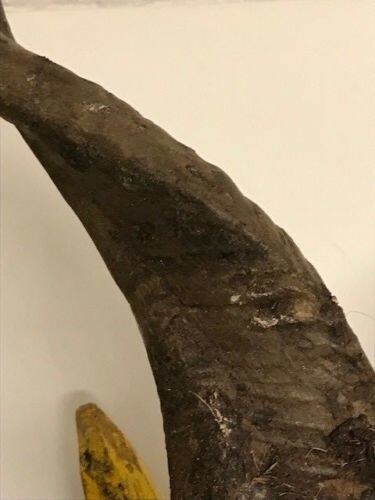 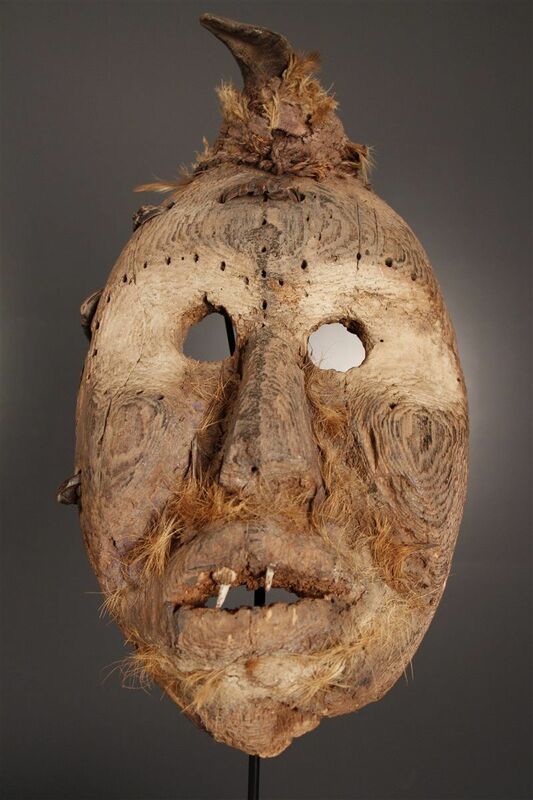 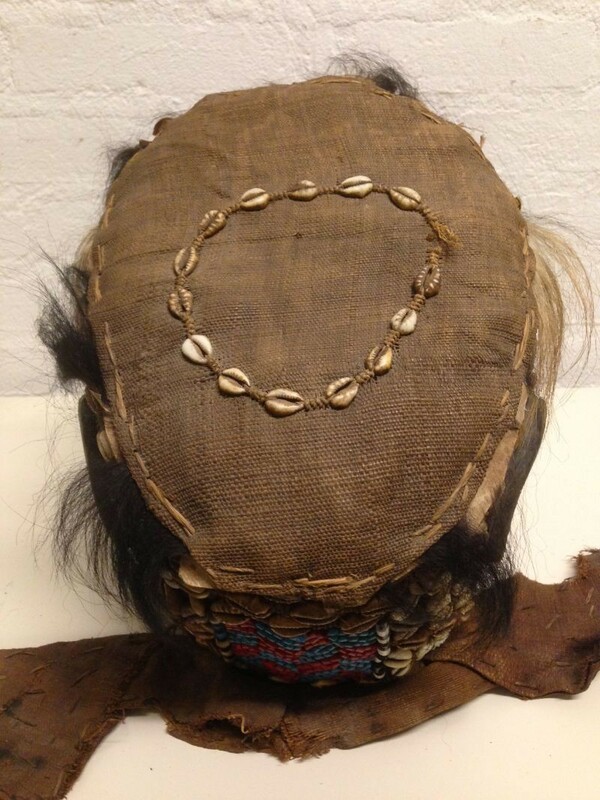 180110 - Old & Tribal used African Fang mask - Gabon. 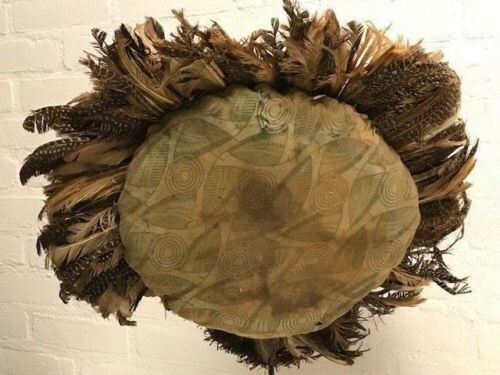 Tribal used Very expressive african mask with Raffia from the Fang, Gabon. 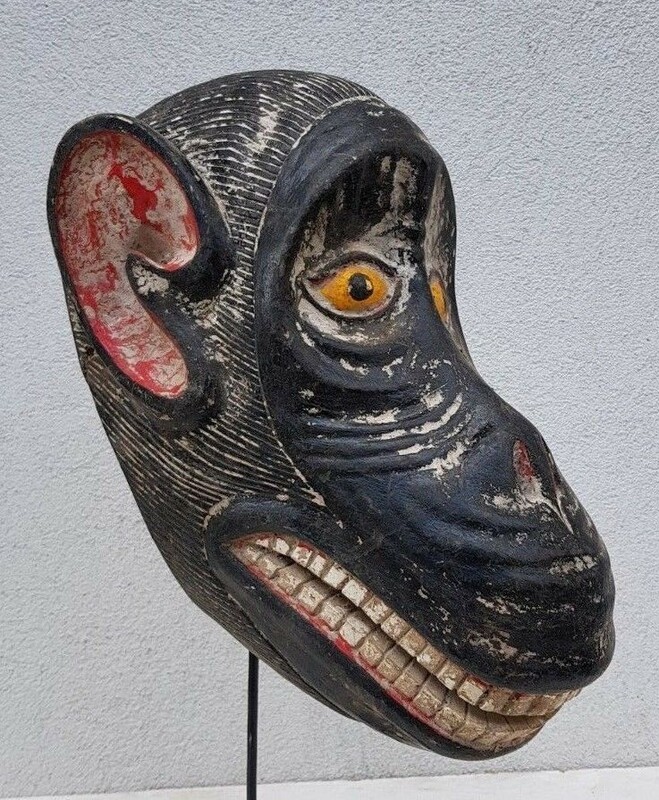 This type of mask is used for entertainment of the spectators on festive occasions. 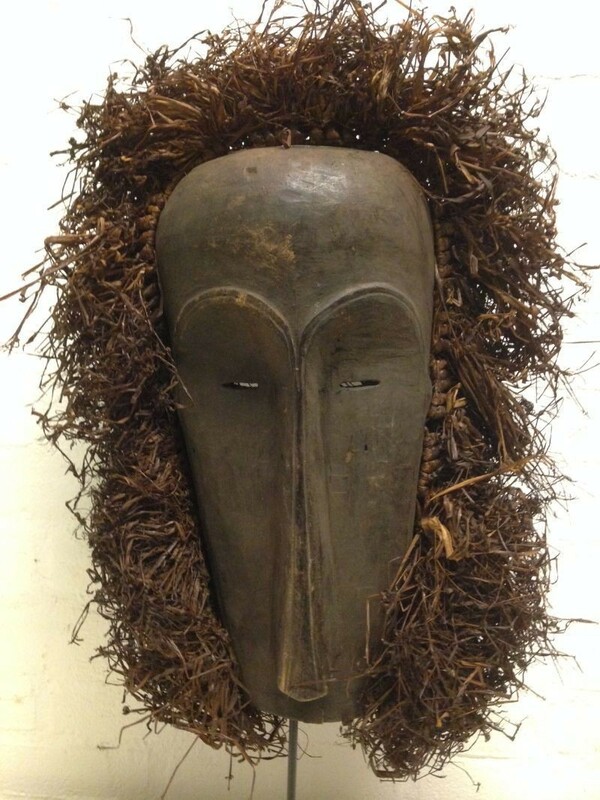 Hand carved from a single piece of wood, with color pigments, raffia fibres. 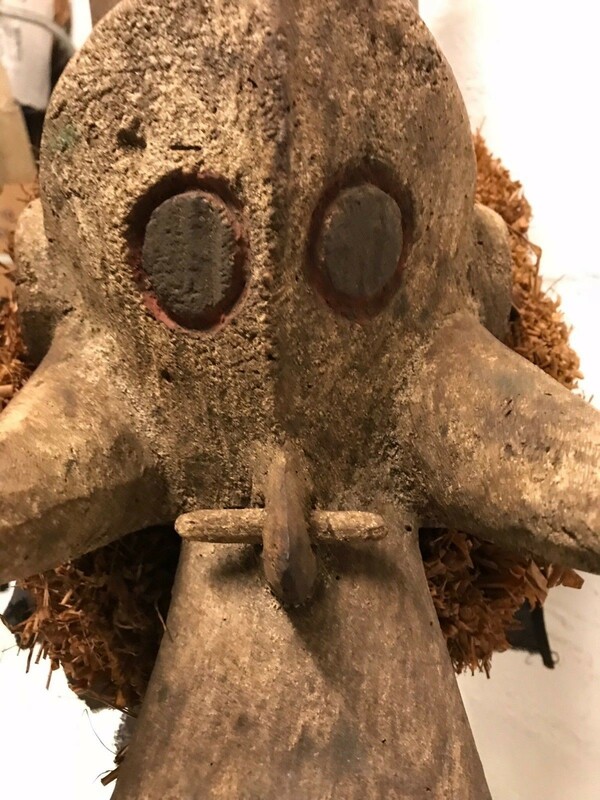 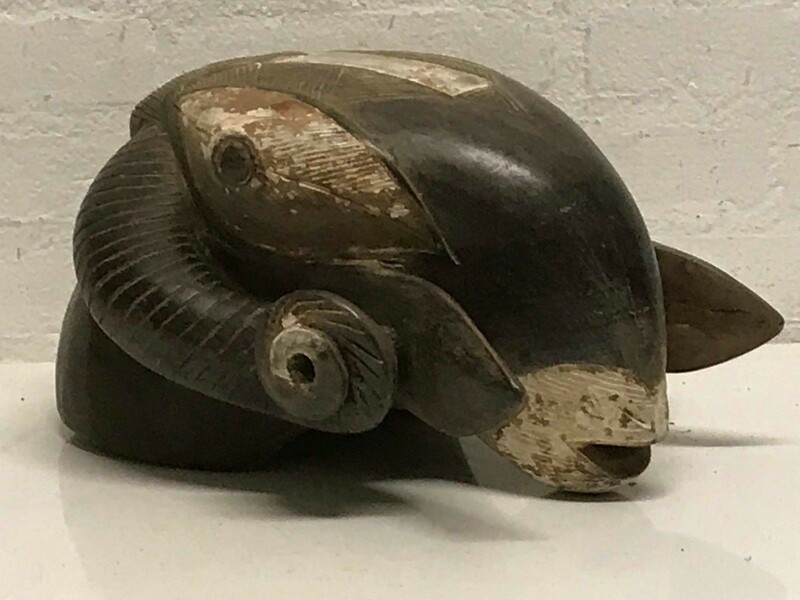 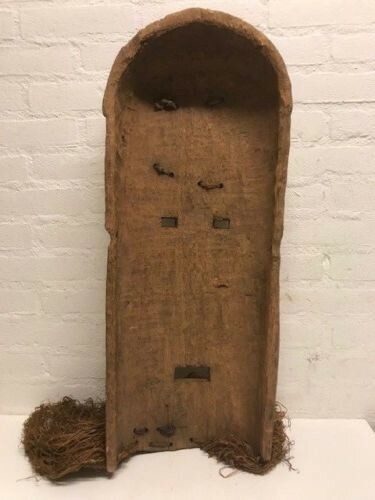 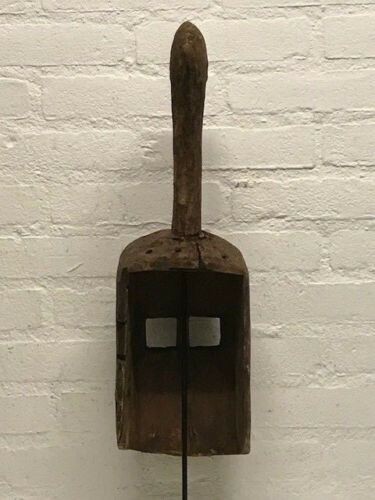 180830 - Old Tribal used African Bambara mask - Mali. 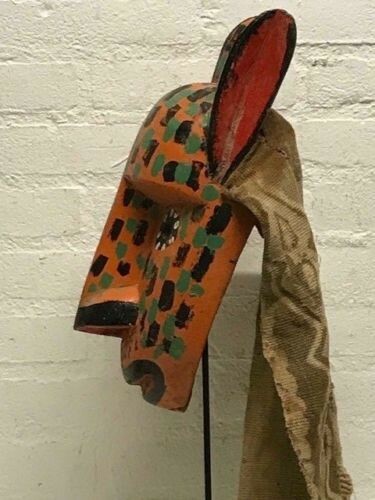 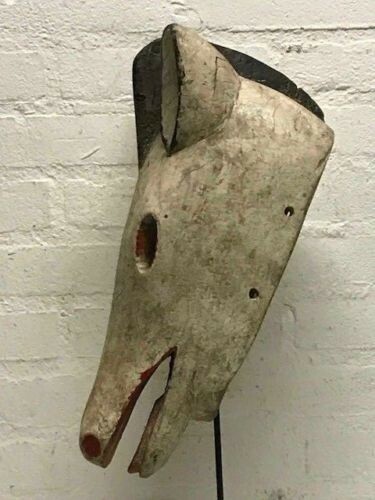 Old Tribal used Bambara Animal mask from Mali. 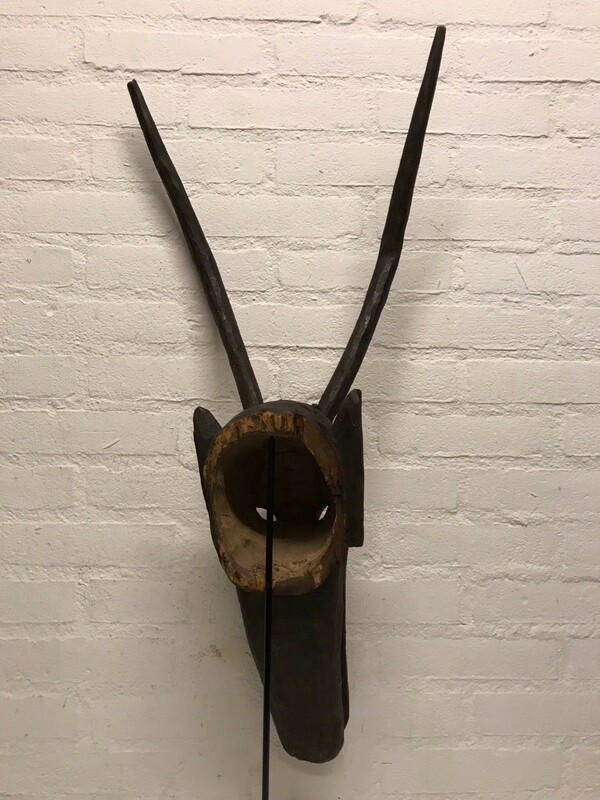 Hand carved from wood, carved decoration and with real horns. 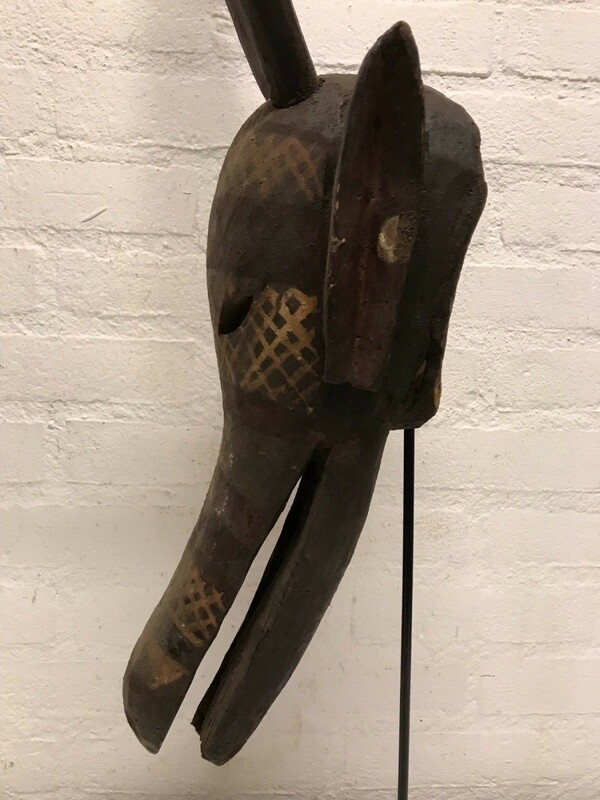 180211 - Old & Tribal used African Markha mask - Mali. 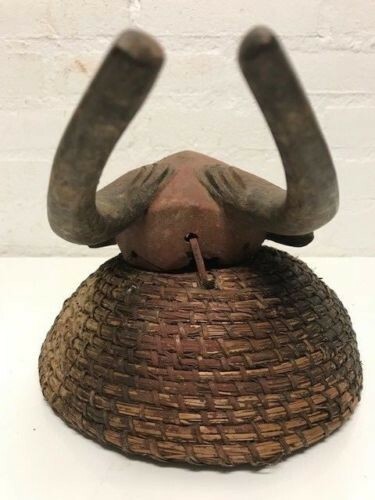 Mali: Large Rare Tribal used African Markha mask. 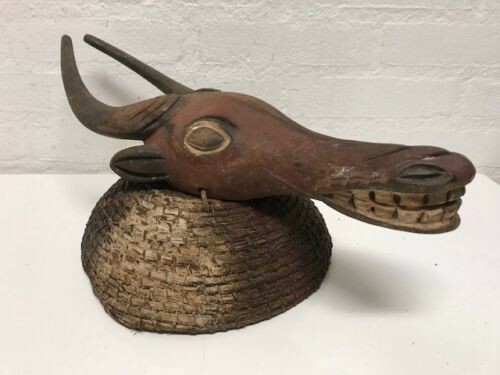 180334 - Tribal Used Bamileke buffalo Mask - Cameroon. 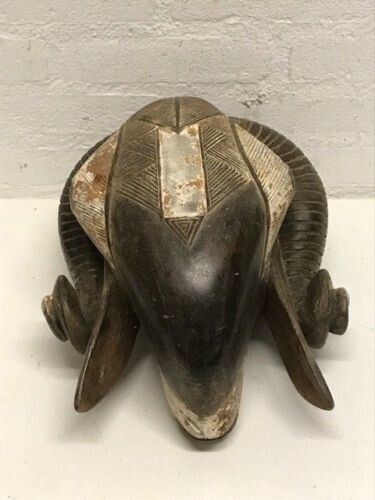 Tribal used Expressive african buffalo mask from the Bamileke, Grasfields Cameroon. 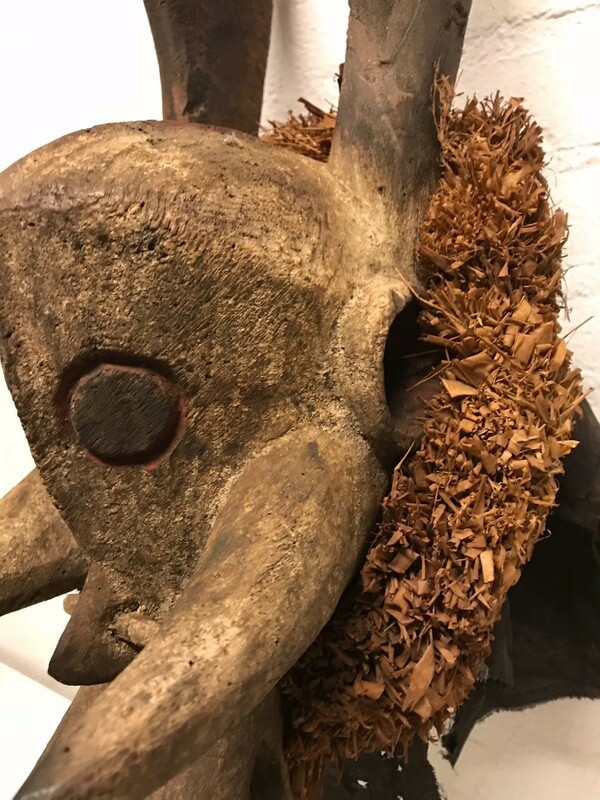 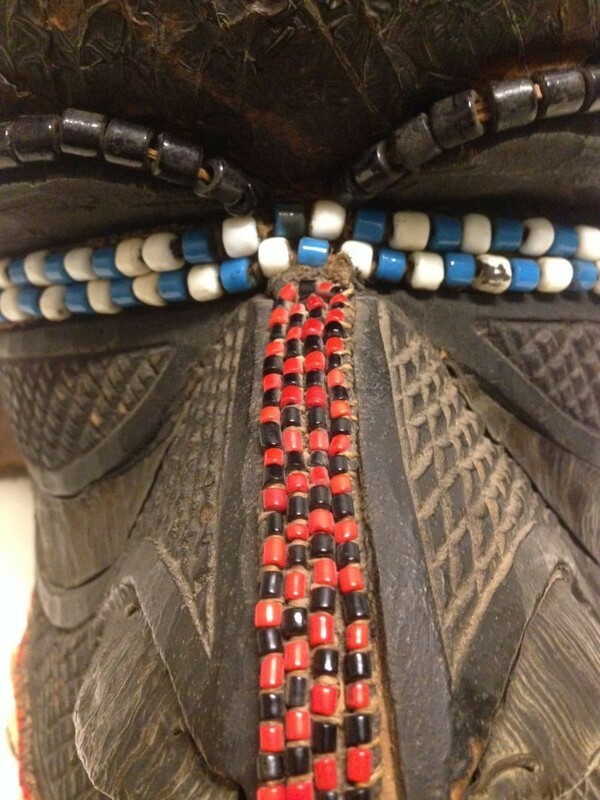 Buffalo masks portray strength and power. 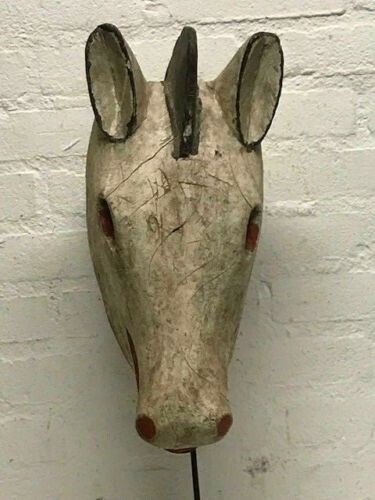 Hand carved from a single piece of wood witn rare basket. 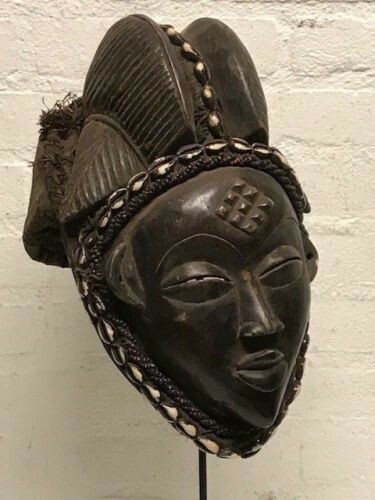 181001 - Old Tribal Used African Mask from the Dan Nguerre - Liberia.